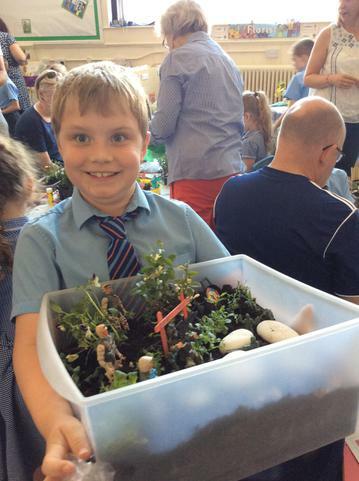 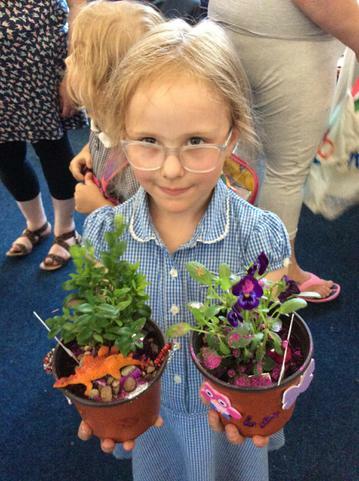 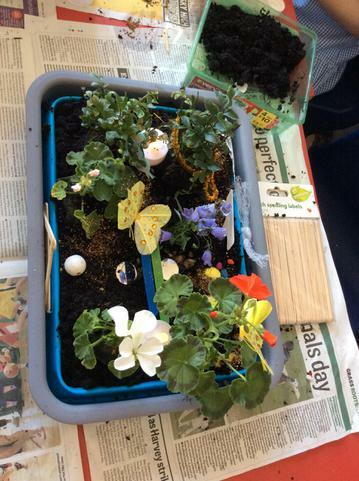 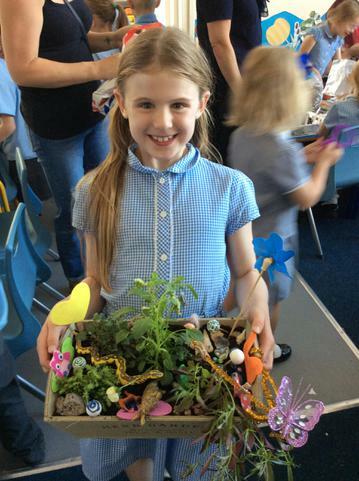 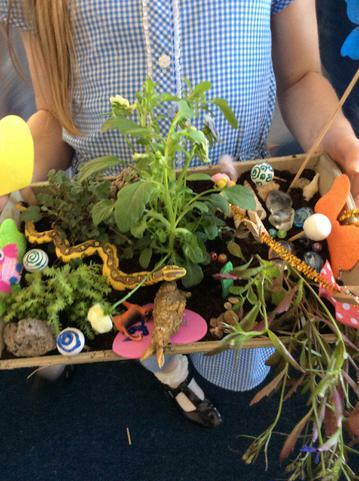 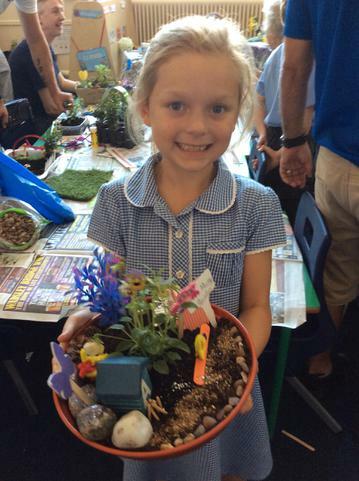 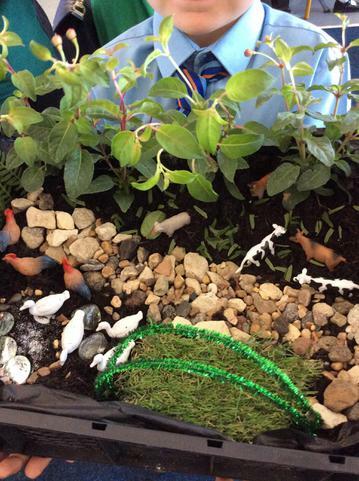 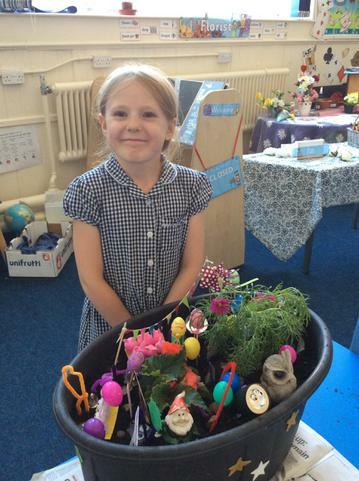 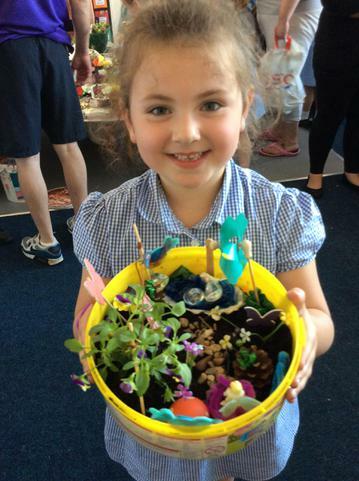 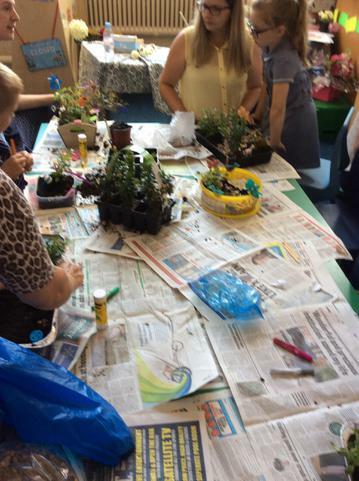 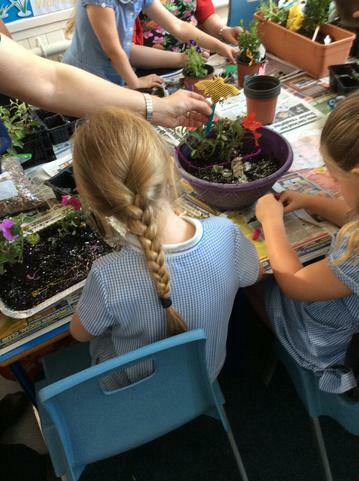 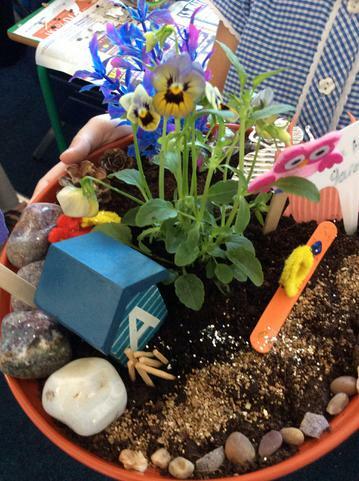 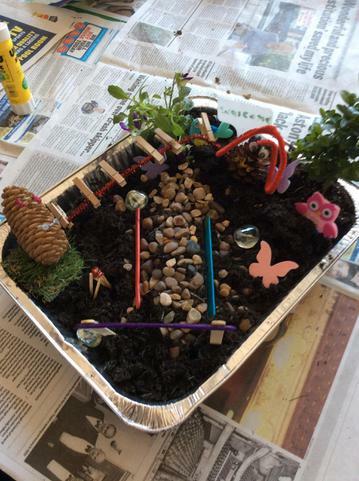 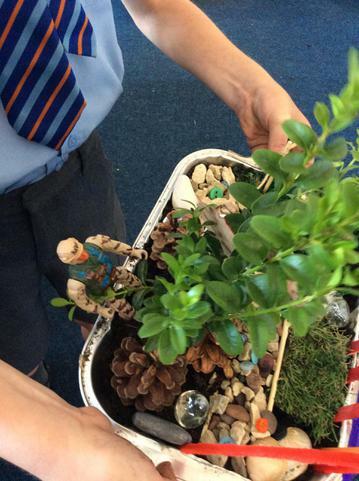 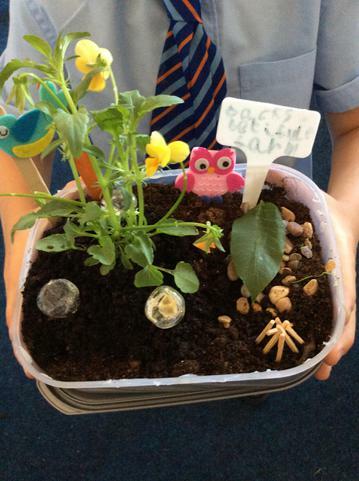 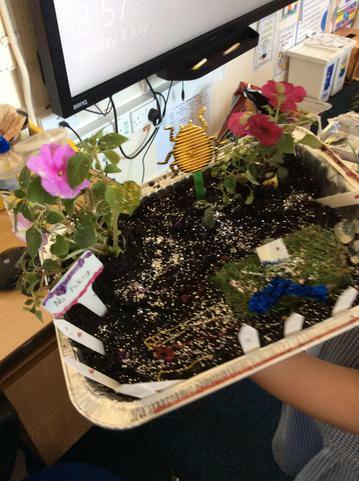 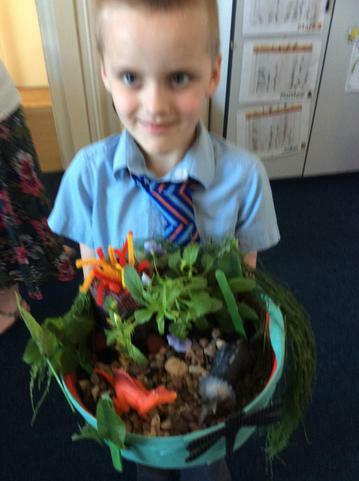 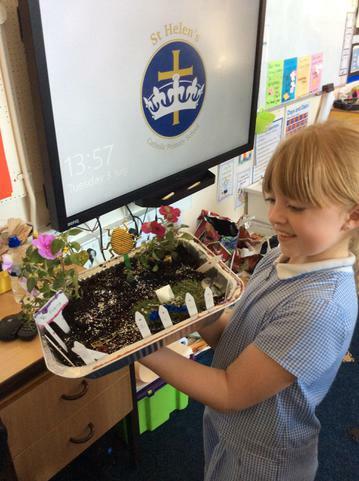 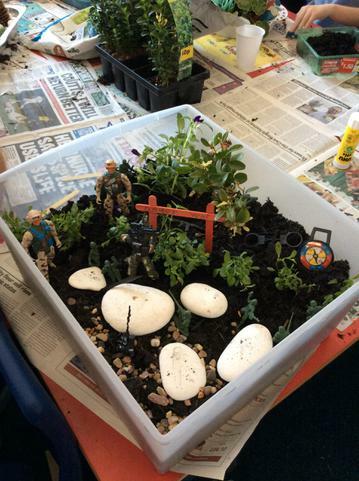 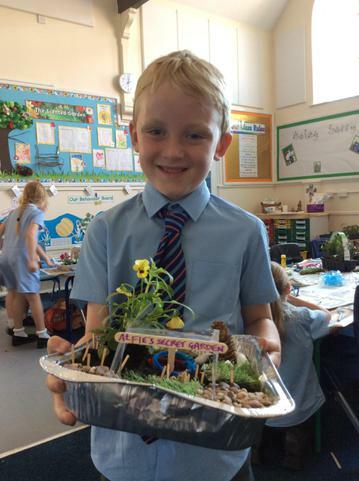 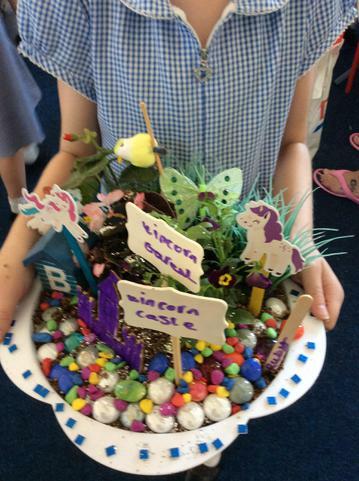 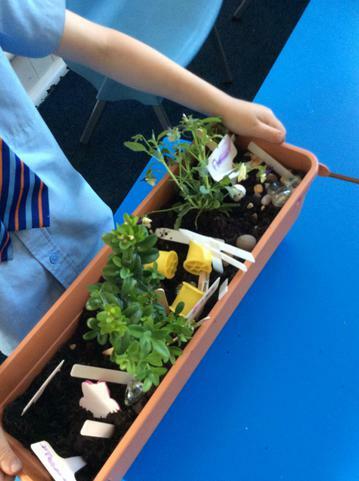 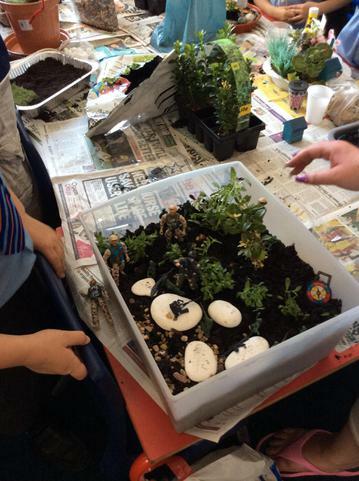 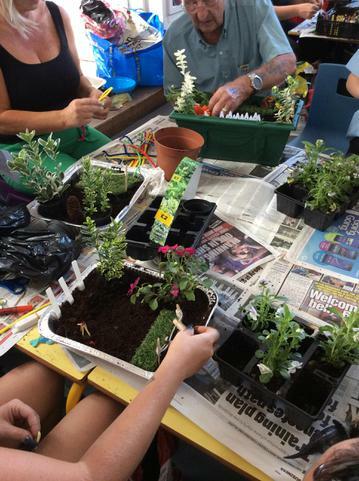 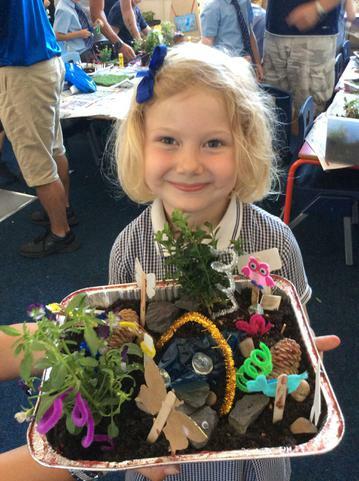 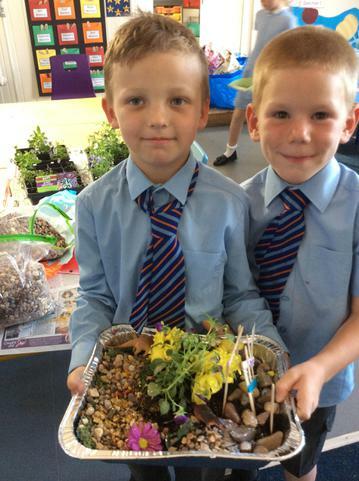 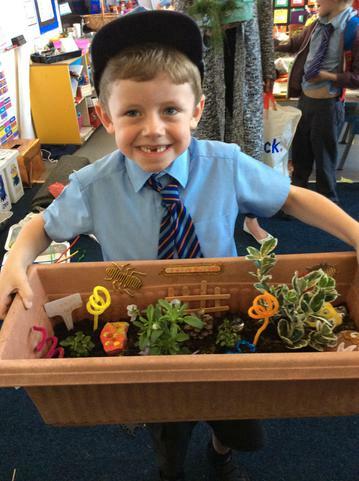 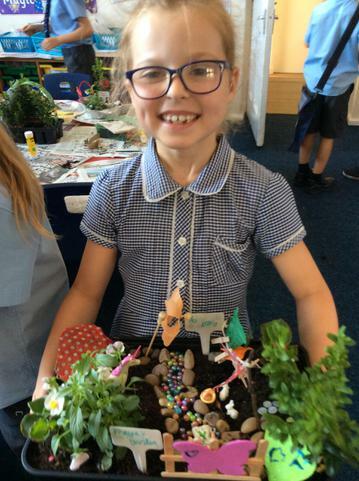 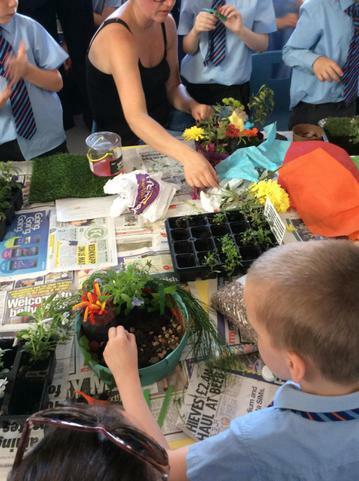 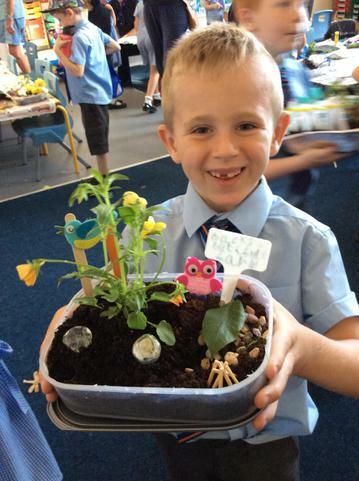 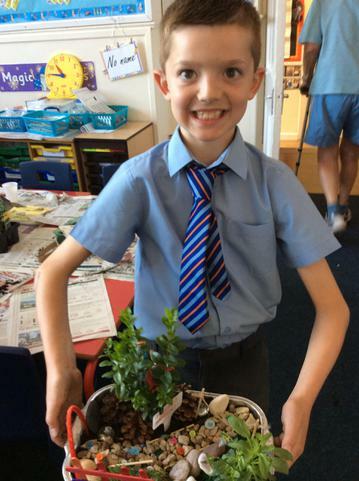 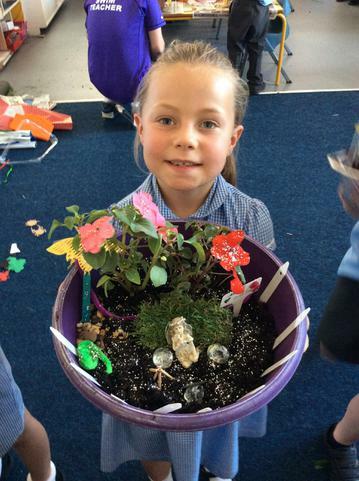 This Tuesday afternoon, Class 2 were very lucky to have the help of their parents and families to make their own miniature gardens! 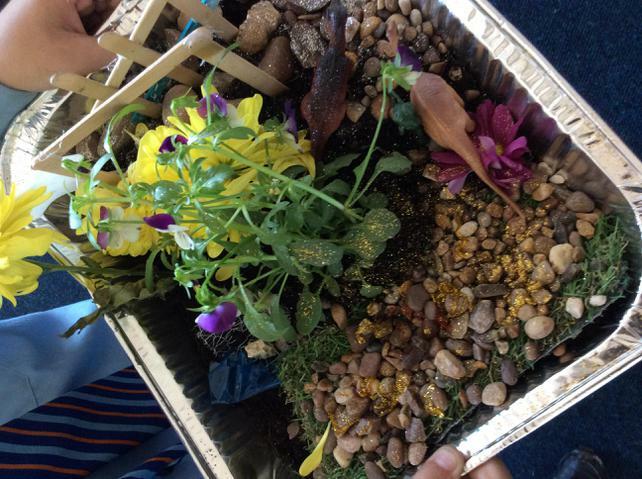 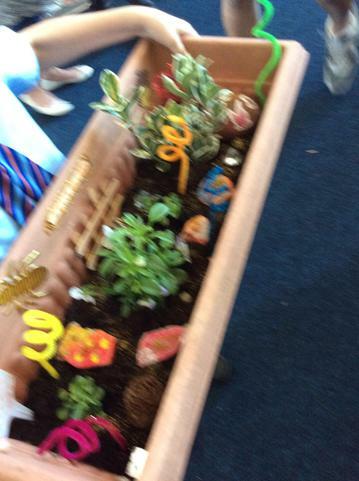 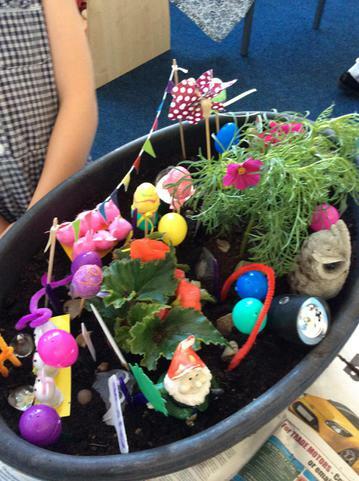 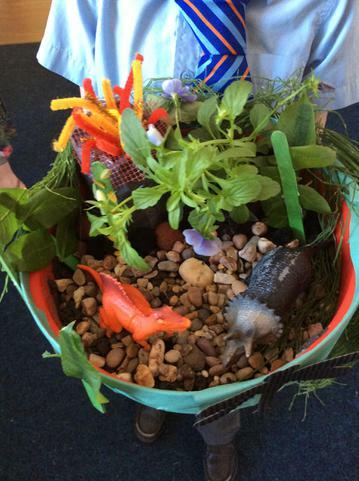 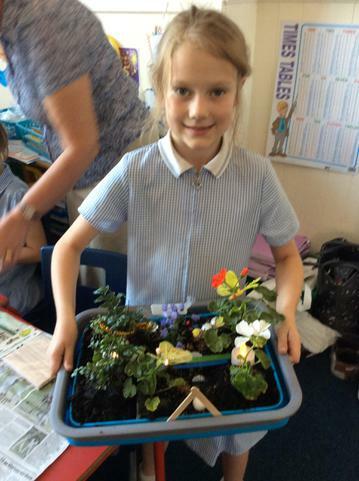 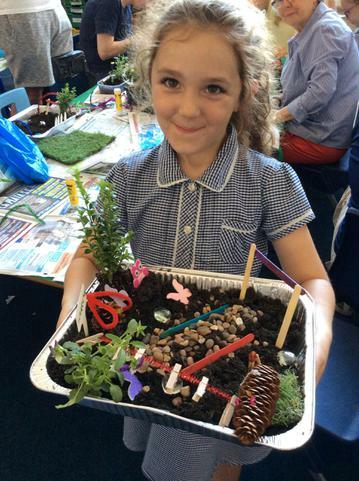 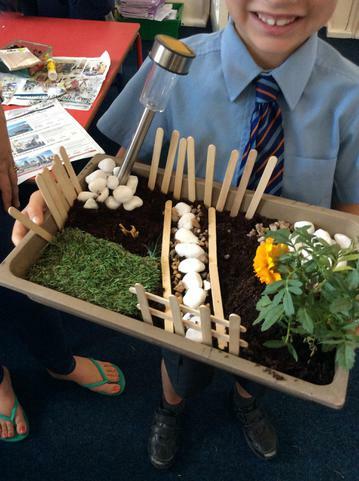 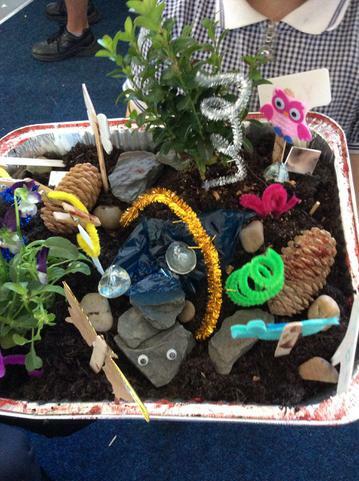 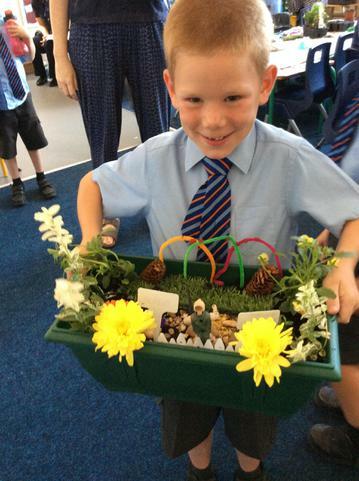 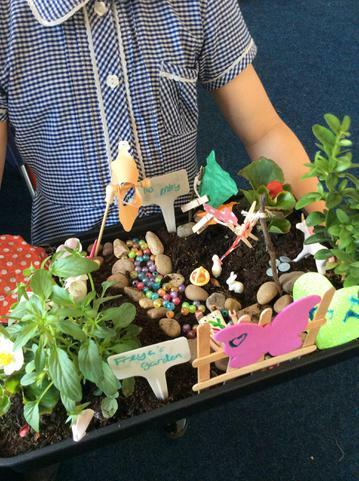 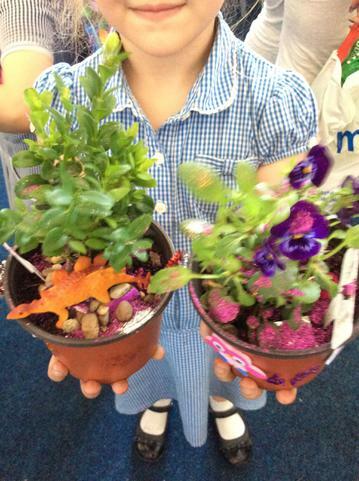 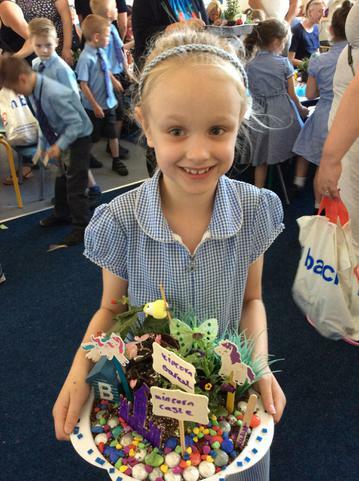 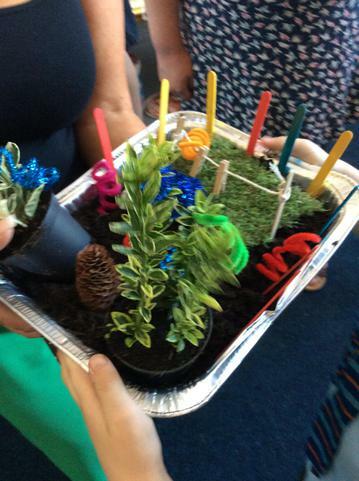 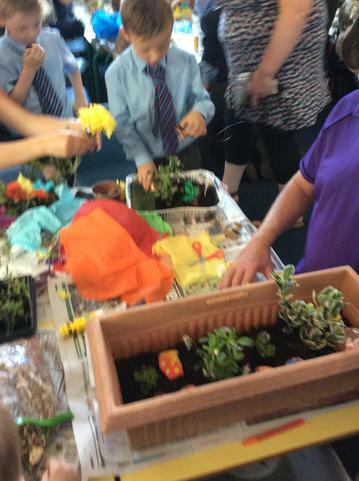 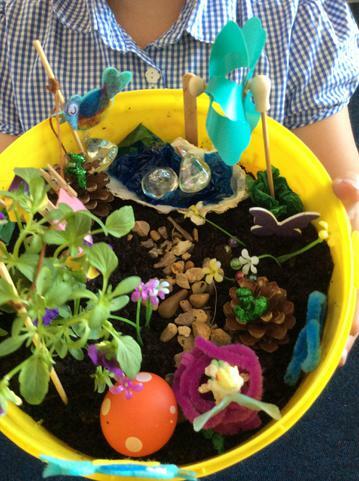 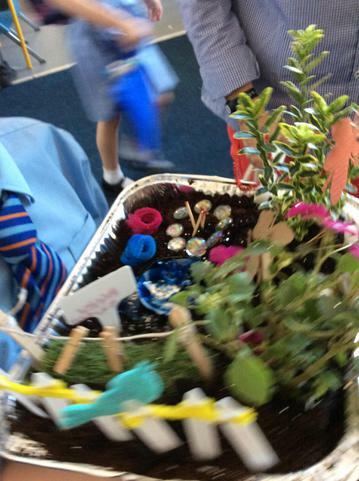 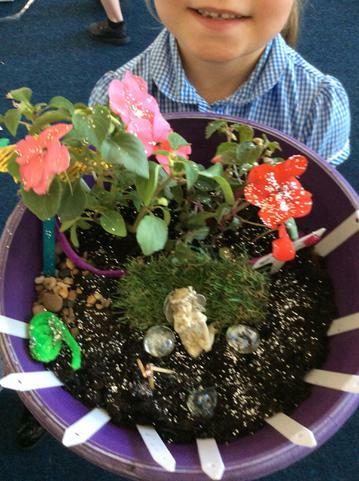 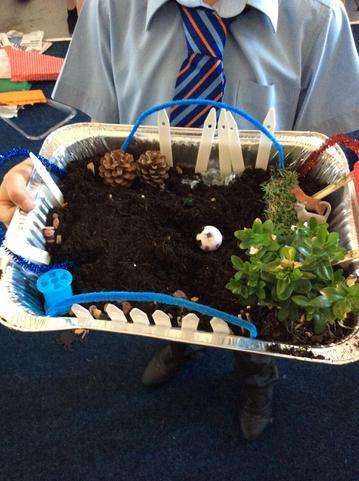 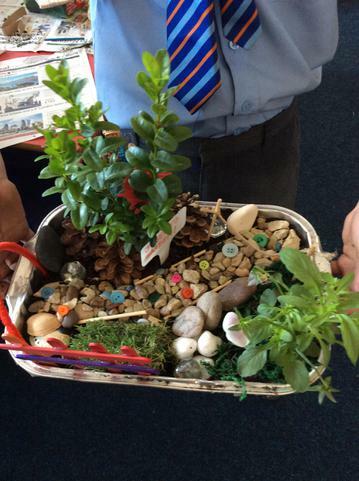 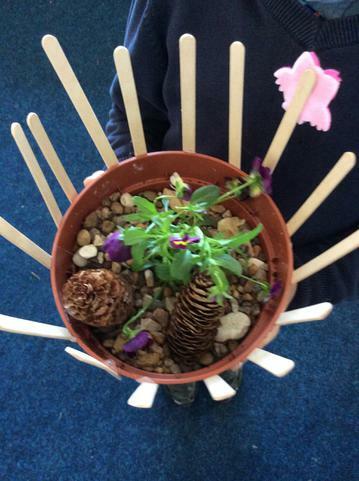 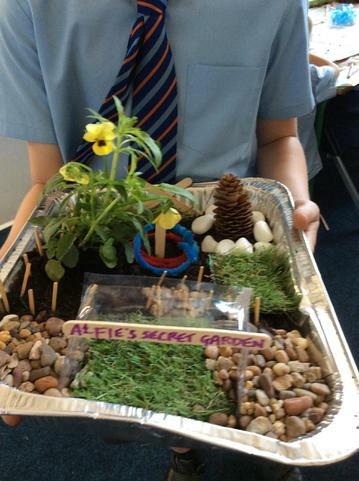 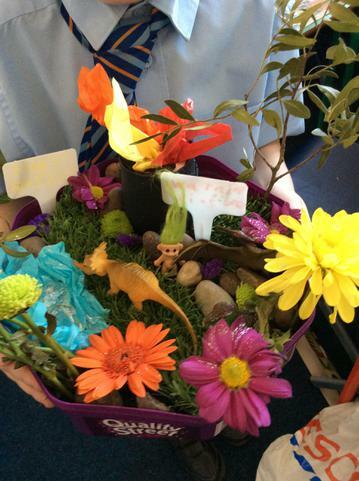 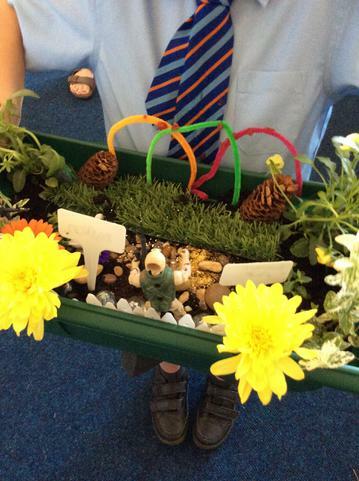 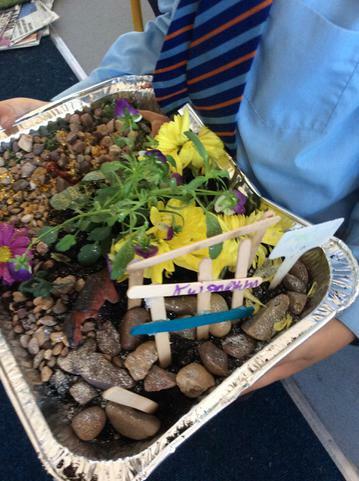 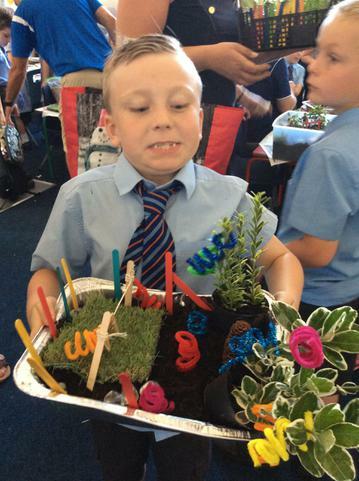 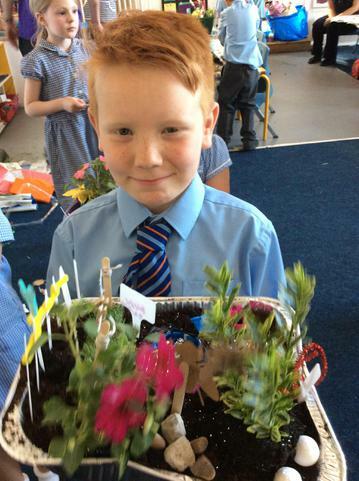 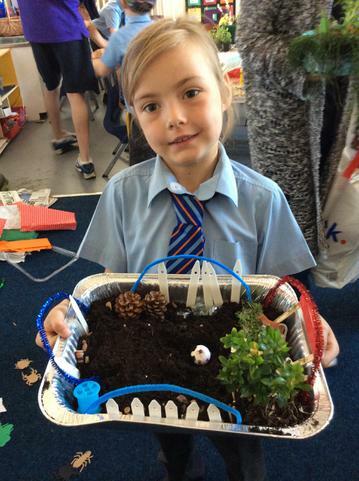 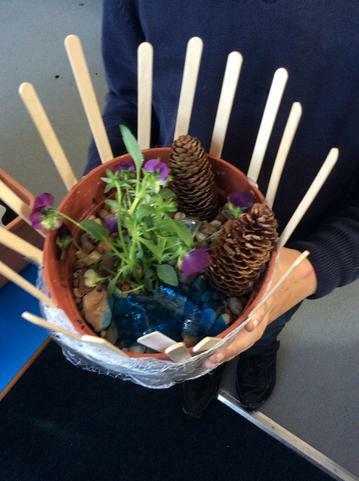 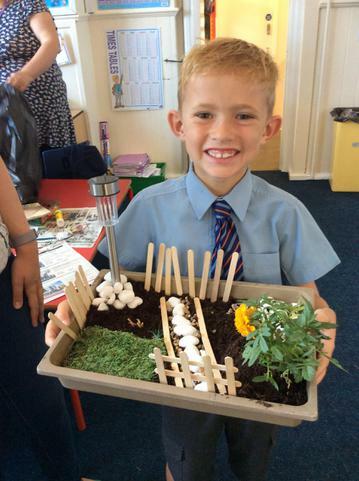 We had a fantastic time and created some beautiful gardens which link with our Scented Garden topic. 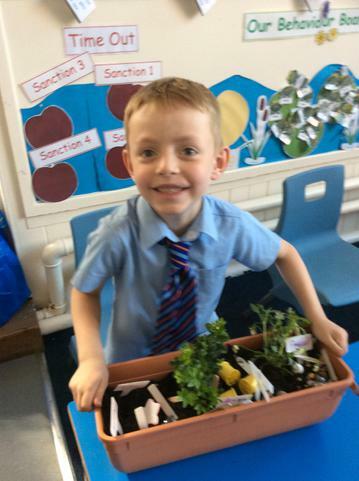 Well done to everyone in Class 2 on their creations and thank you to all that came along to help us! 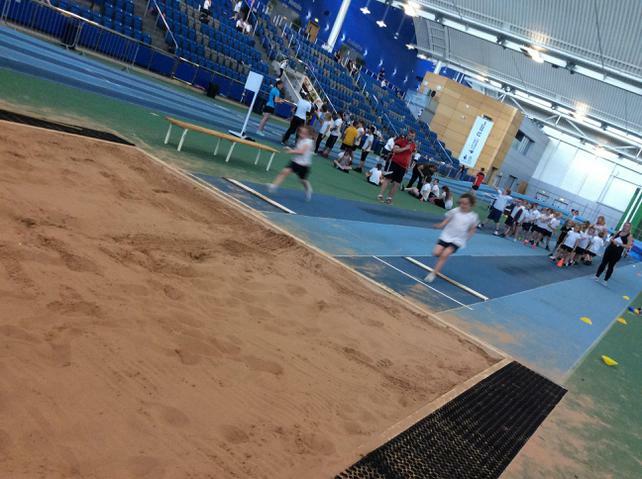 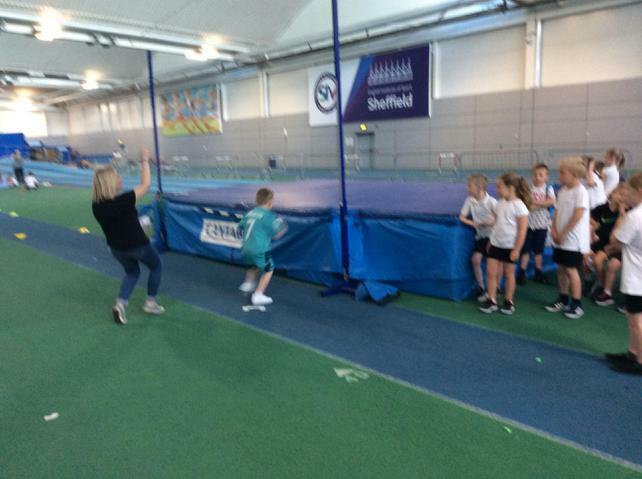 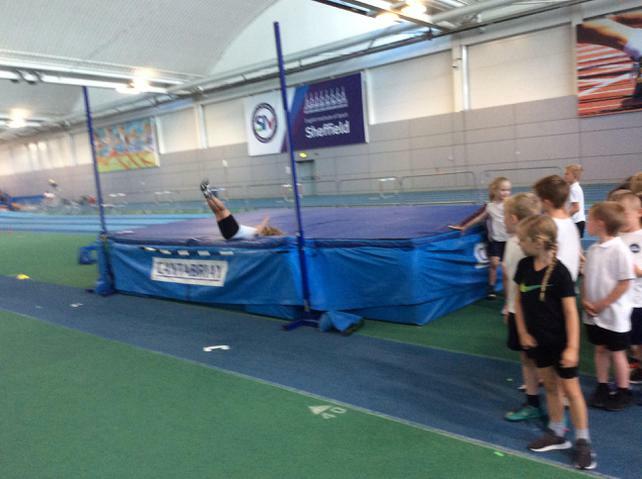 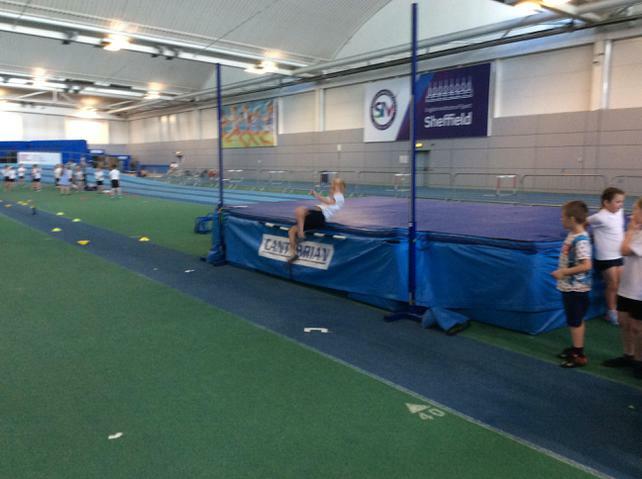 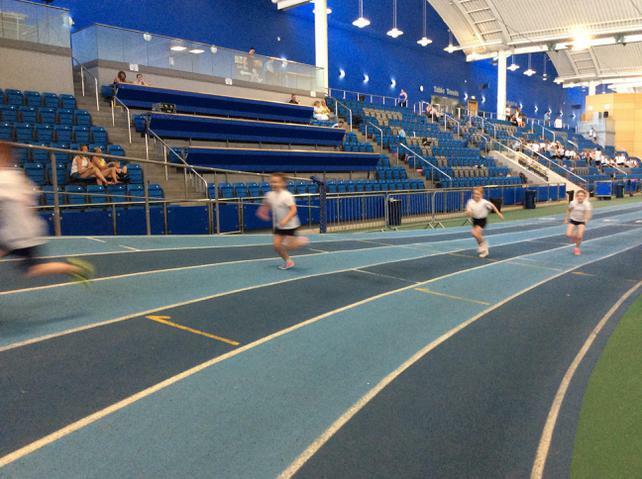 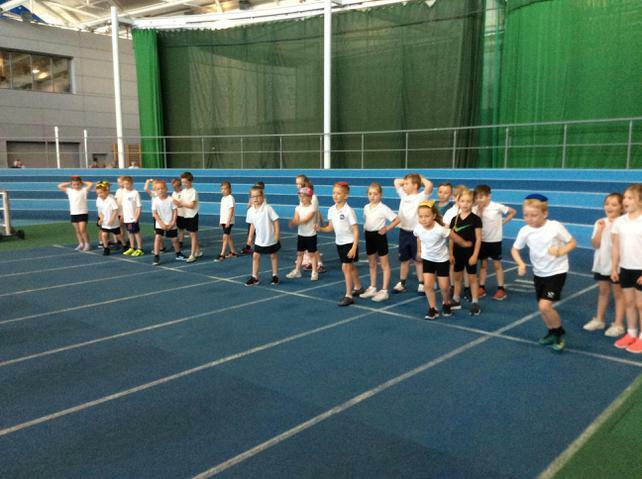 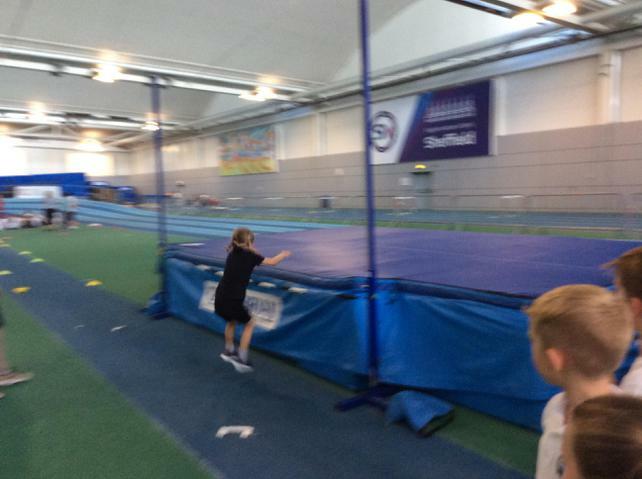 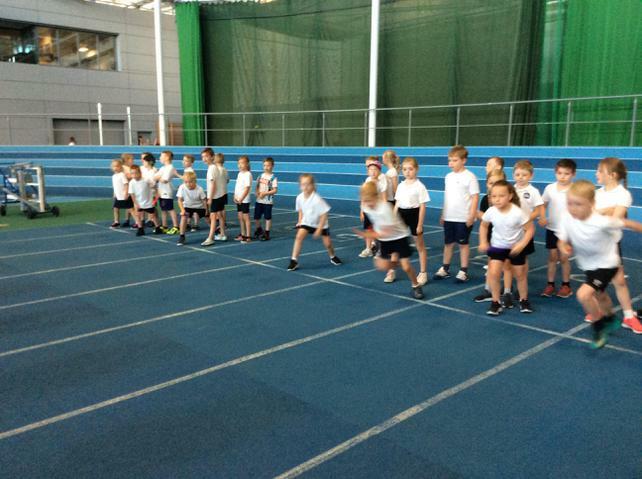 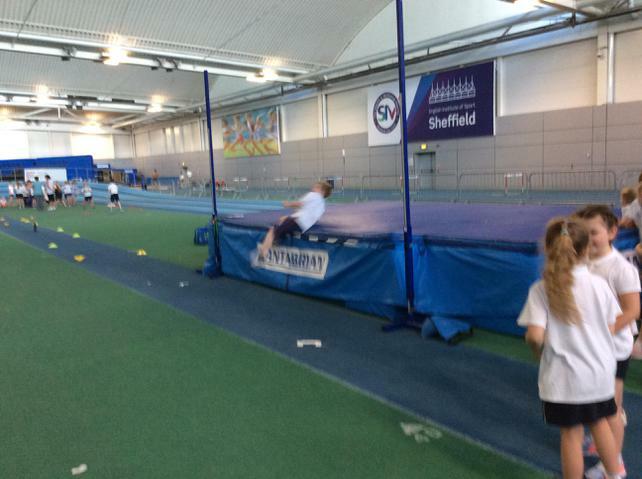 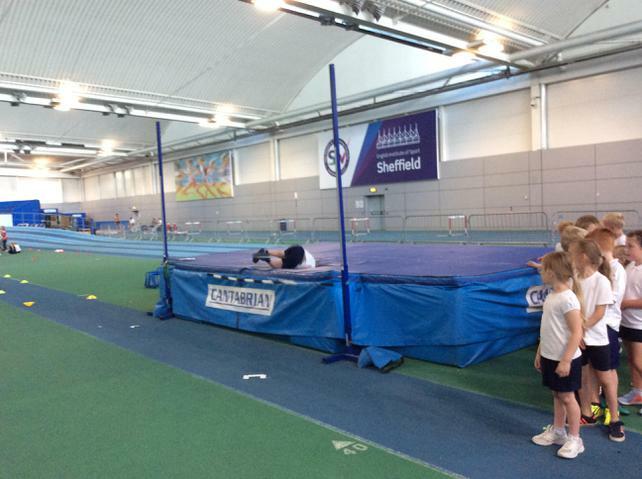 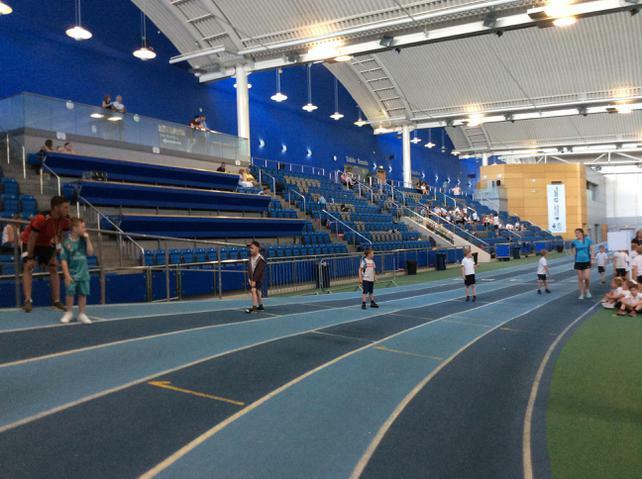 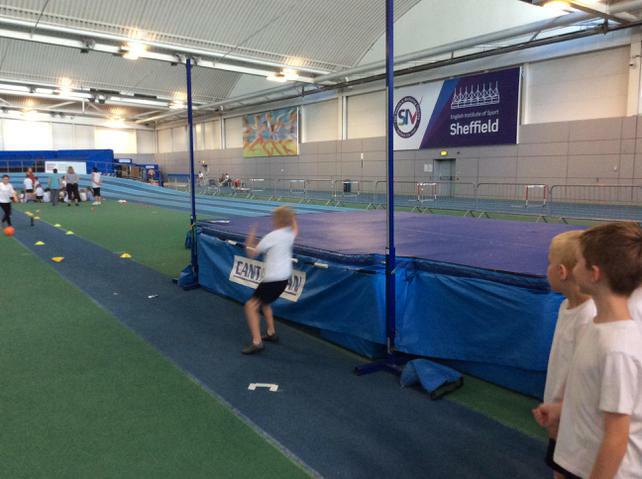 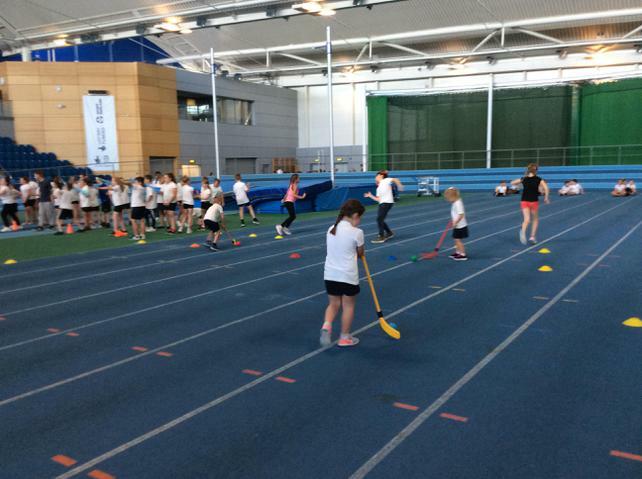 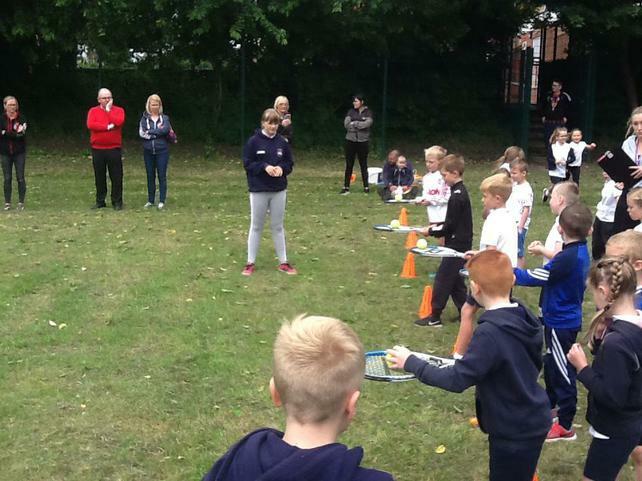 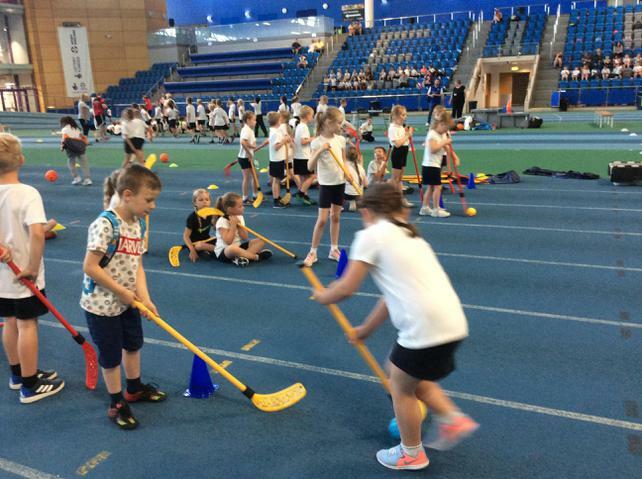 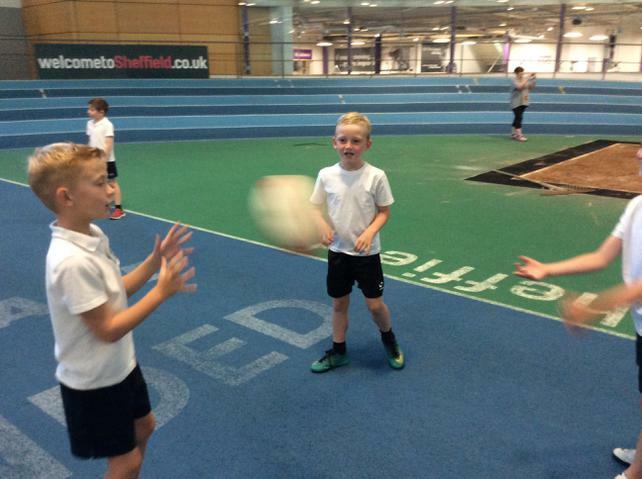 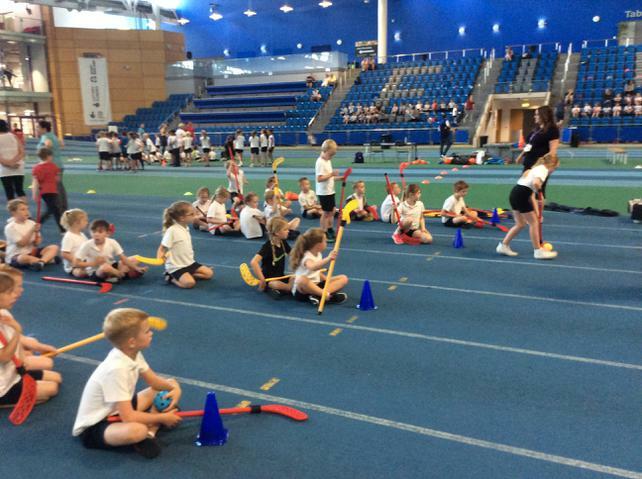 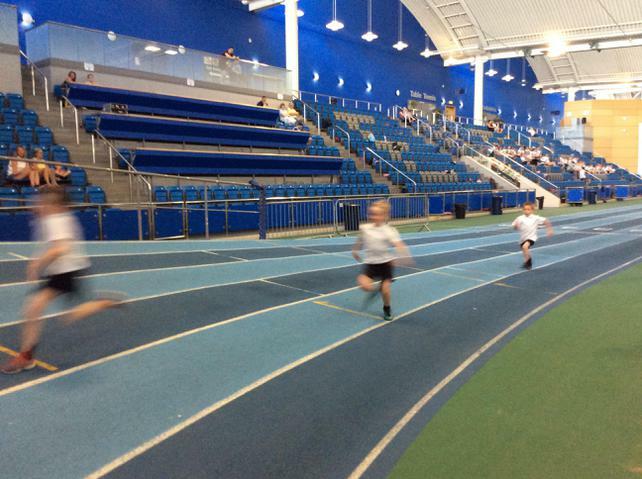 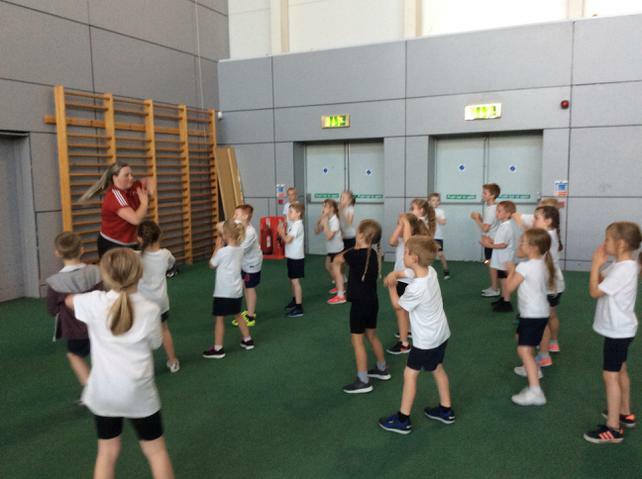 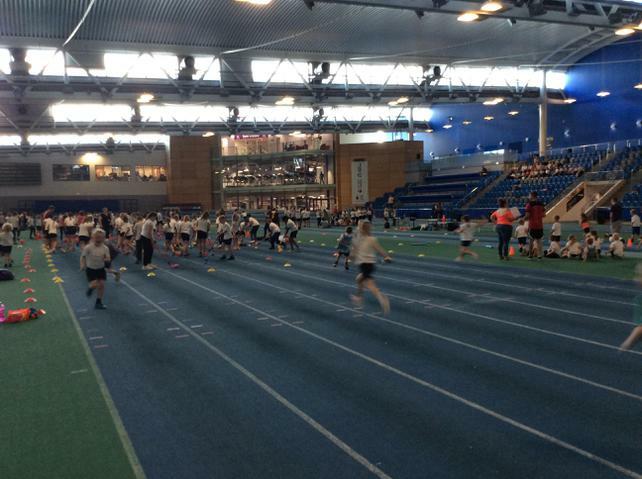 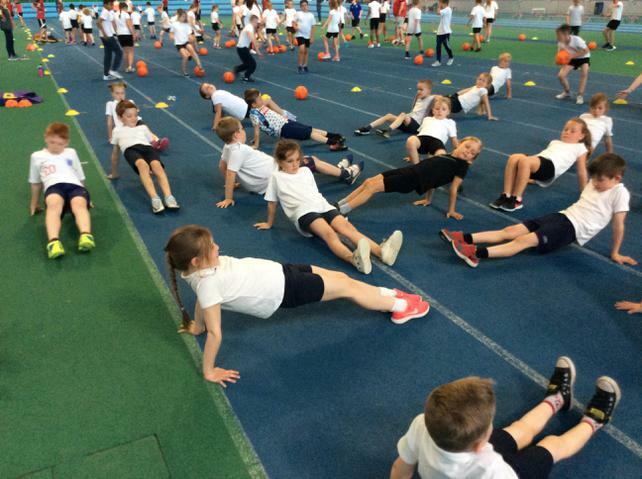 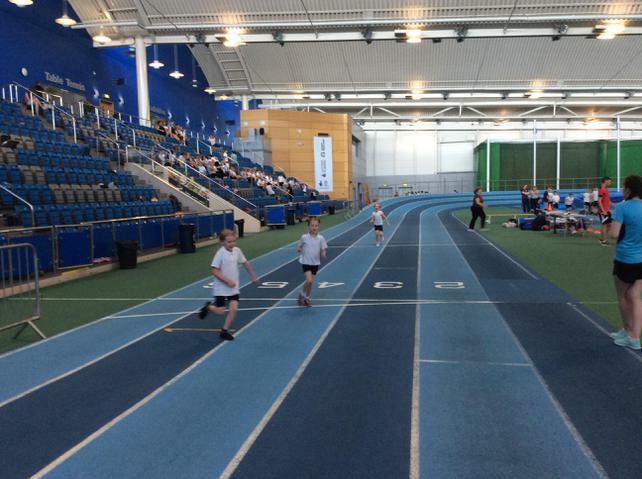 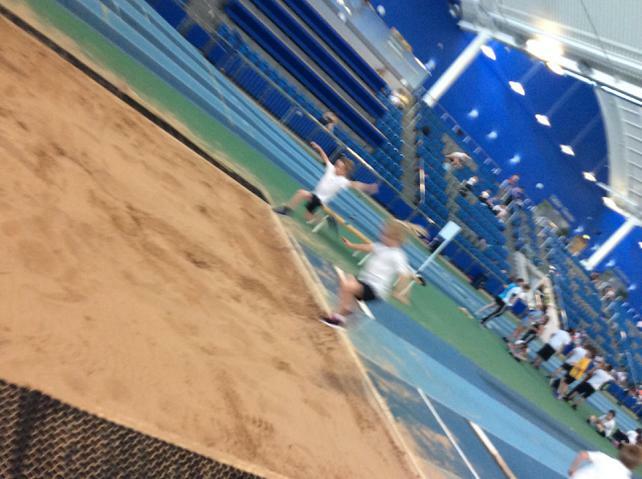 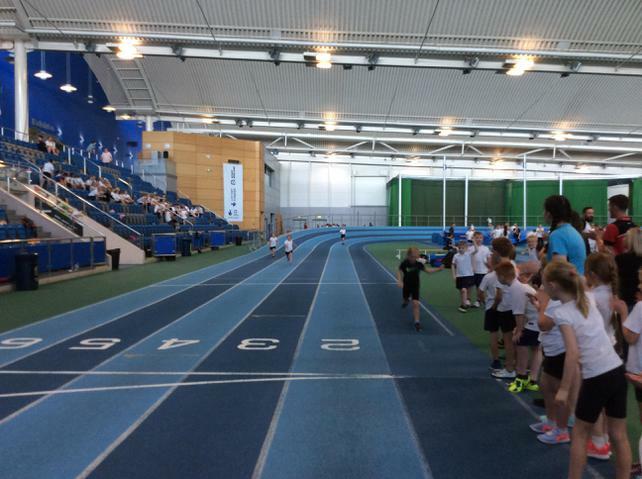 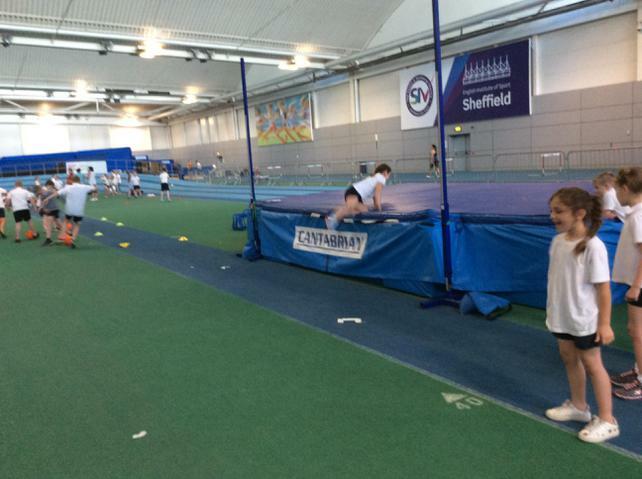 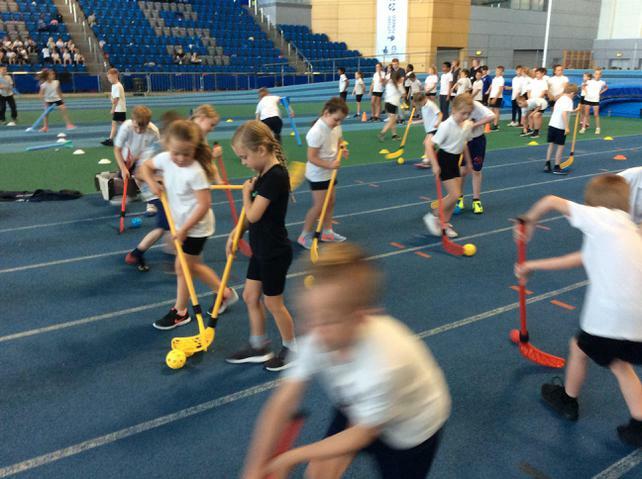 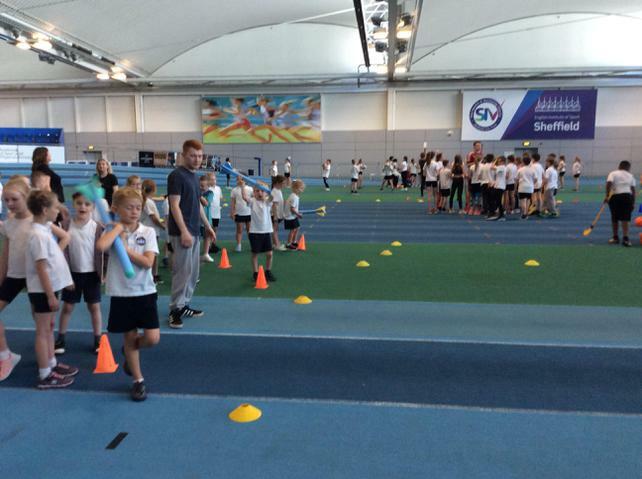 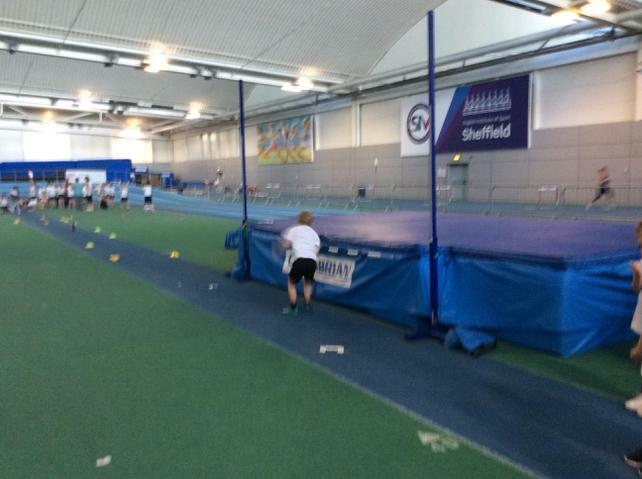 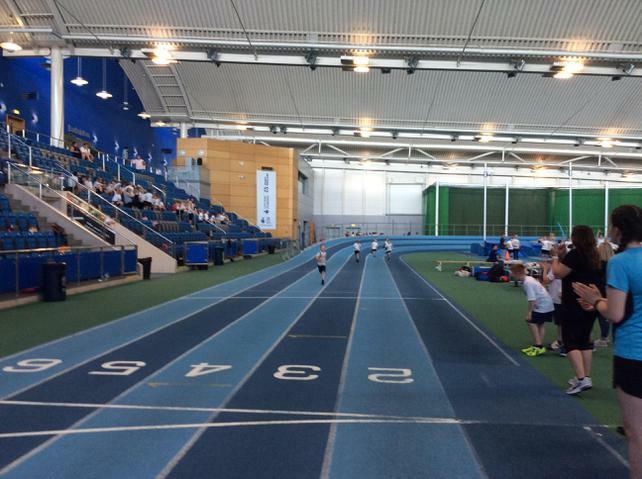 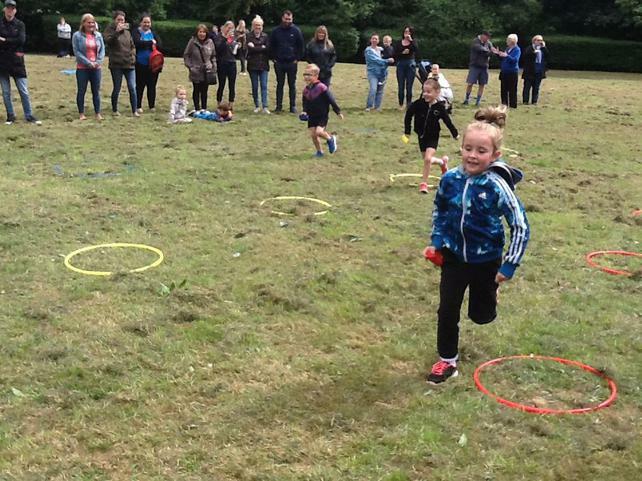 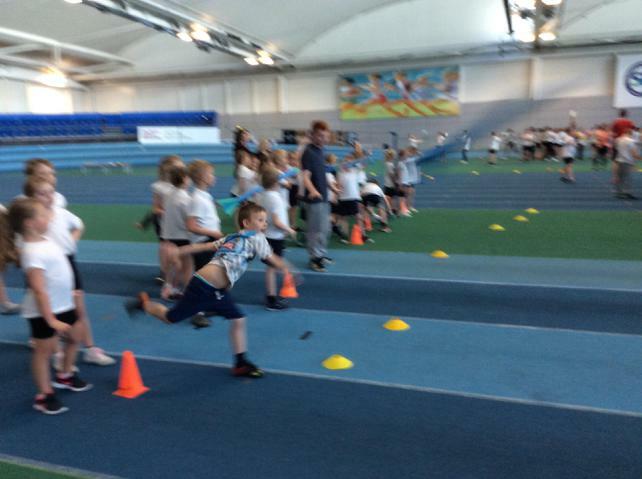 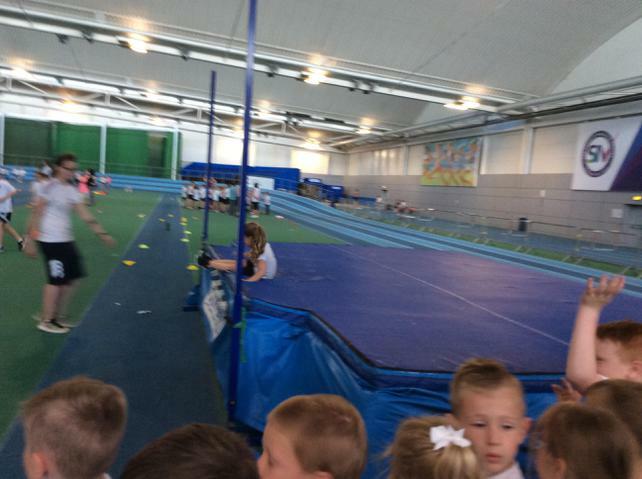 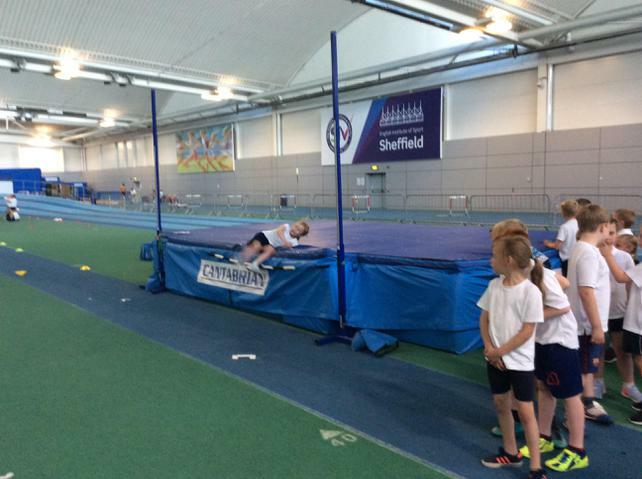 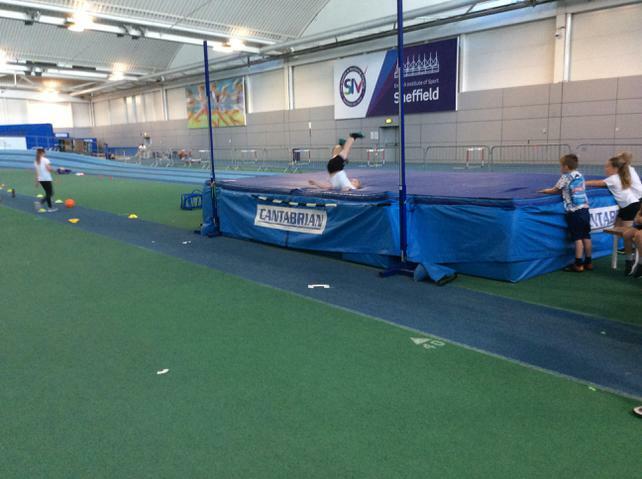 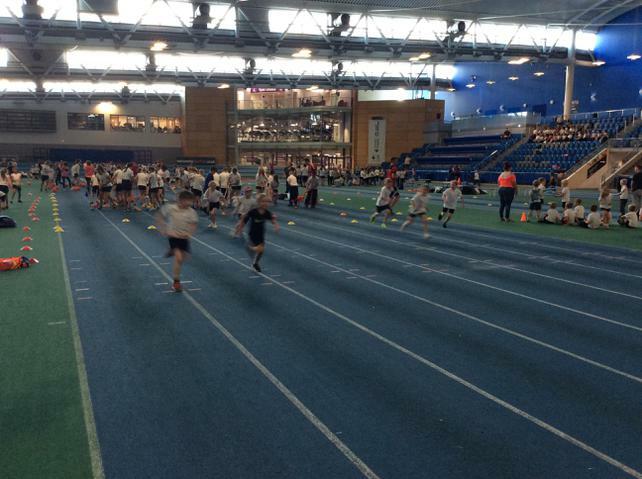 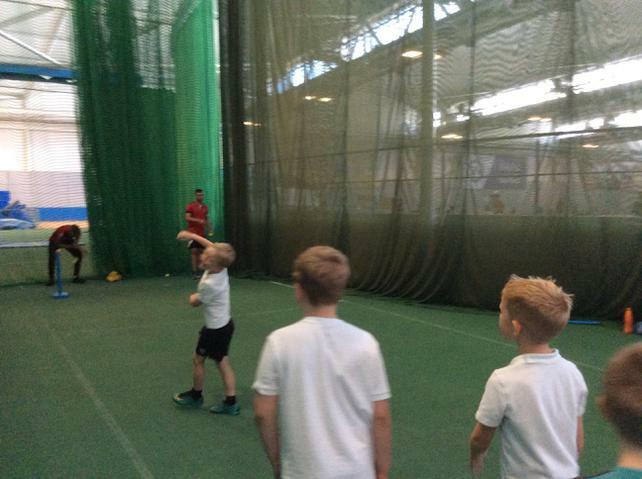 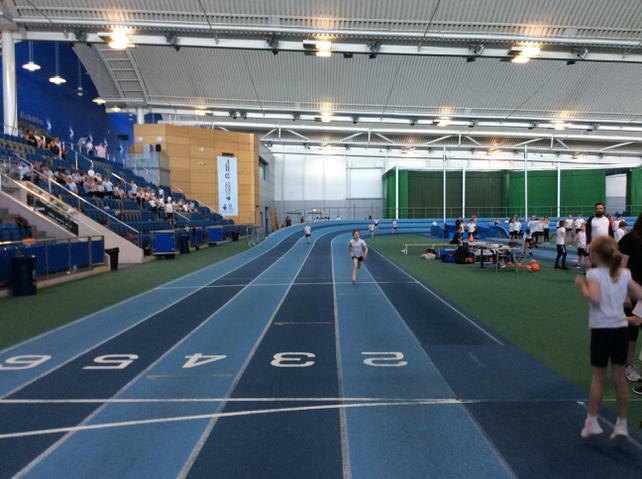 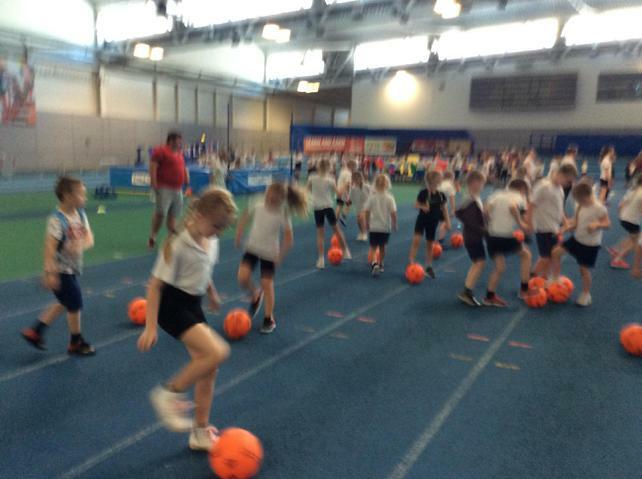 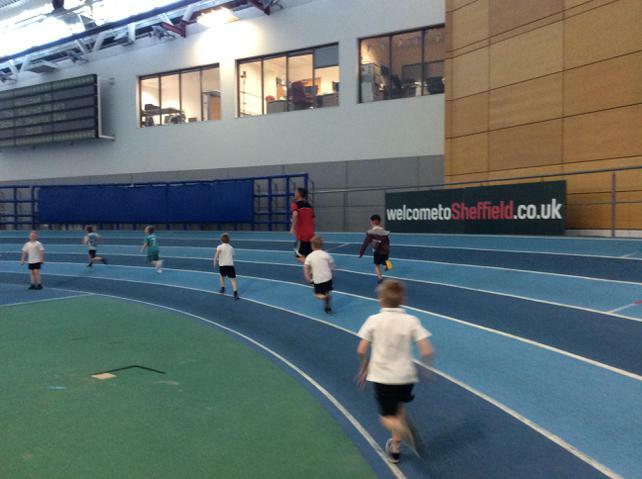 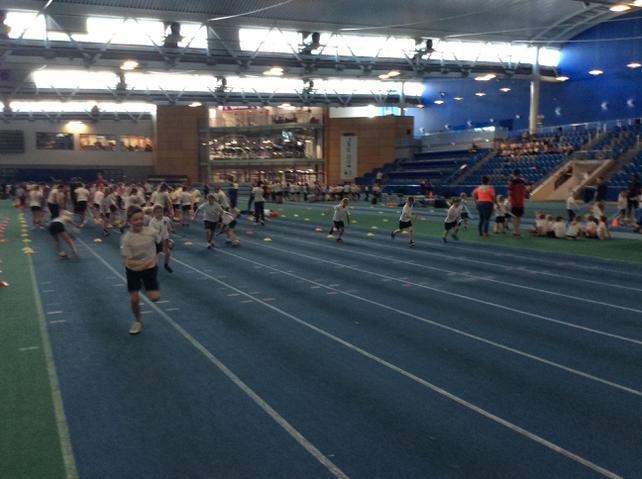 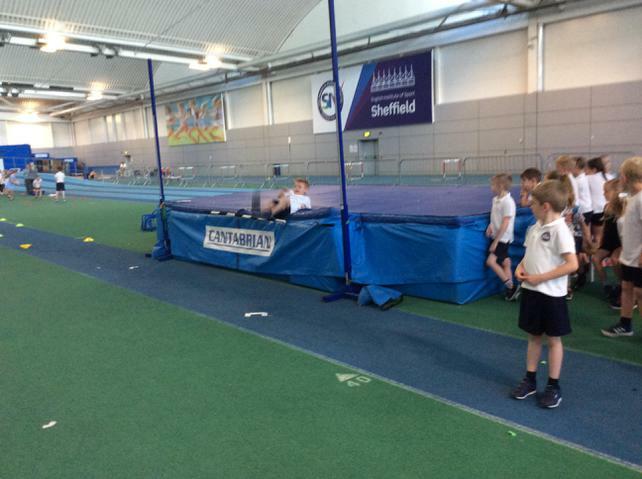 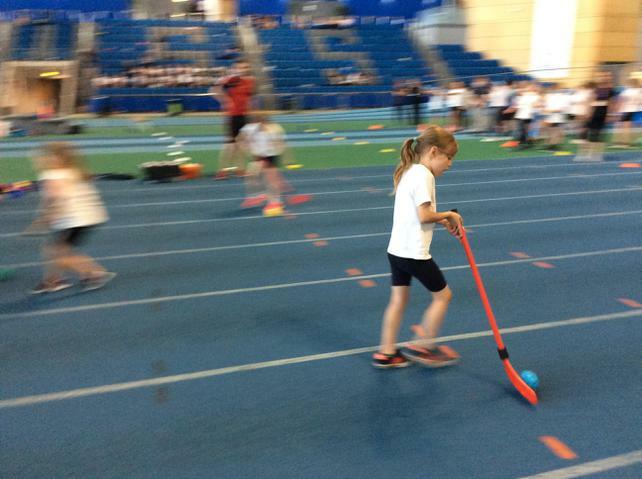 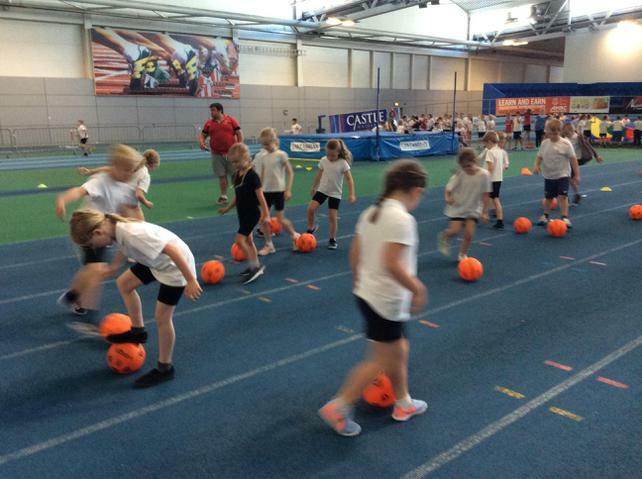 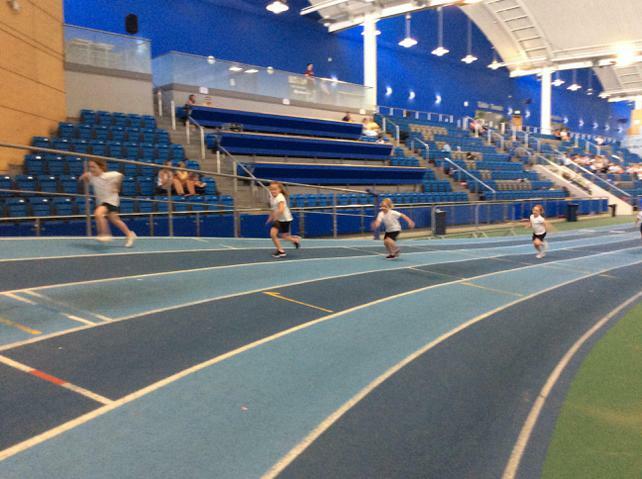 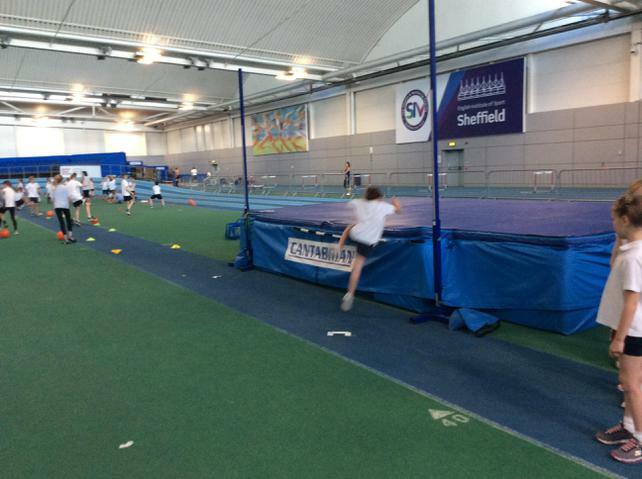 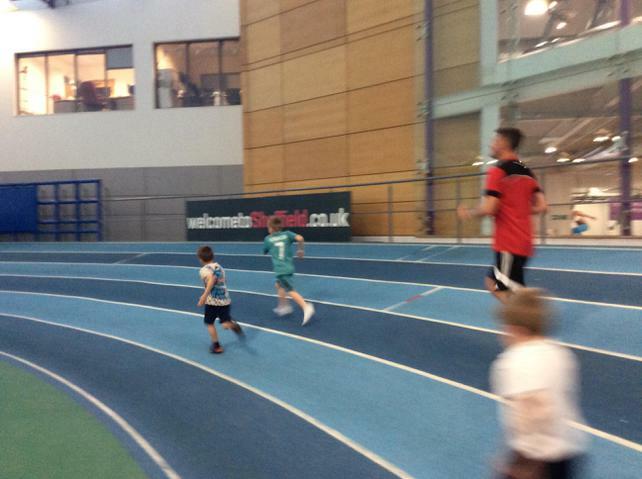 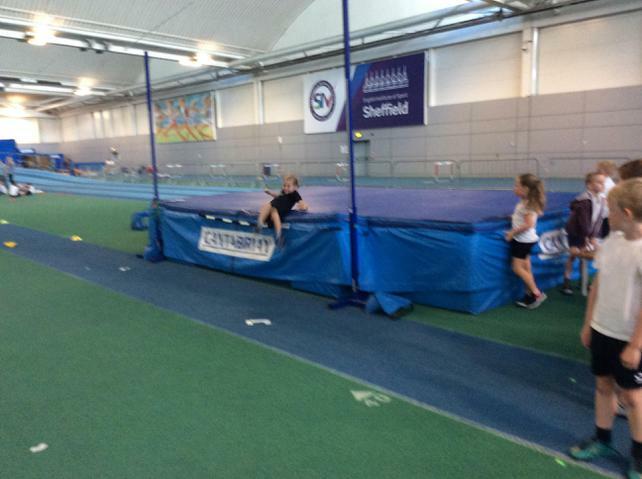 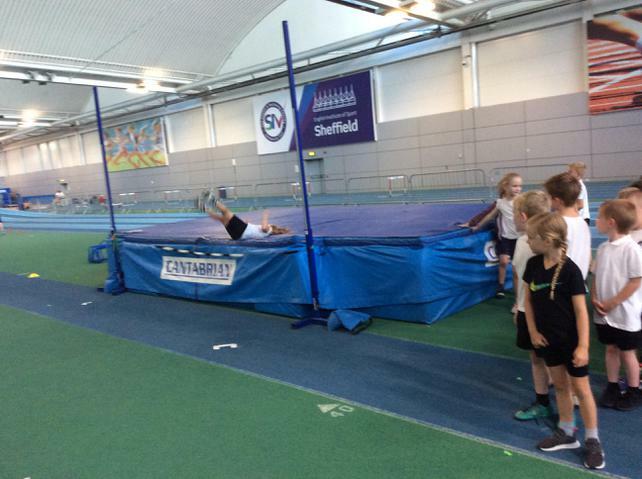 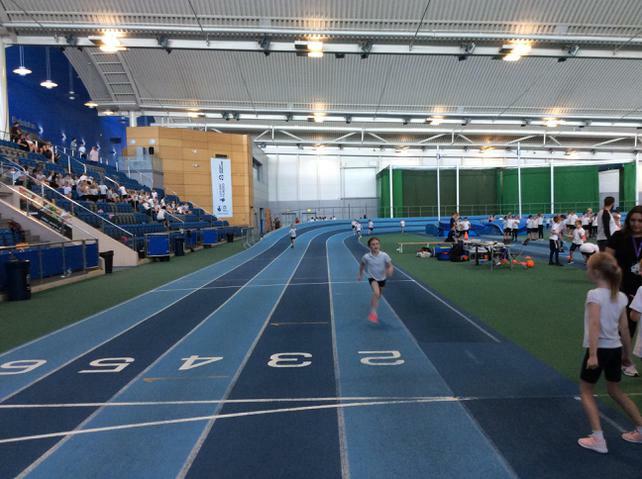 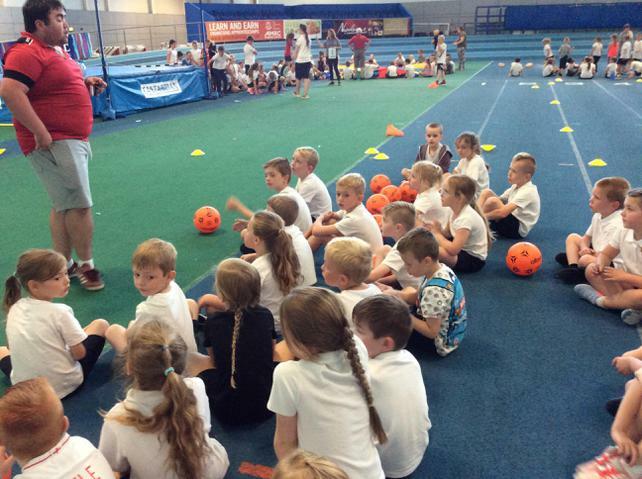 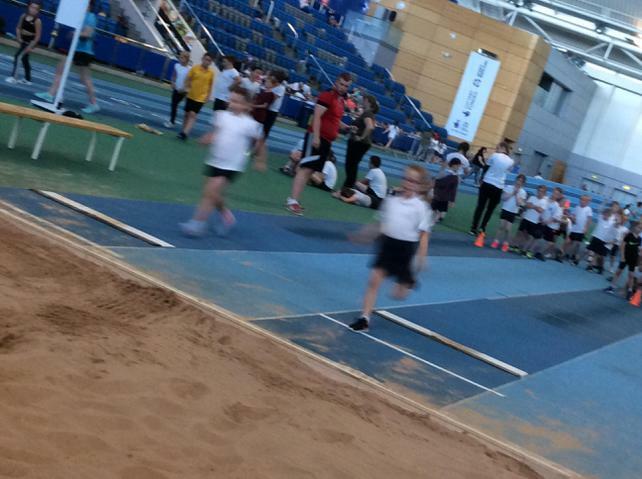 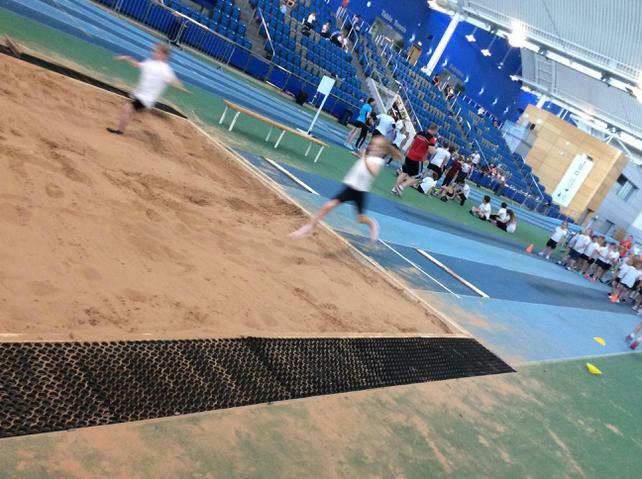 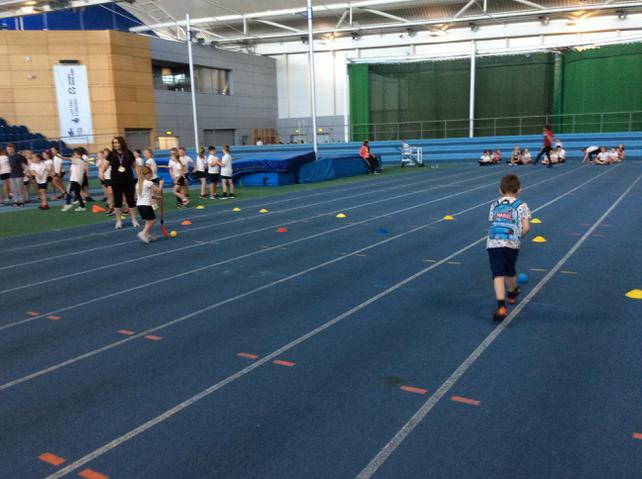 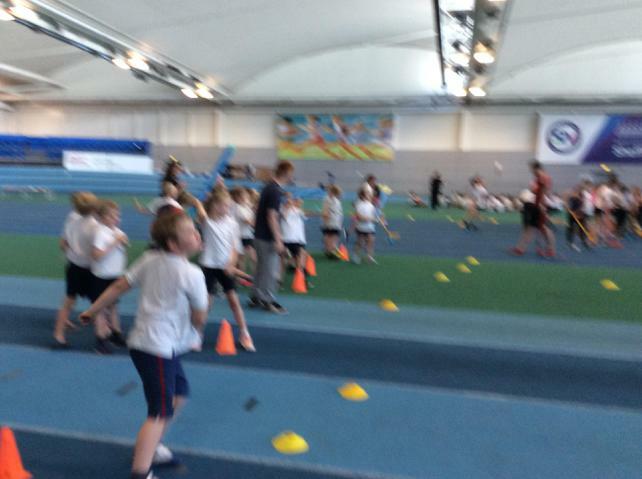 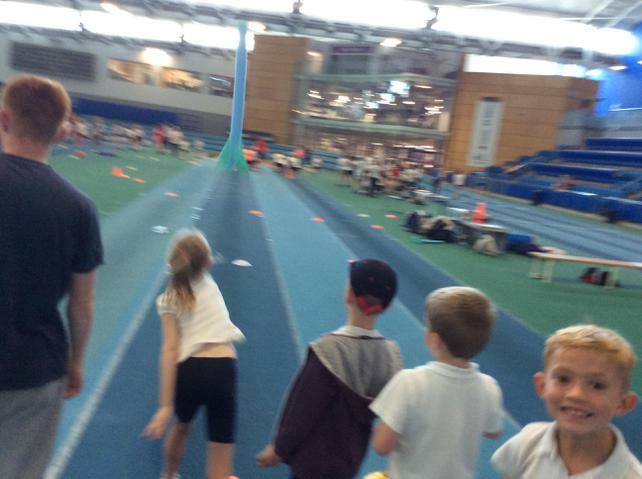 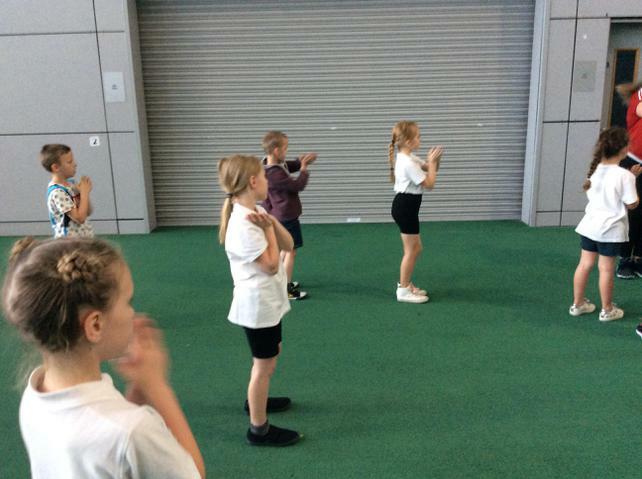 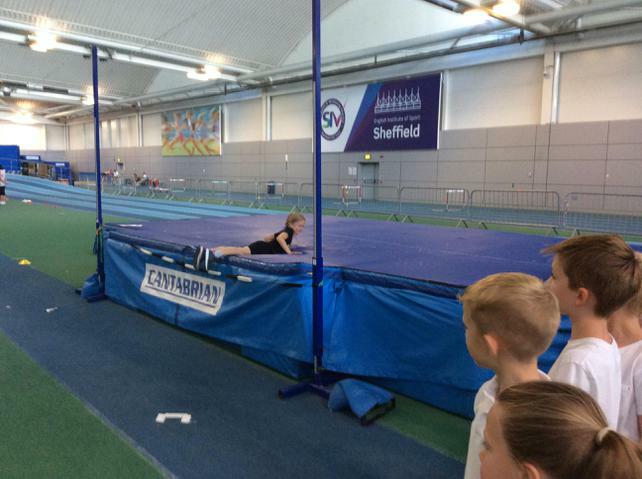 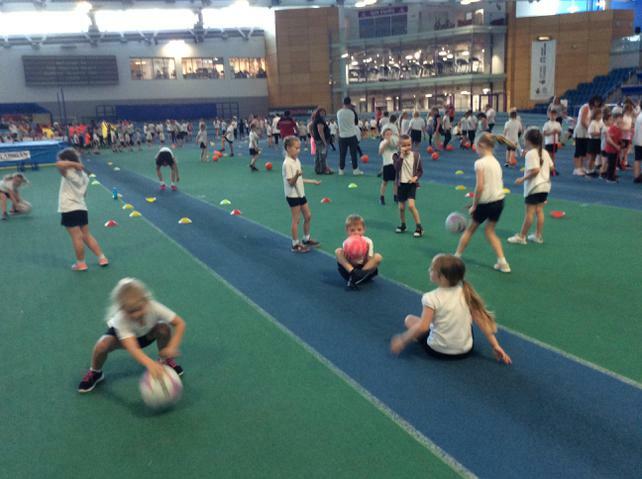 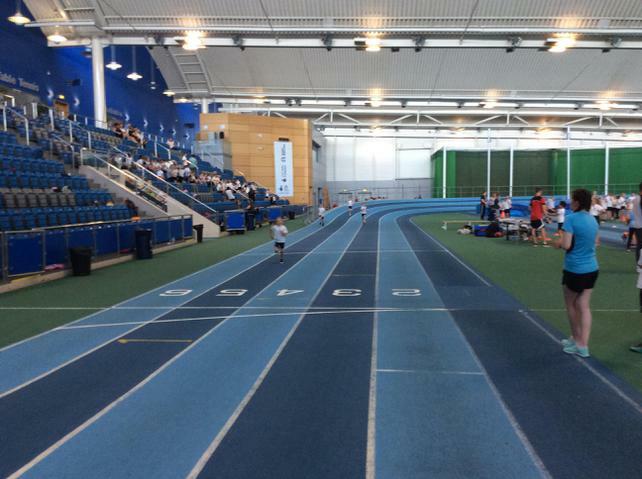 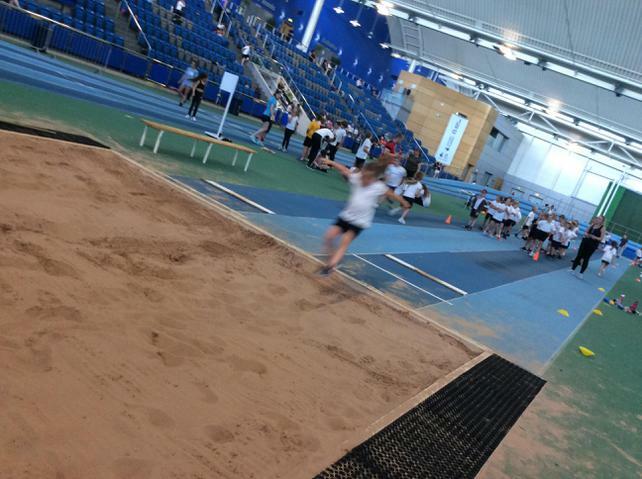 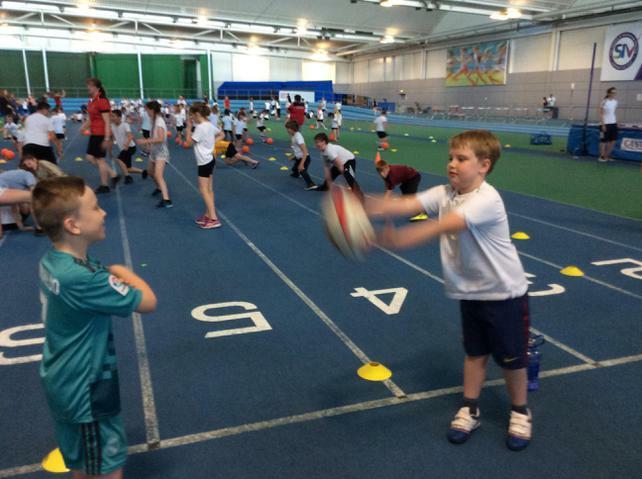 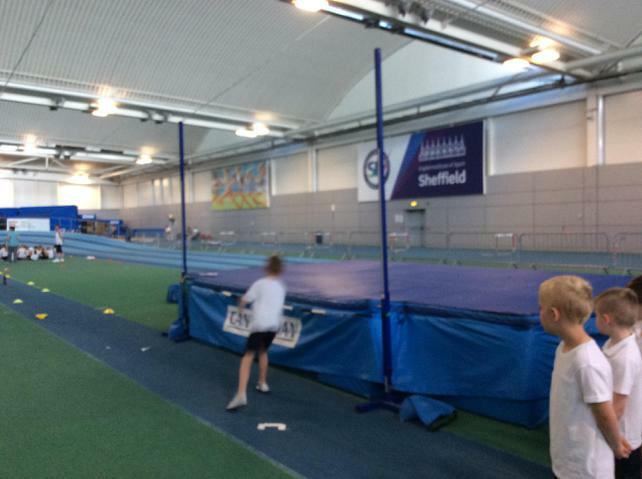 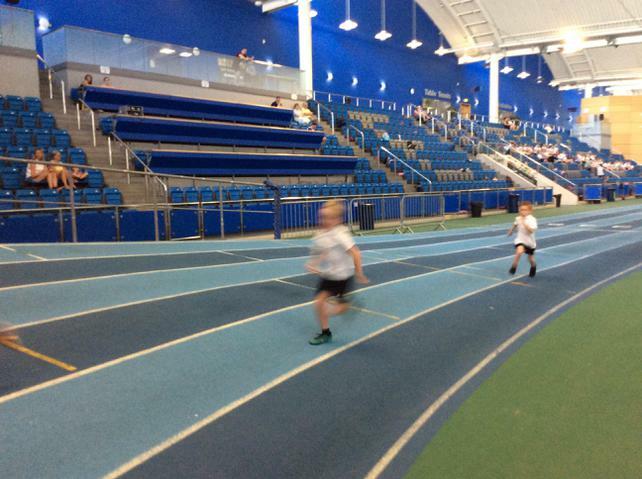 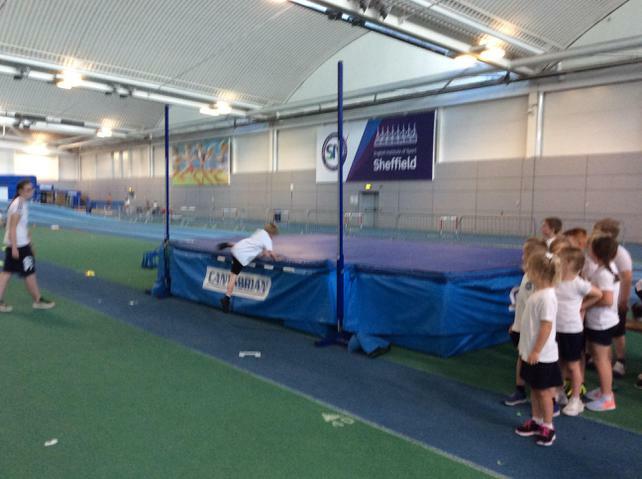 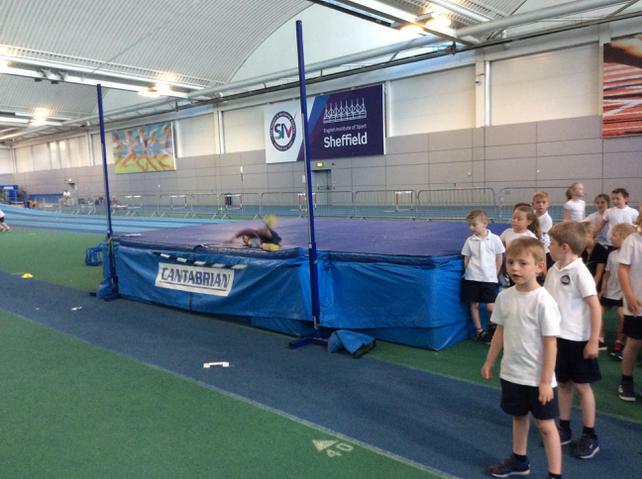 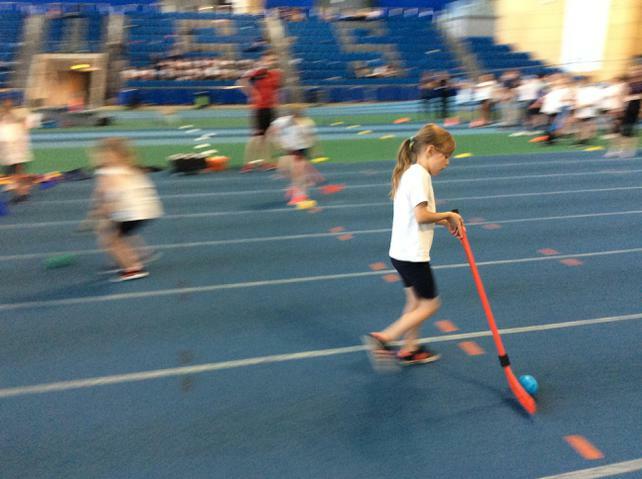 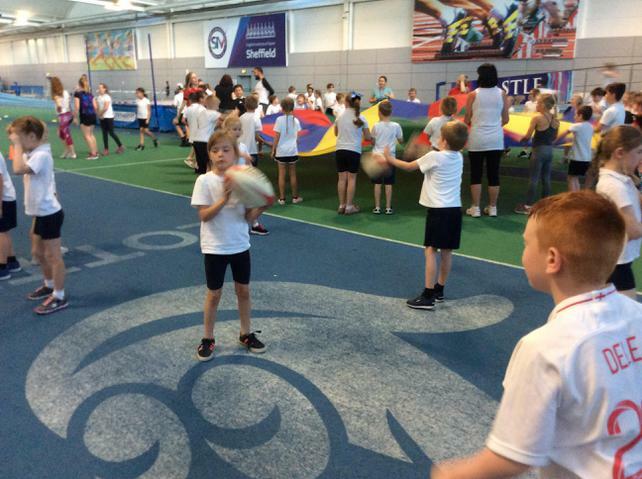 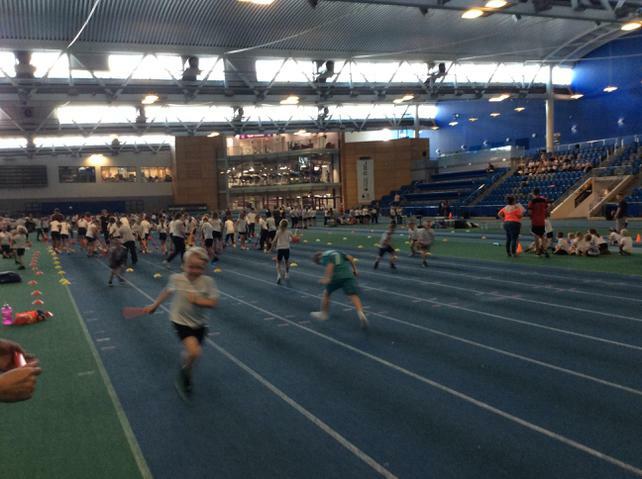 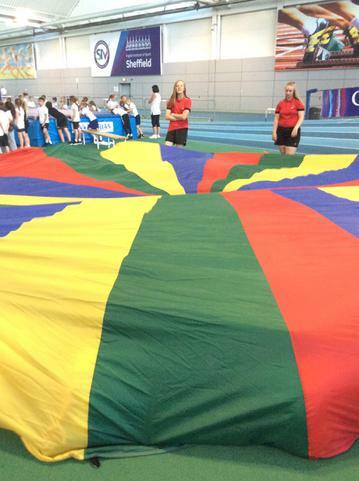 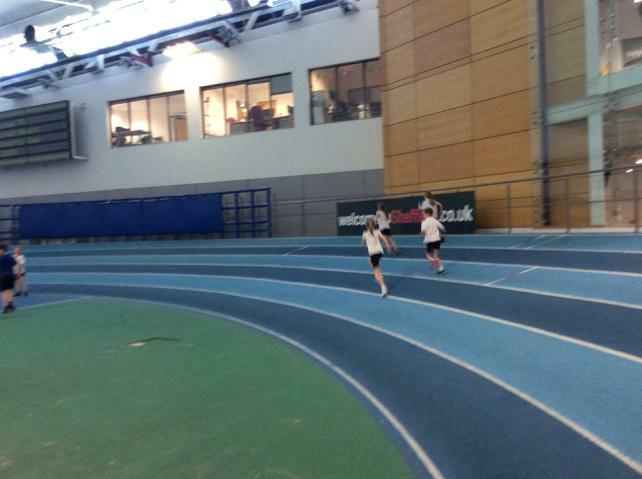 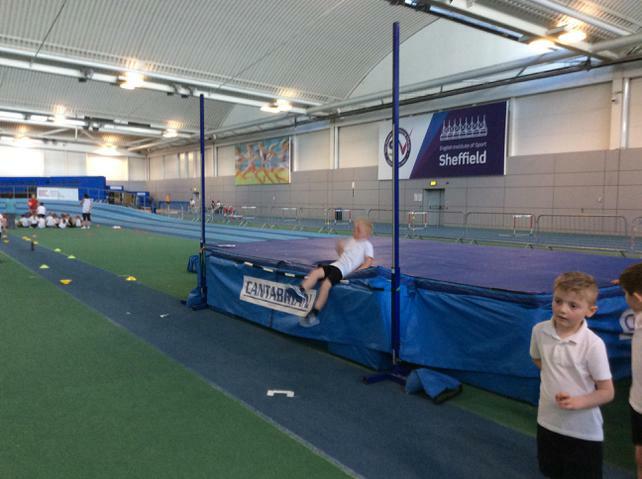 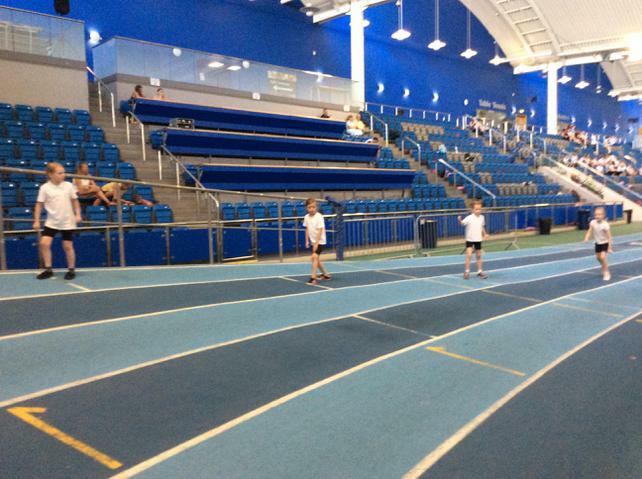 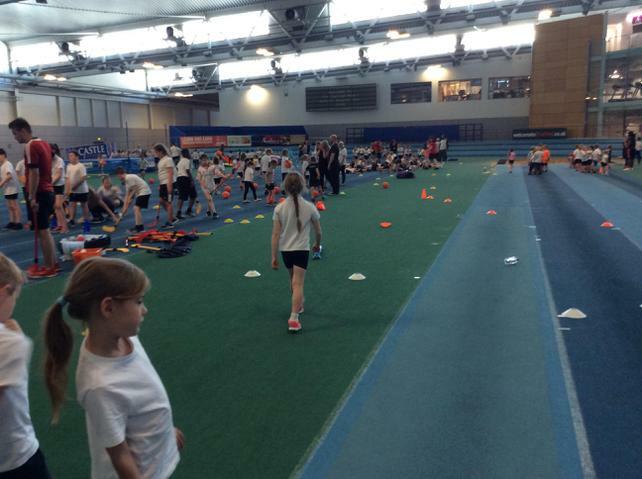 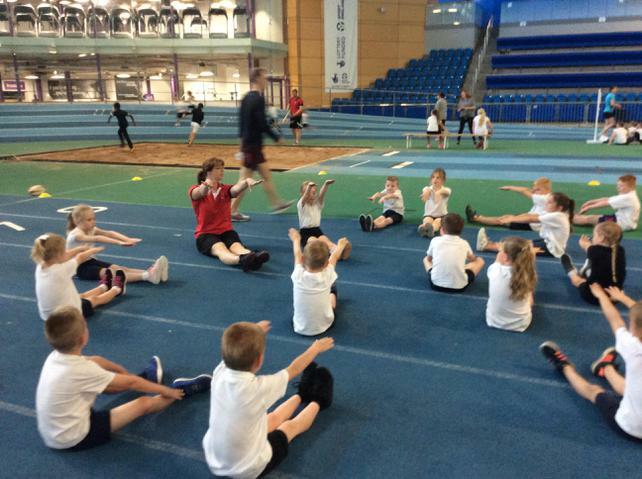 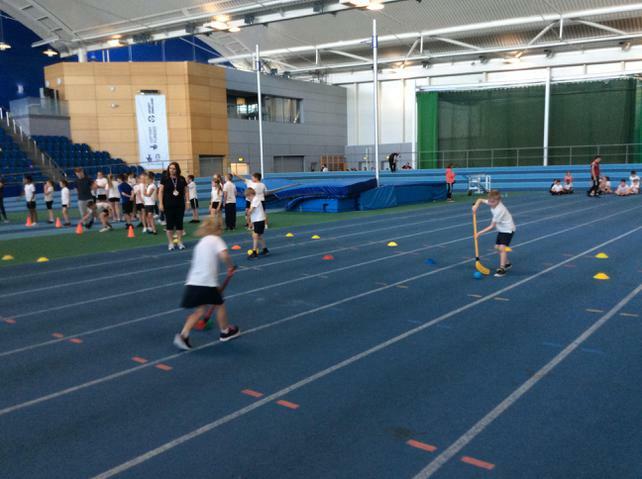 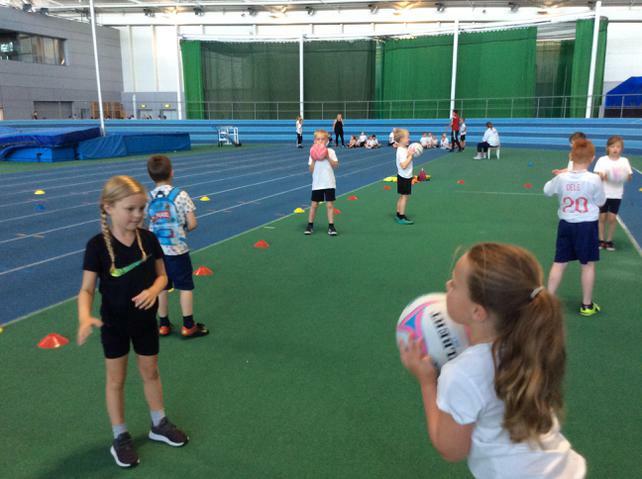 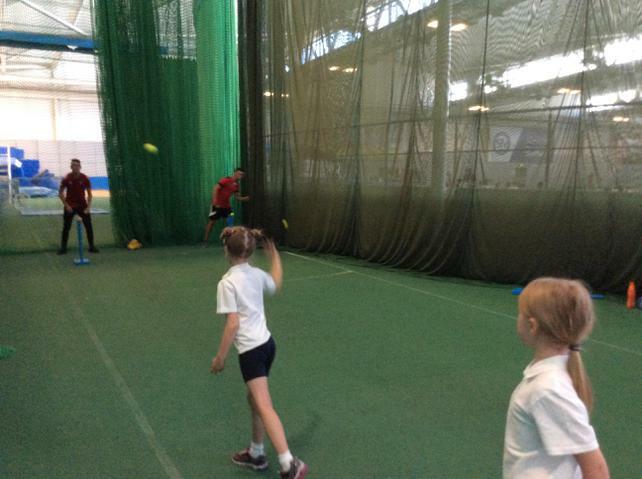 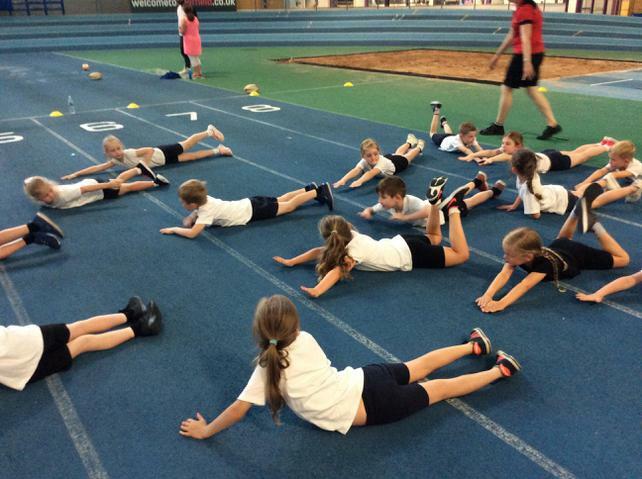 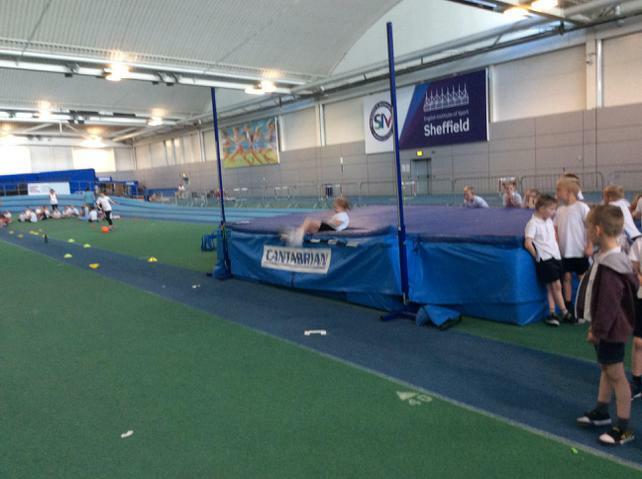 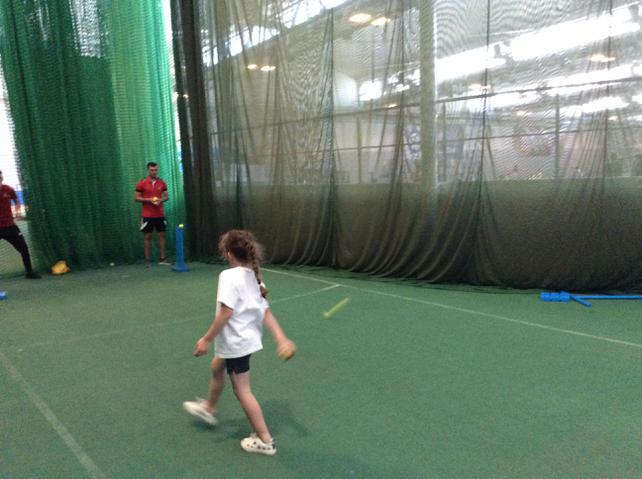 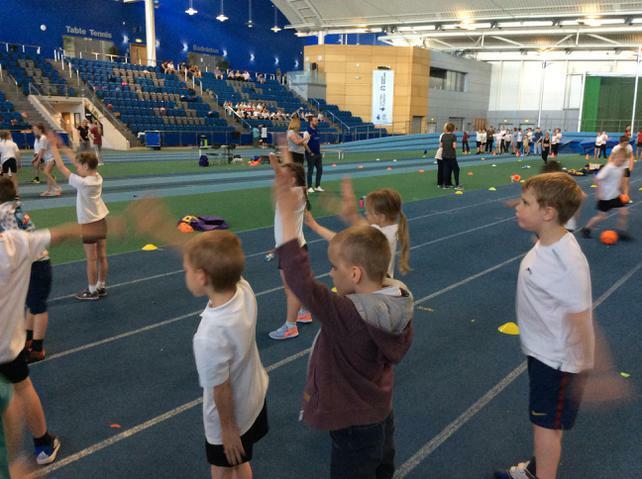 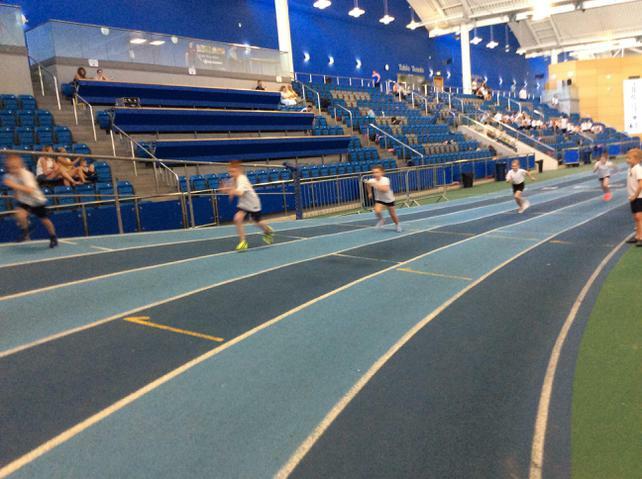 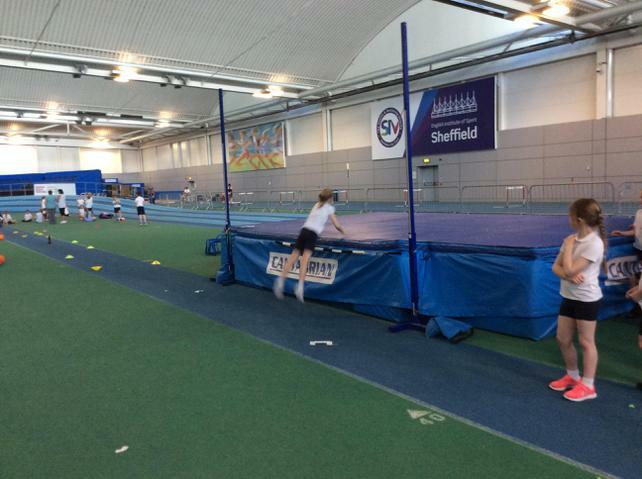 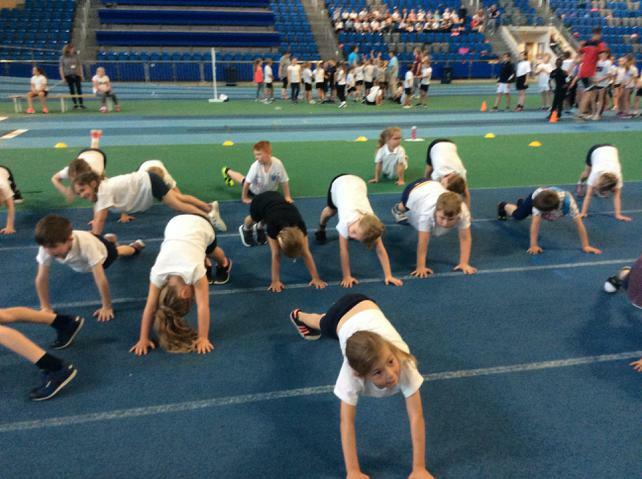 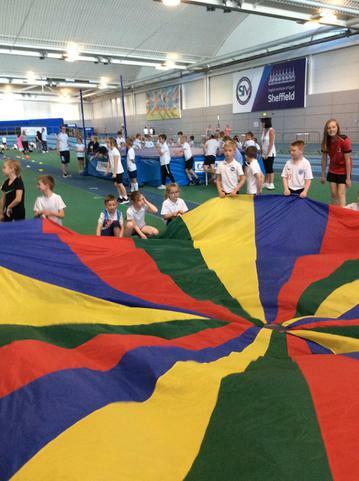 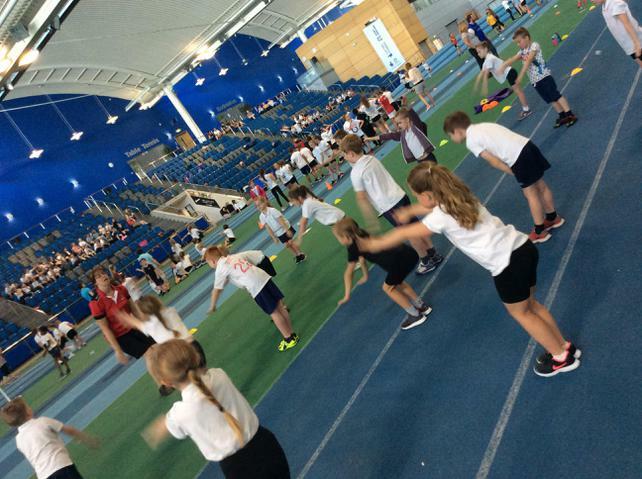 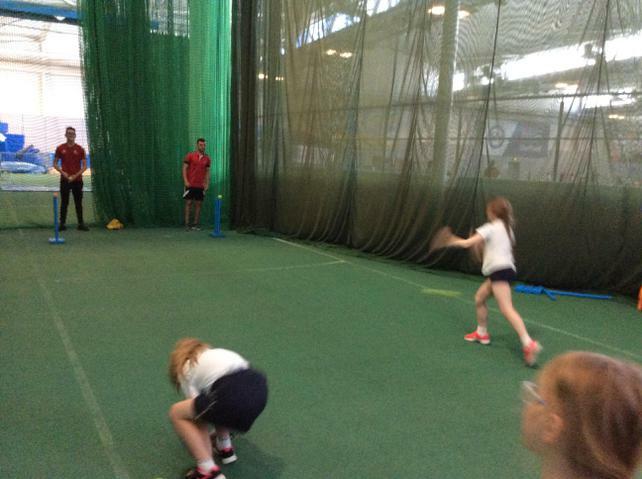 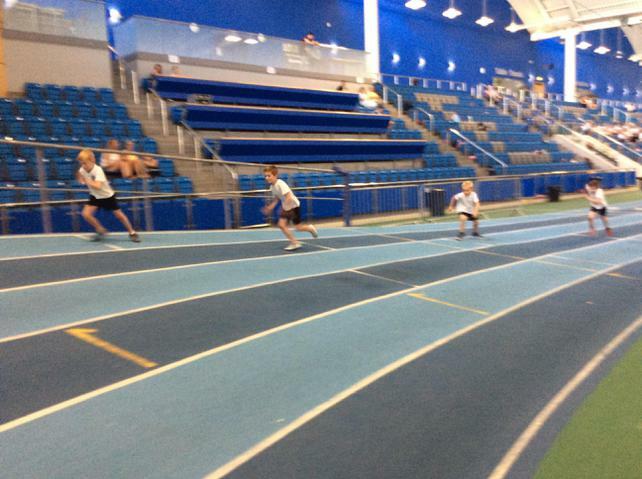 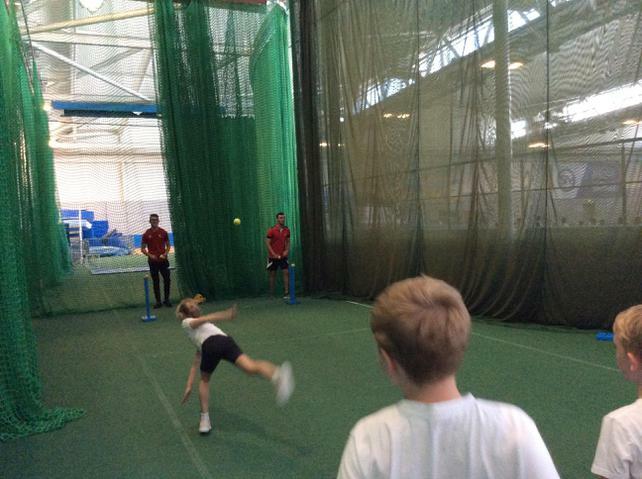 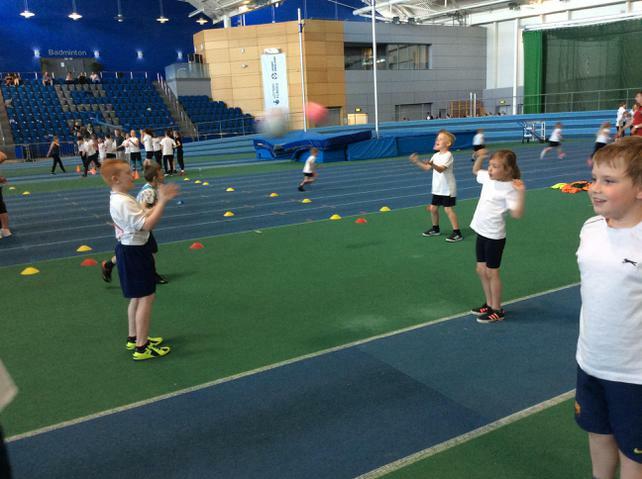 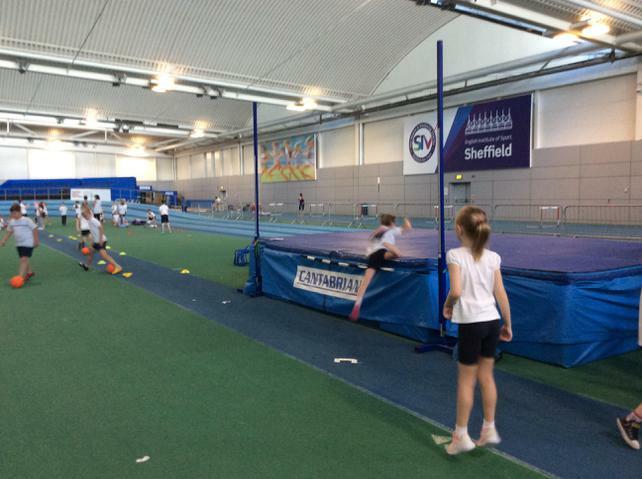 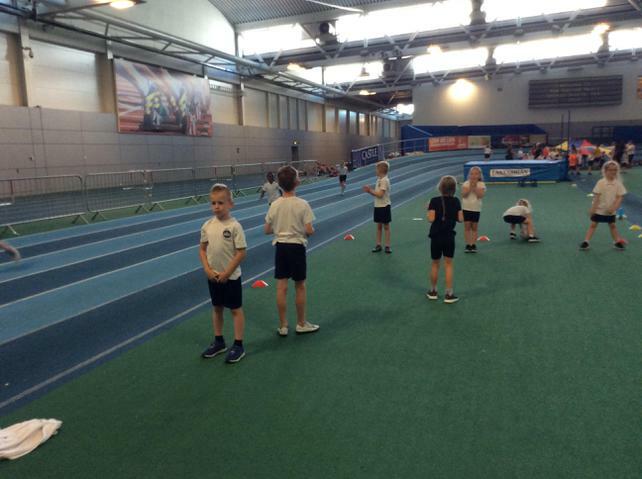 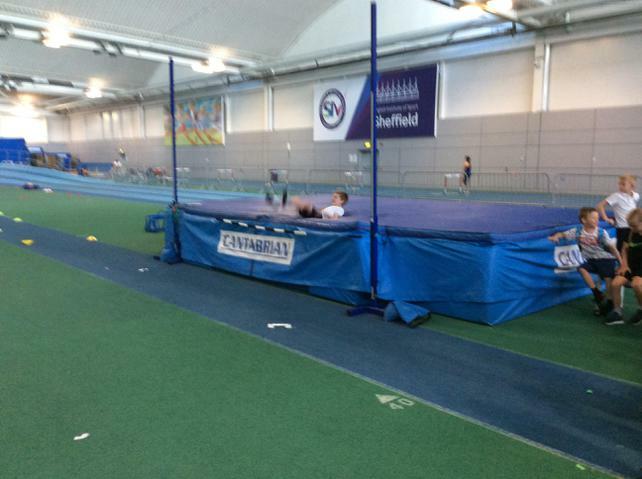 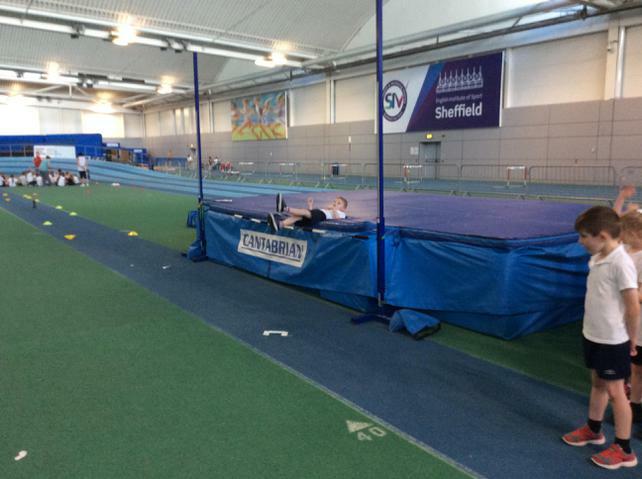 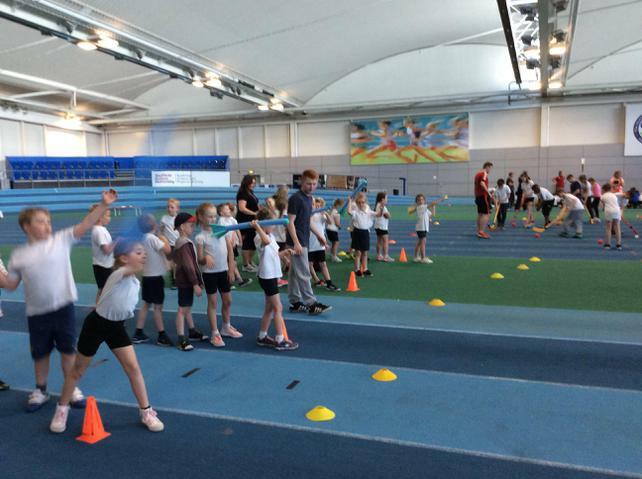 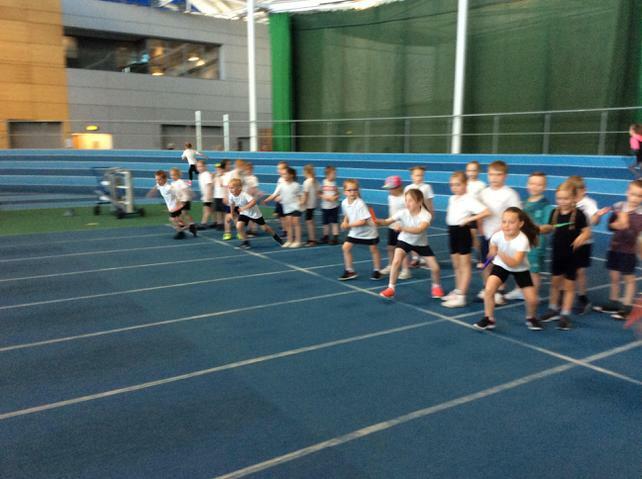 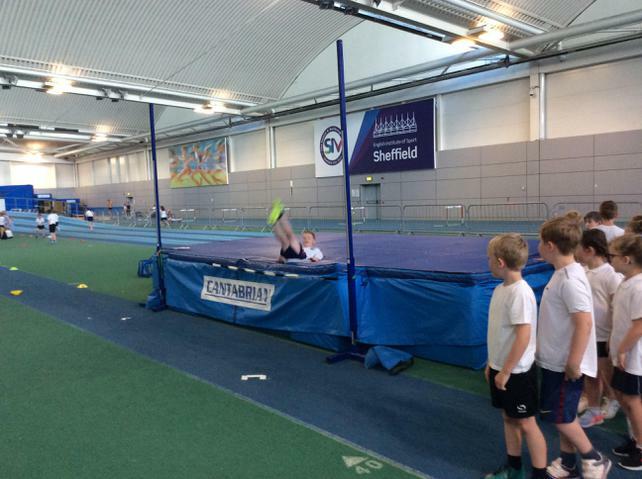 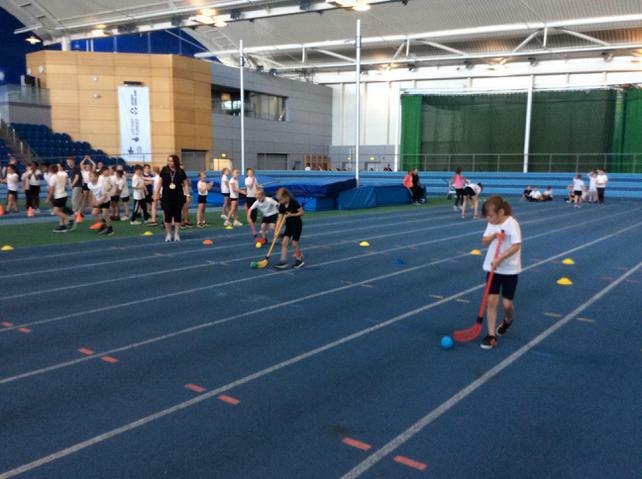 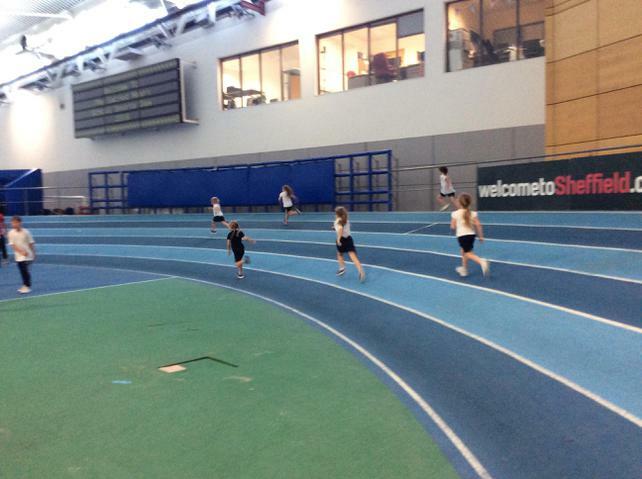 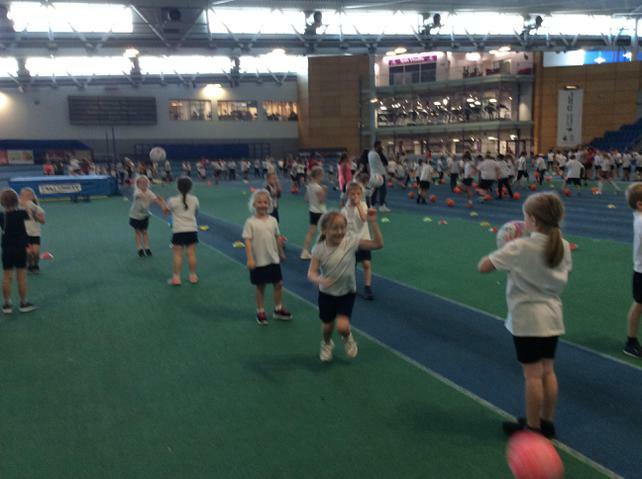 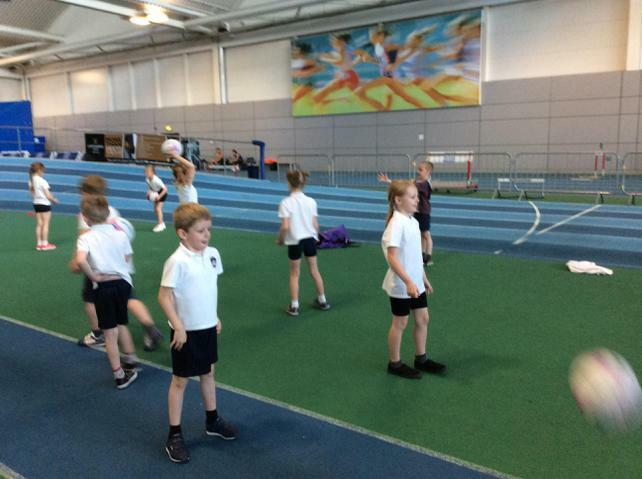 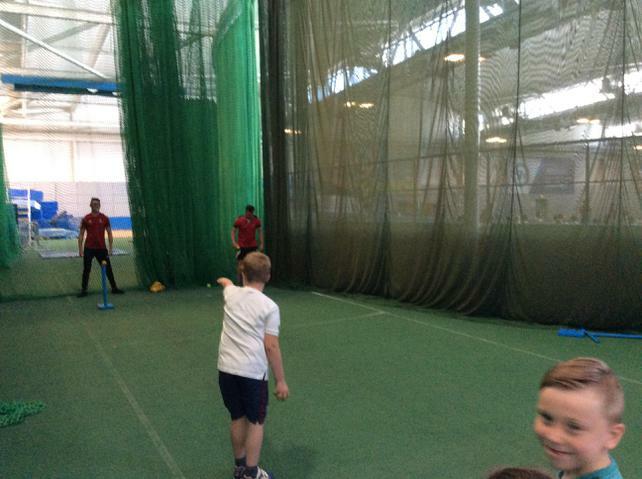 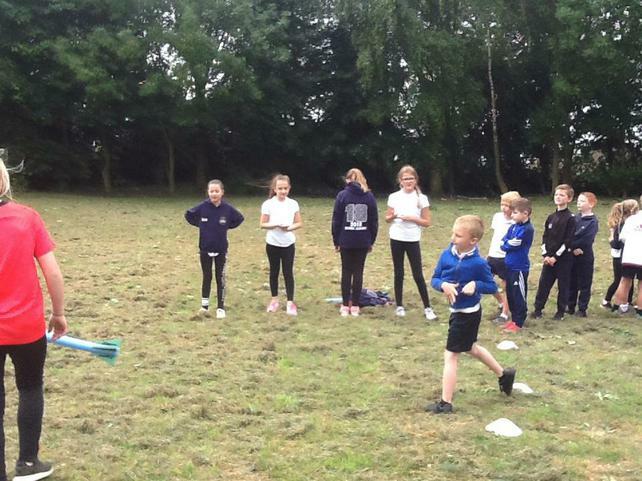 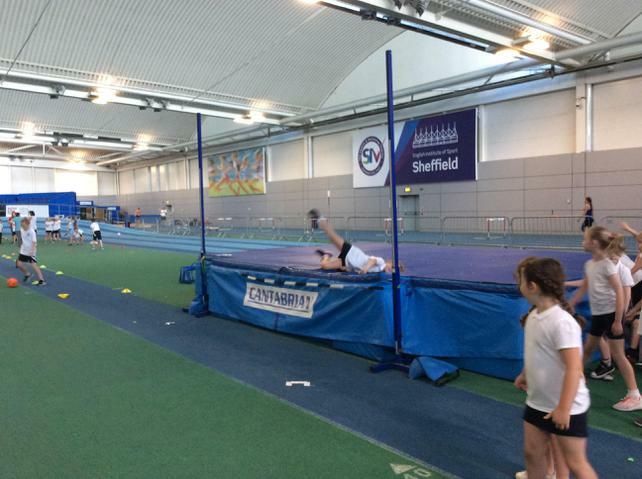 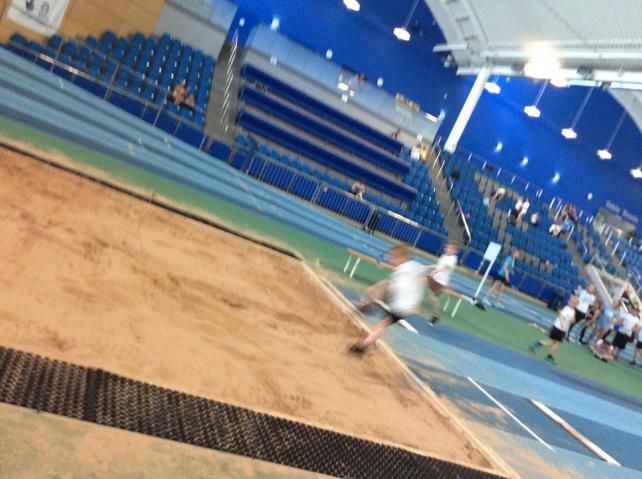 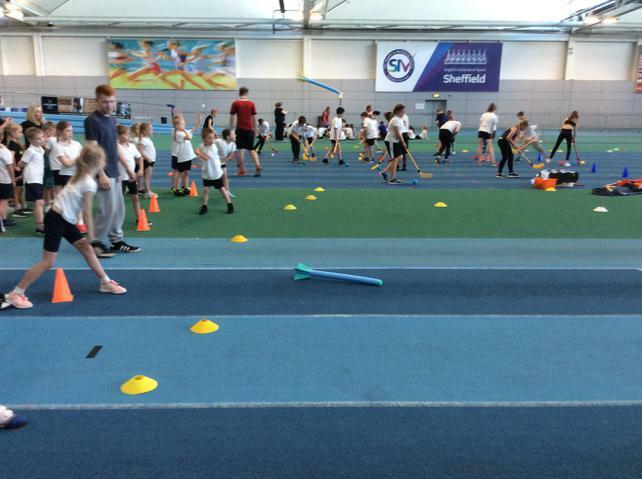 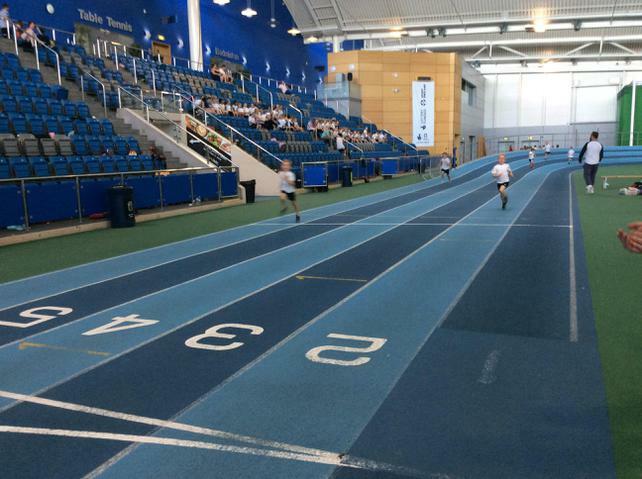 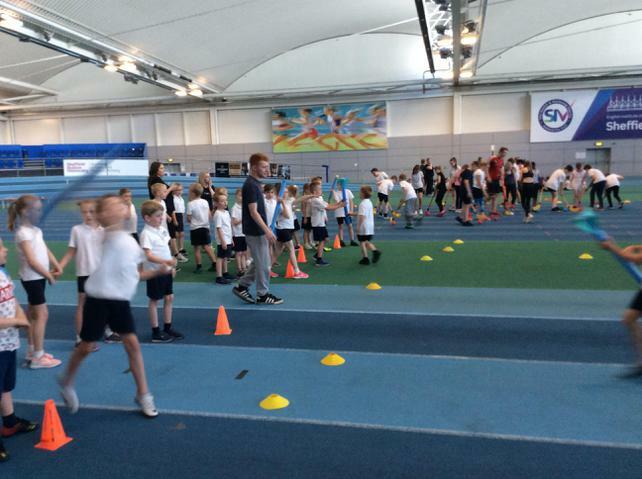 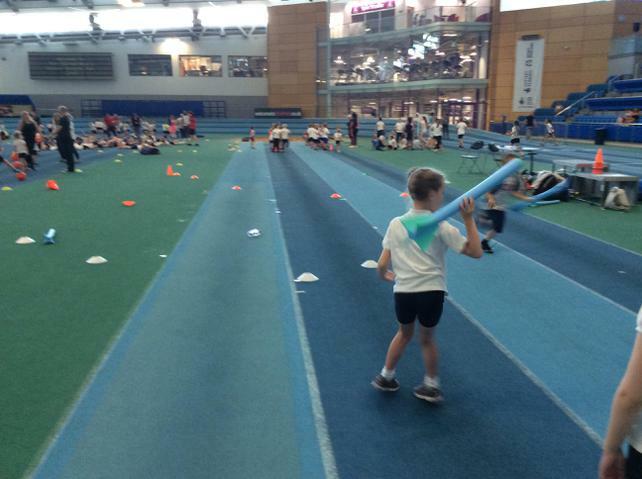 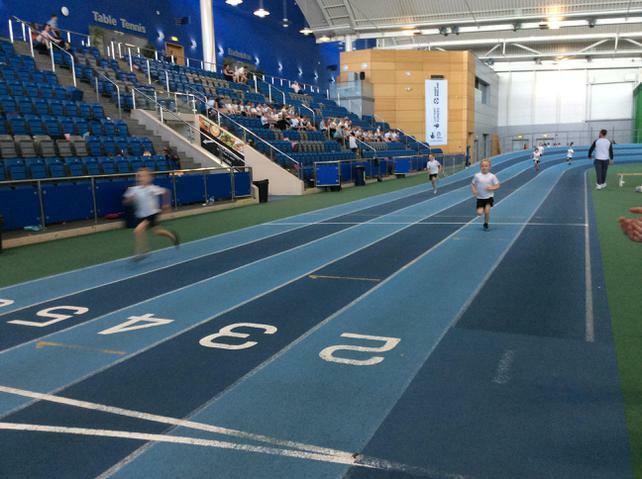 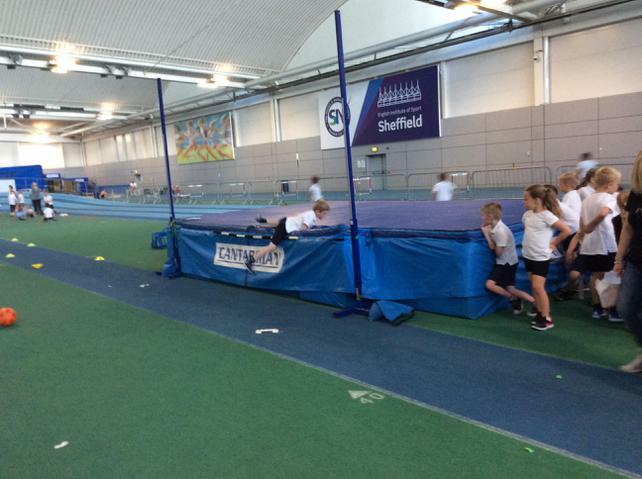 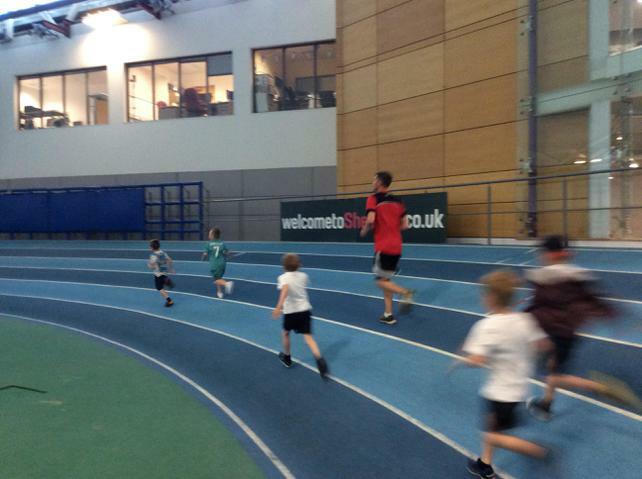 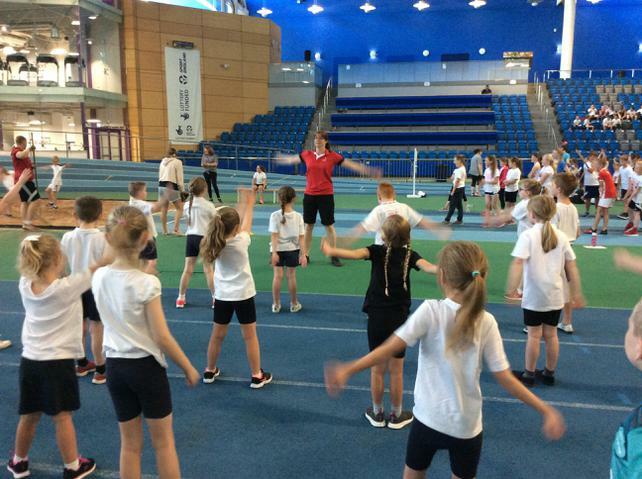 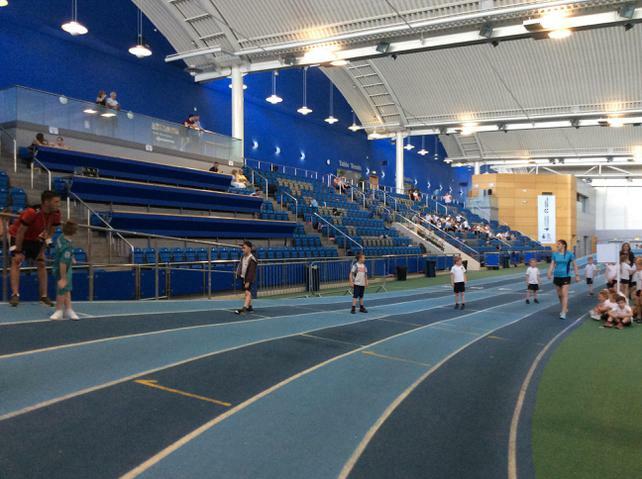 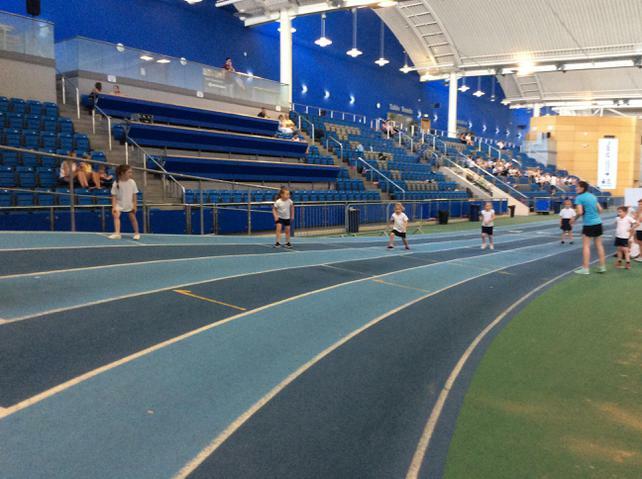 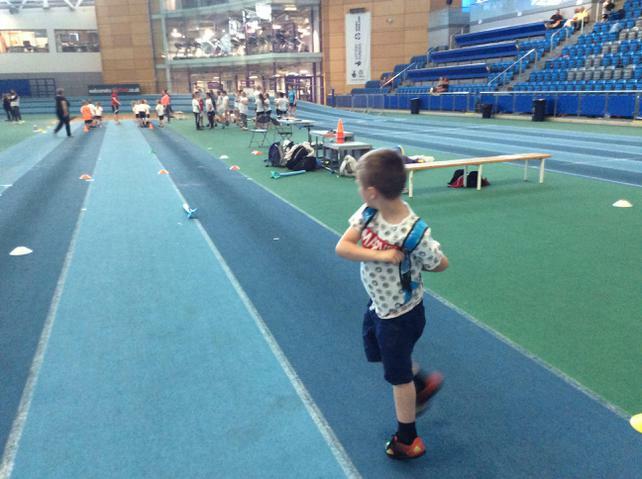 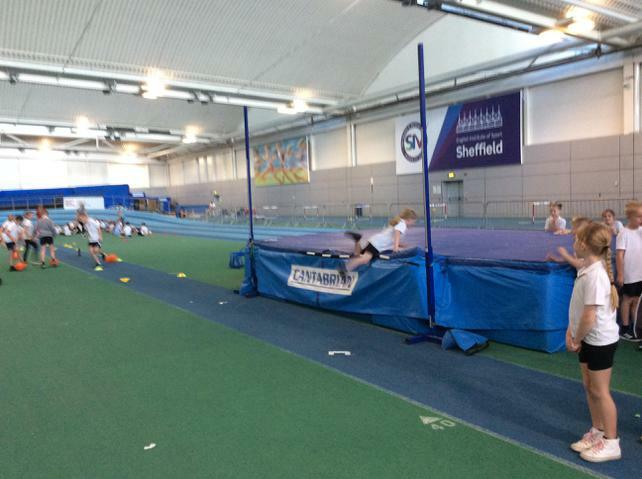 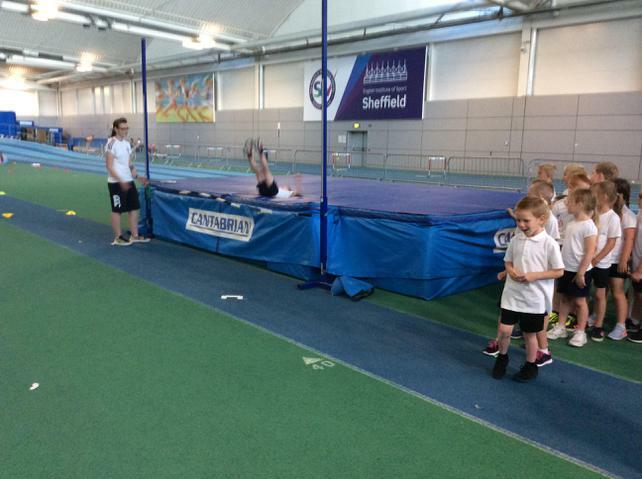 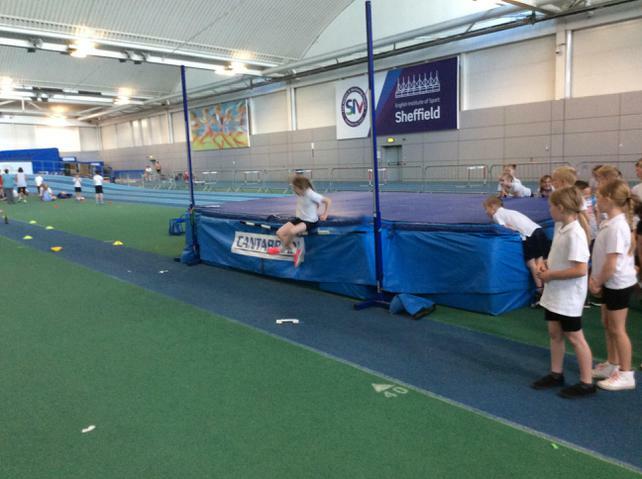 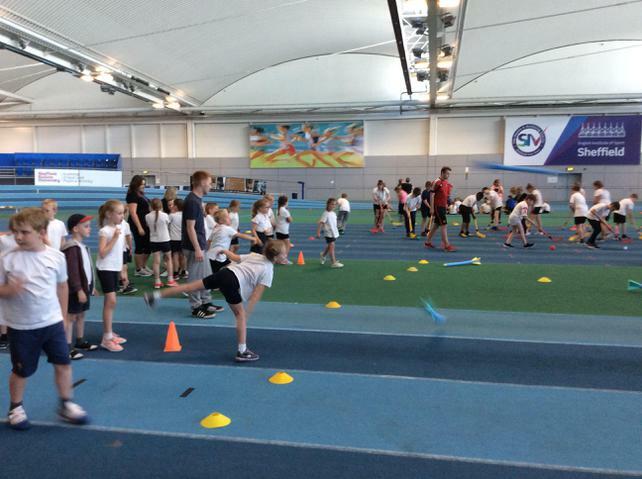 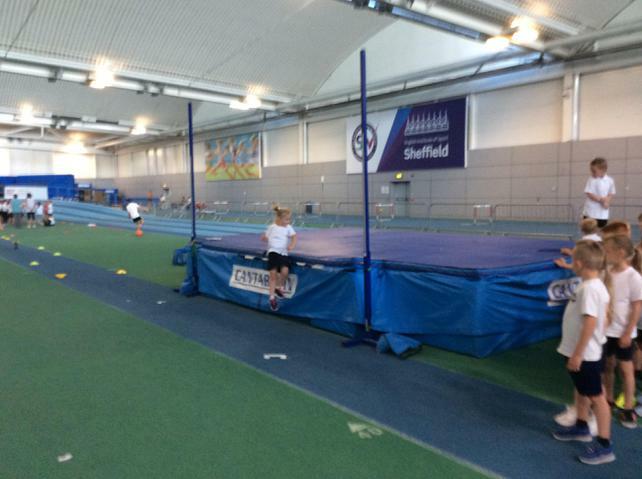 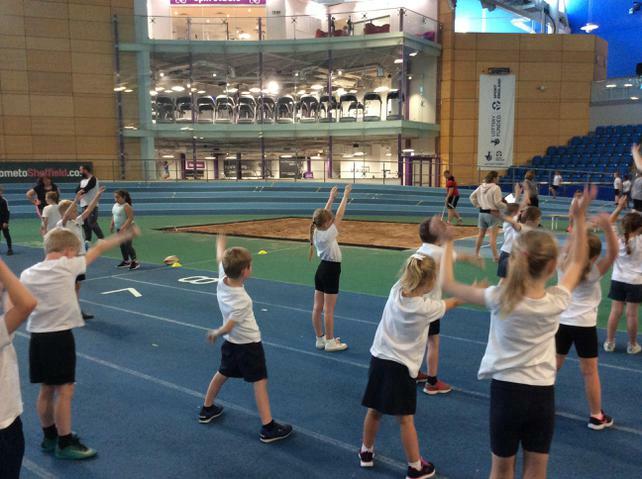 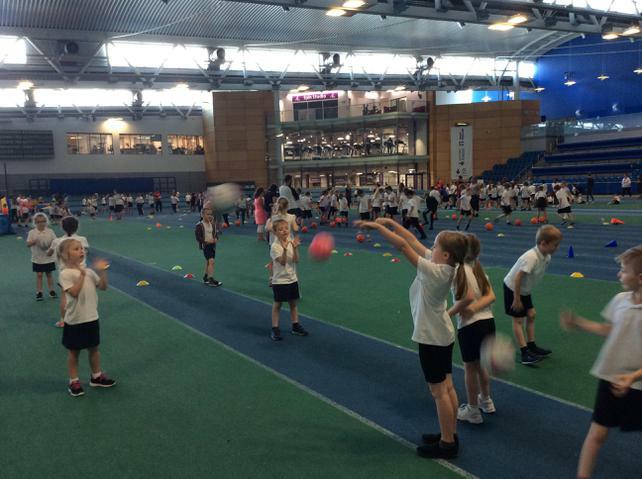 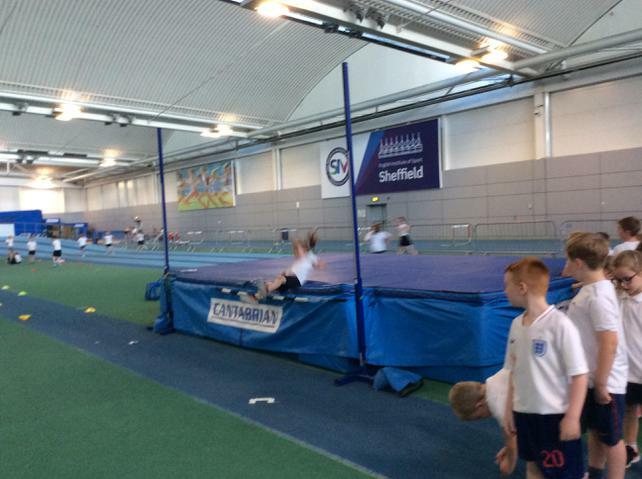 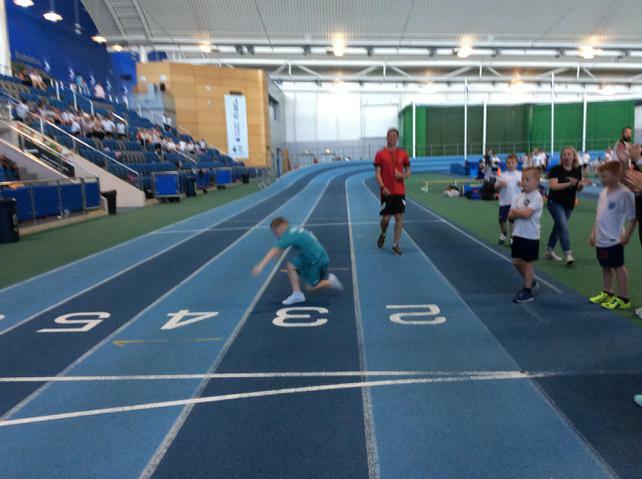 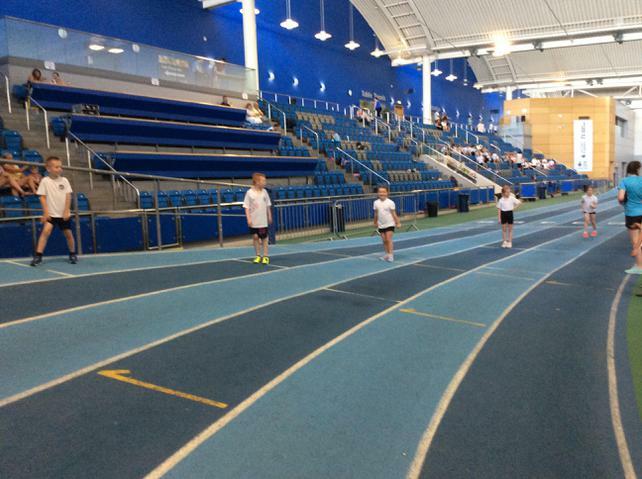 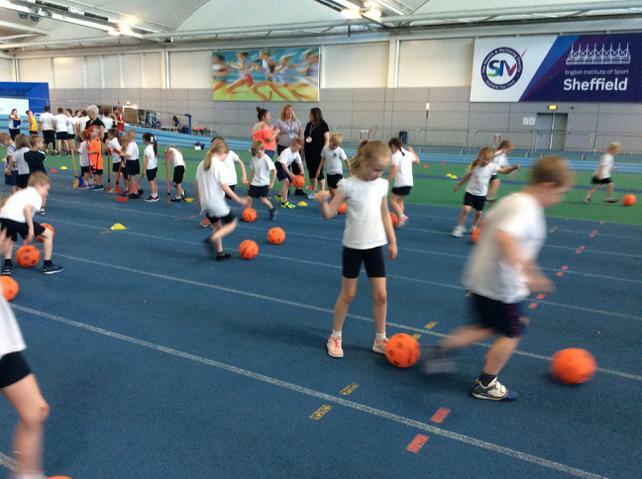 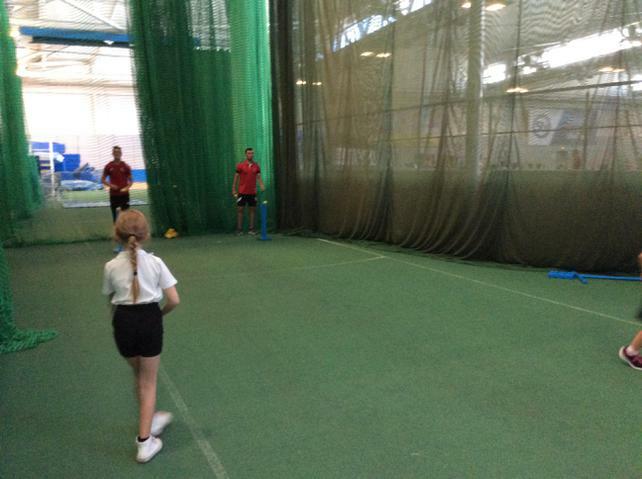 This Monday, we traveled to the E.I.S in Sheffield for our Federation Sports Day with St Michael's School and Sacred Heart School. 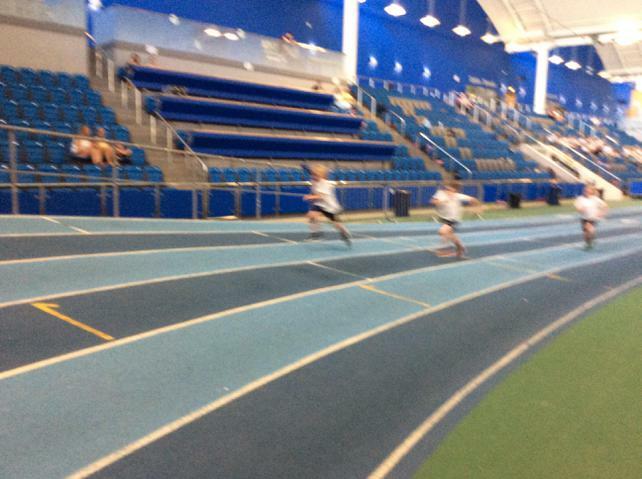 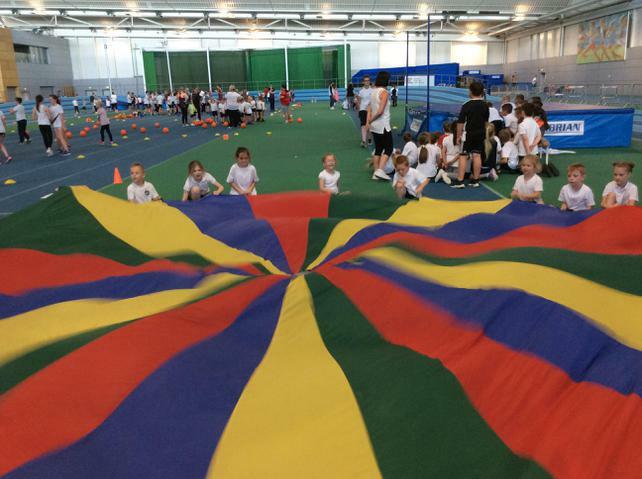 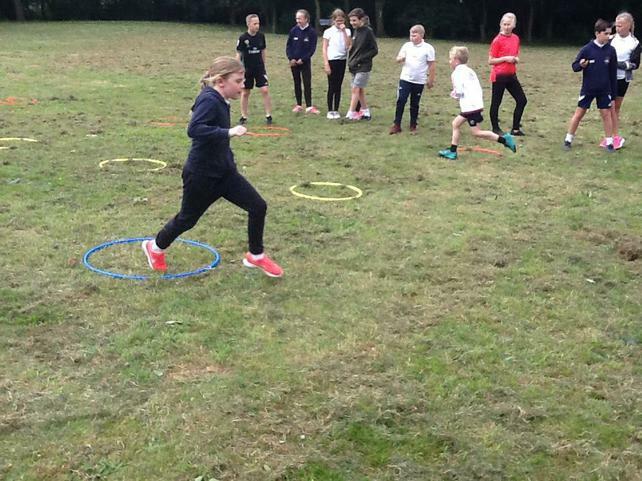 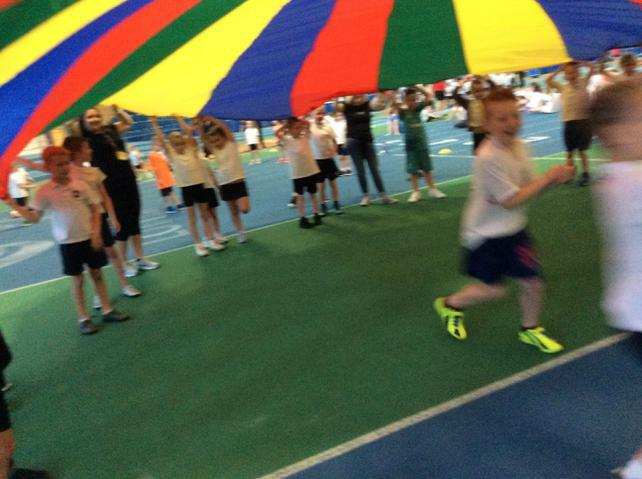 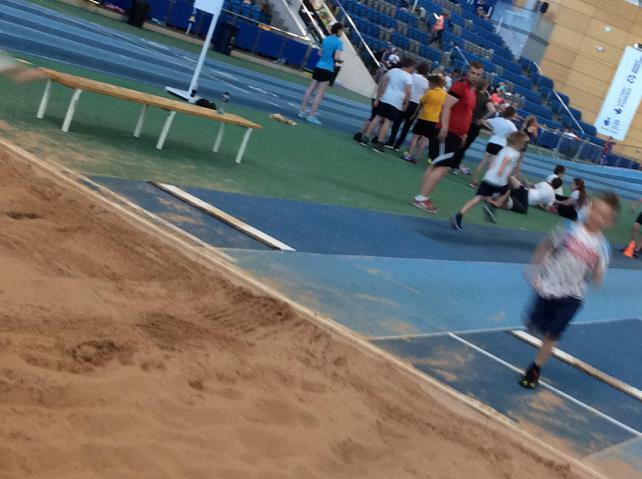 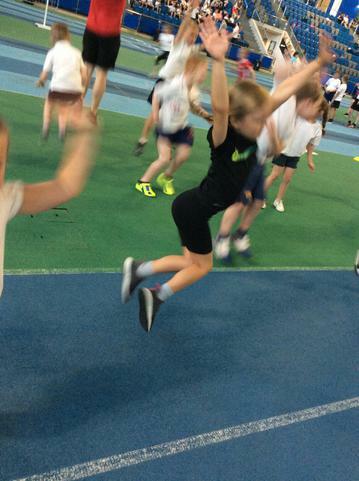 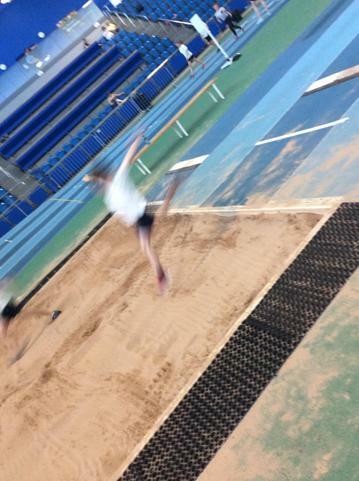 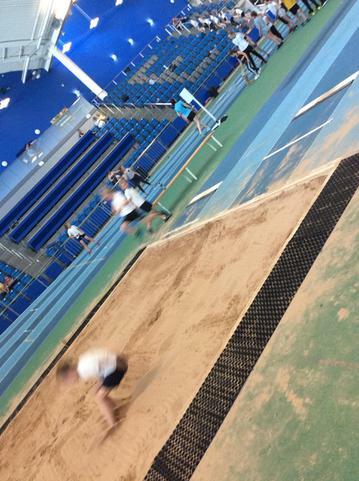 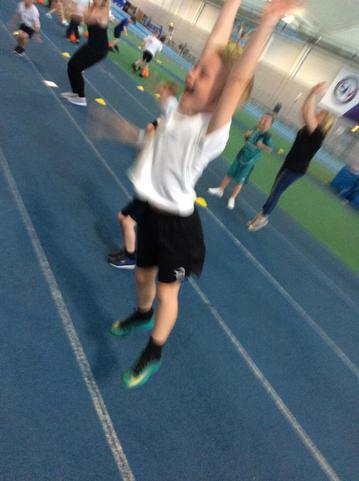 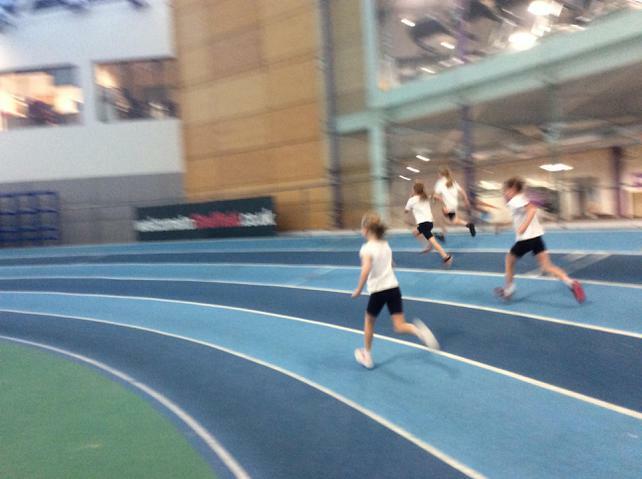 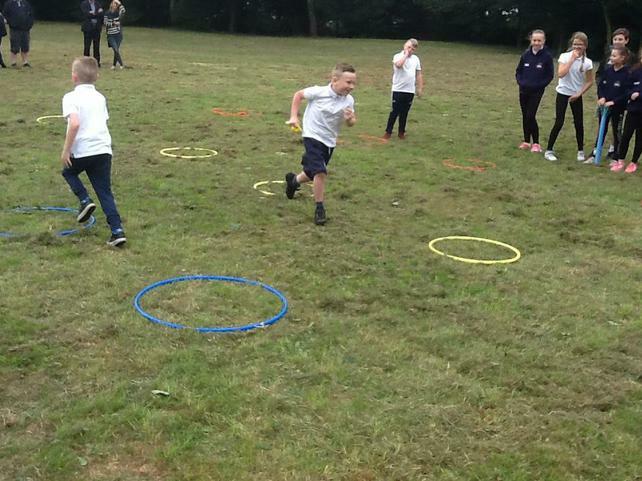 We had a fantastic time taking part in a variety of activities including; relay races, 200m race, long jump, high jump, netball, parachute games and Zumba! 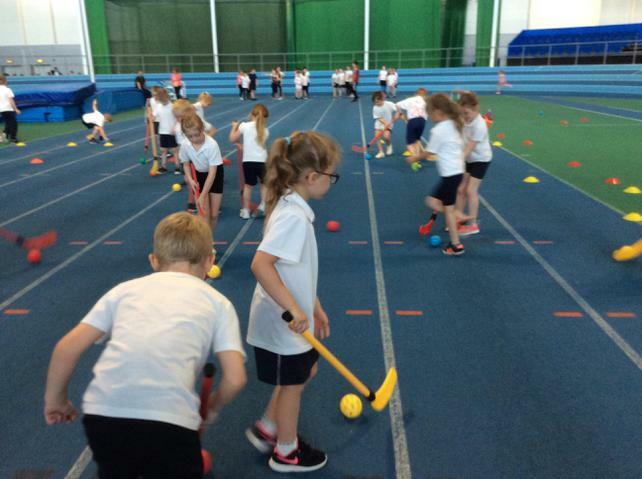 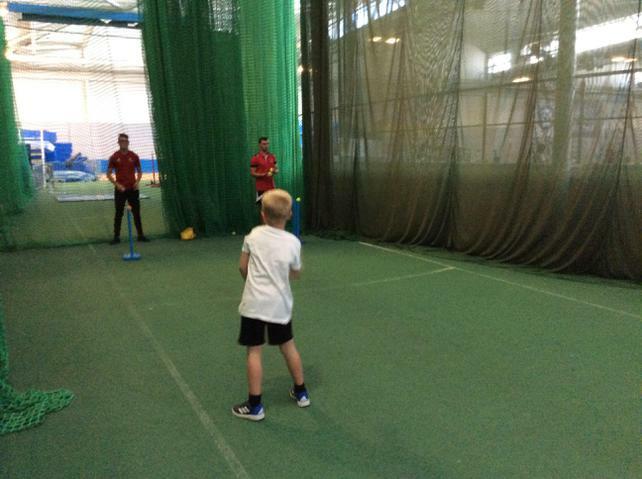 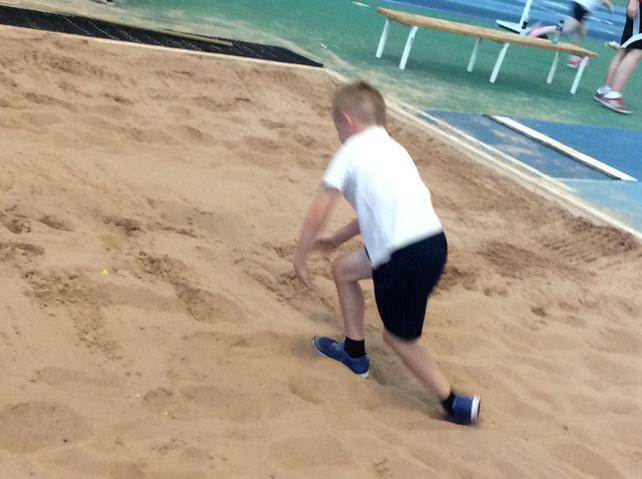 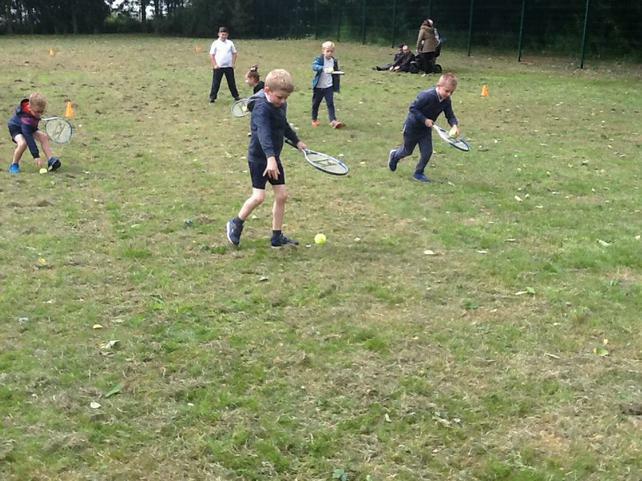 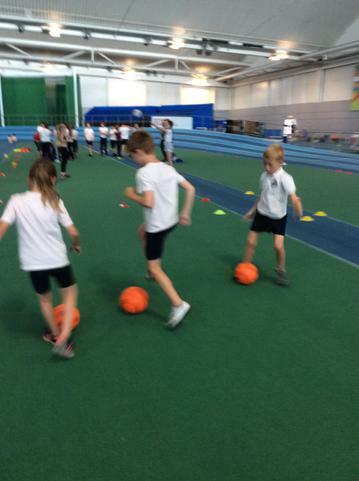 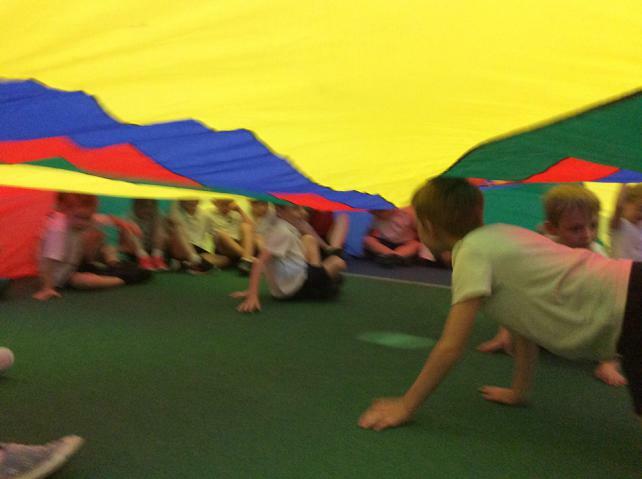 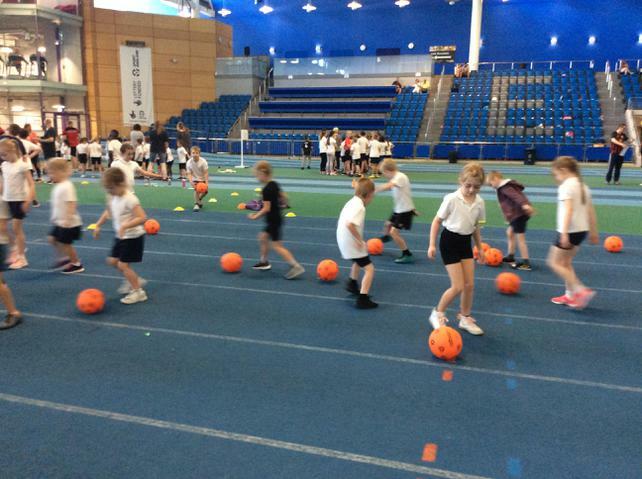 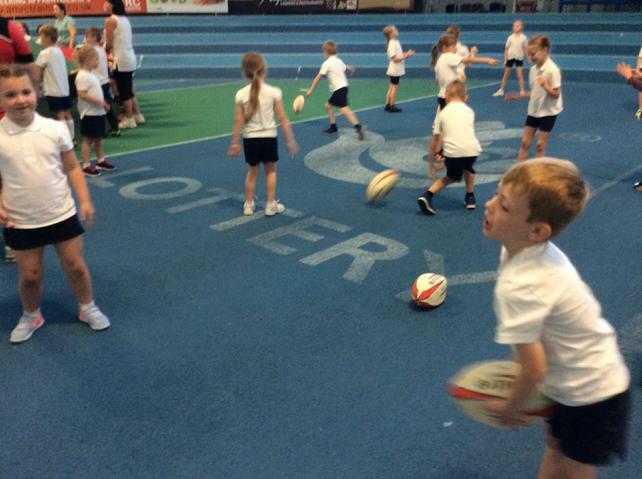 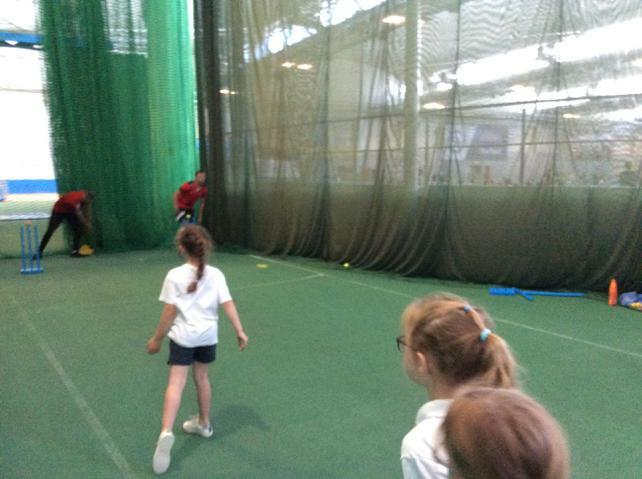 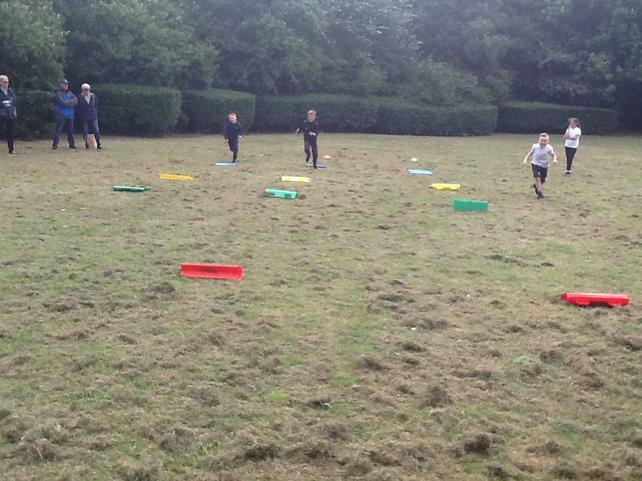 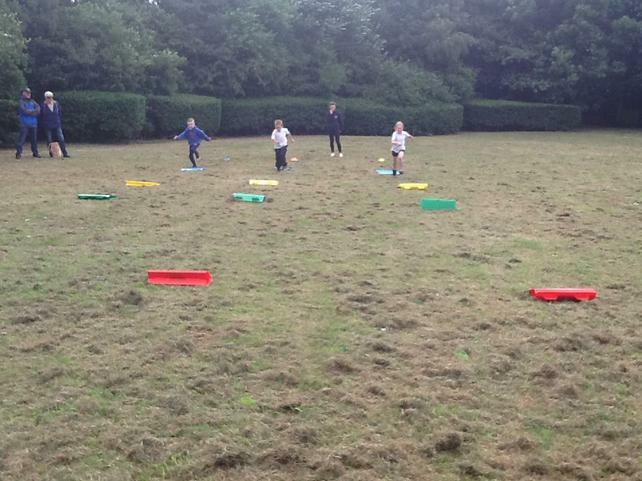 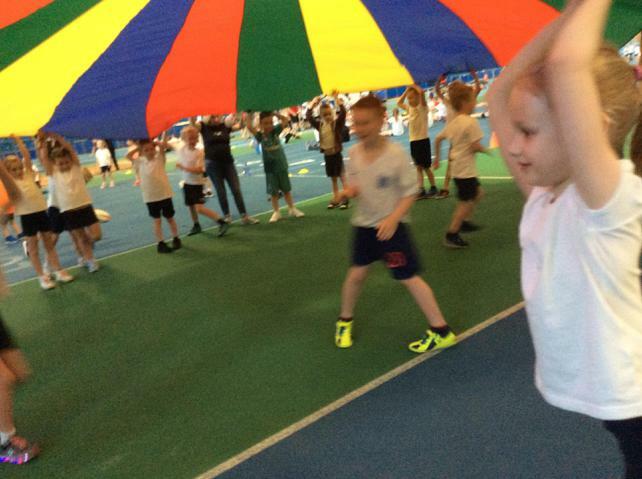 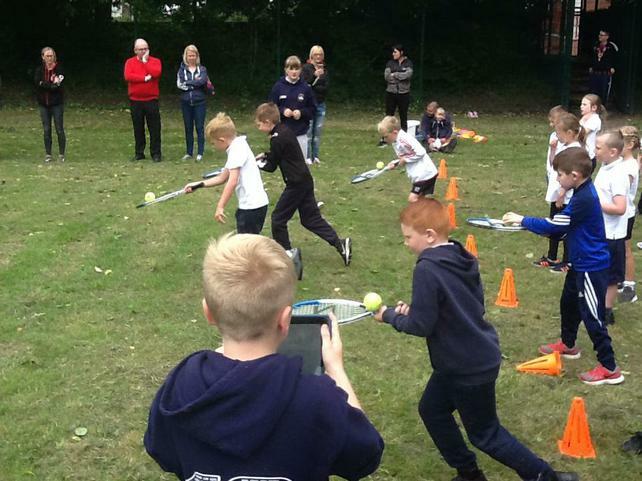 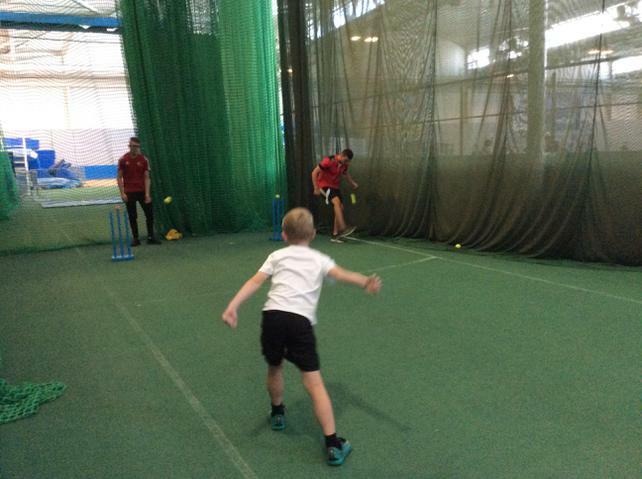 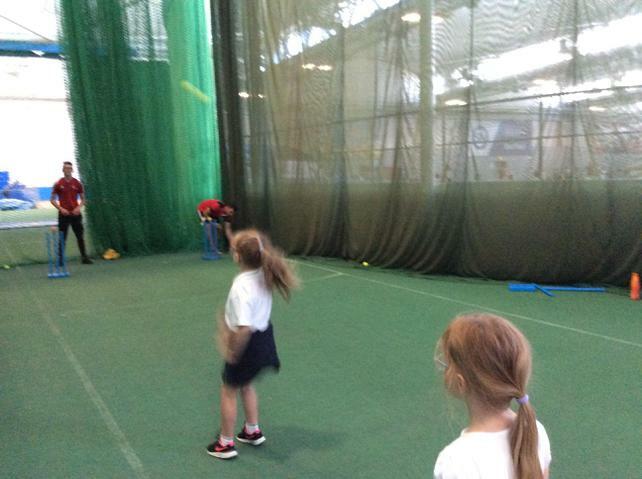 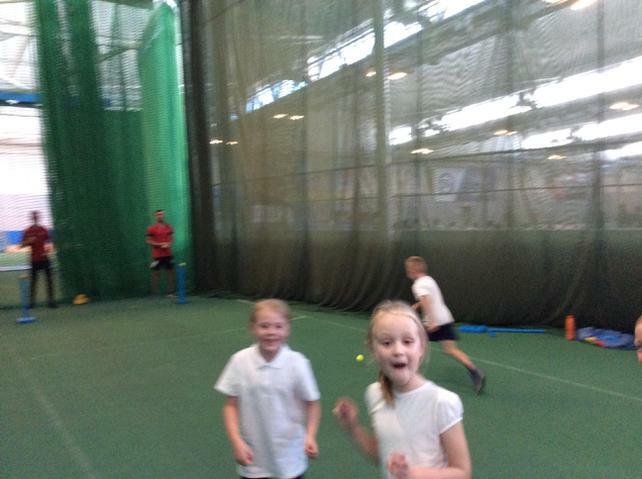 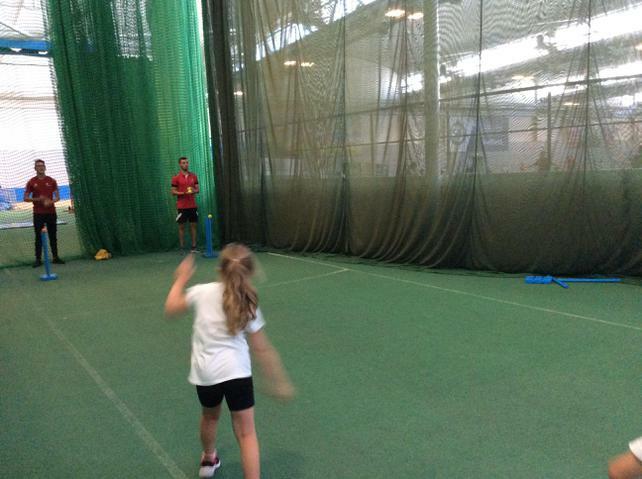 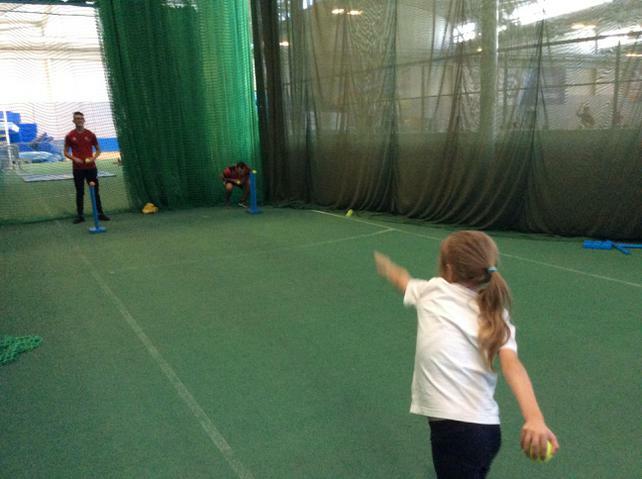 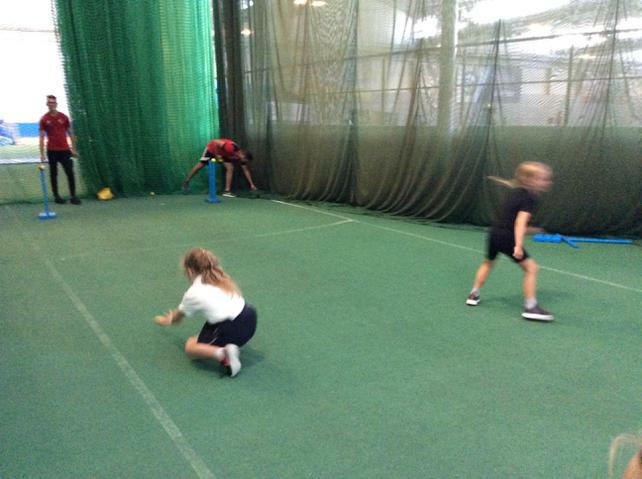 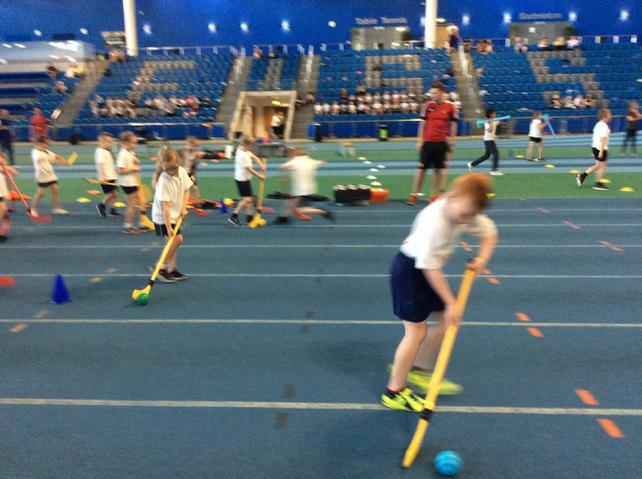 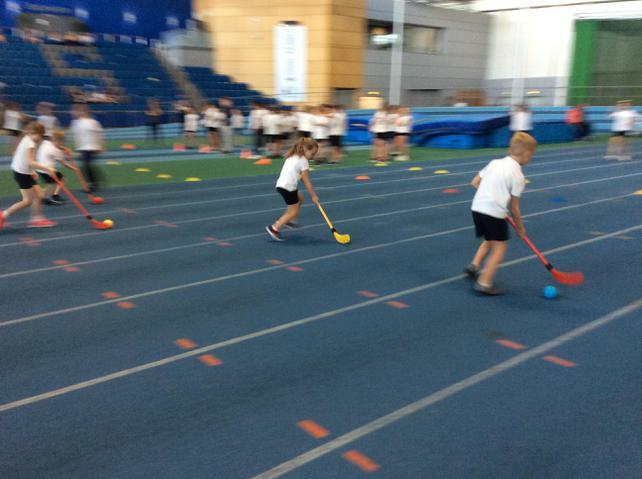 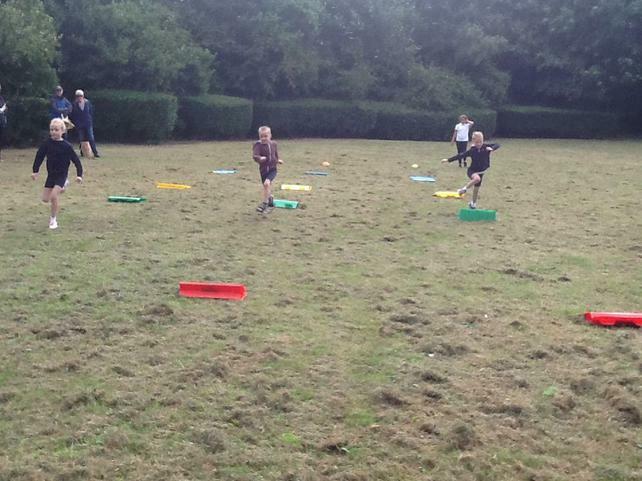 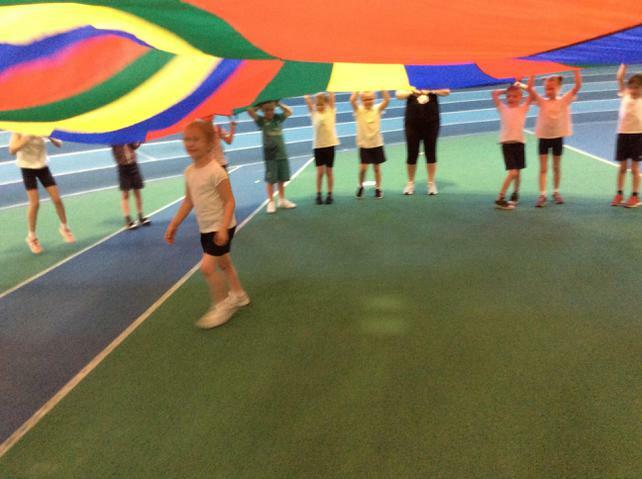 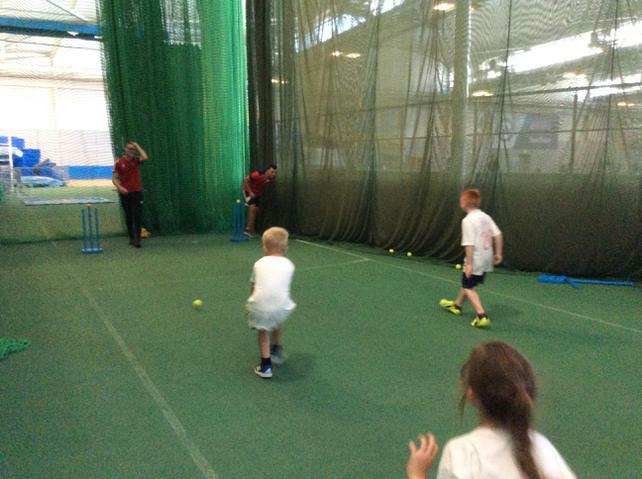 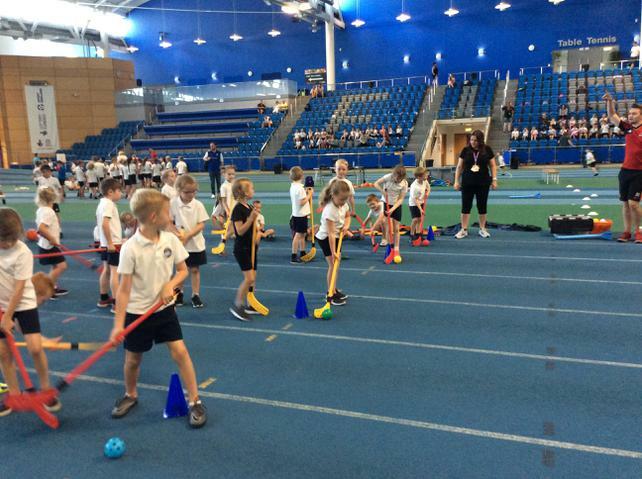 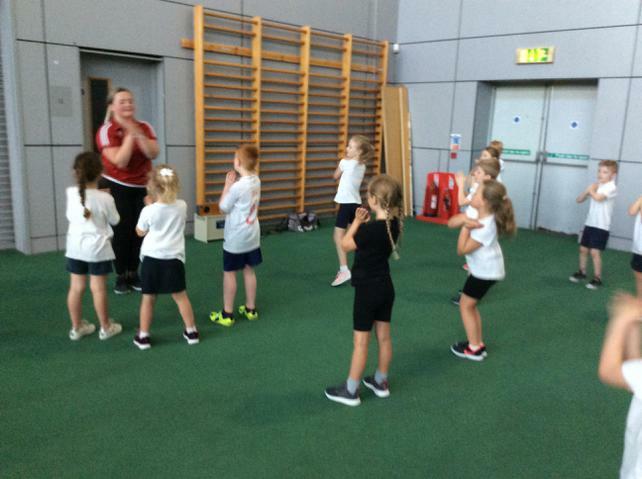 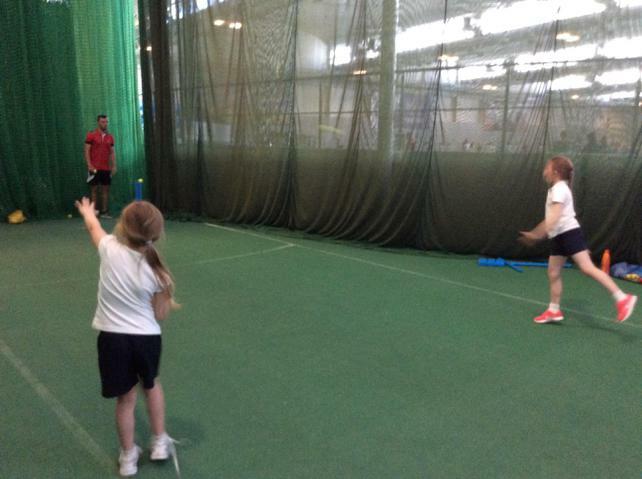 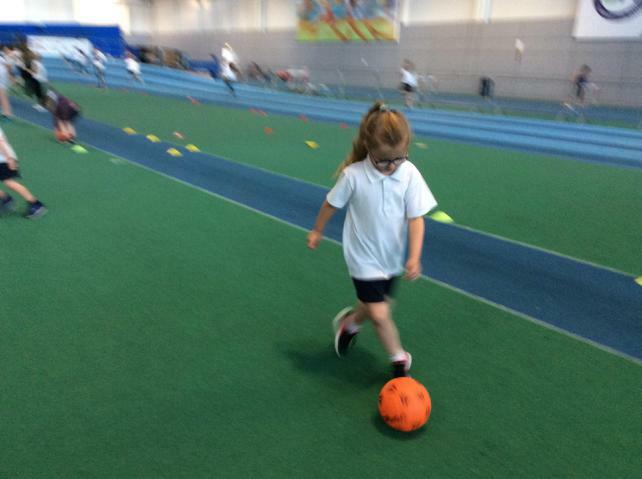 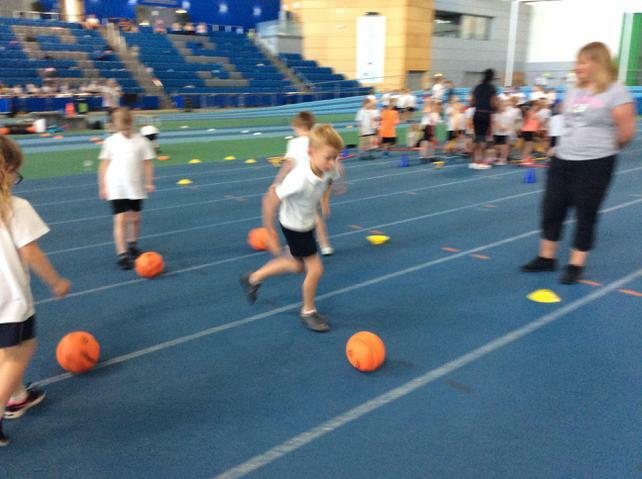 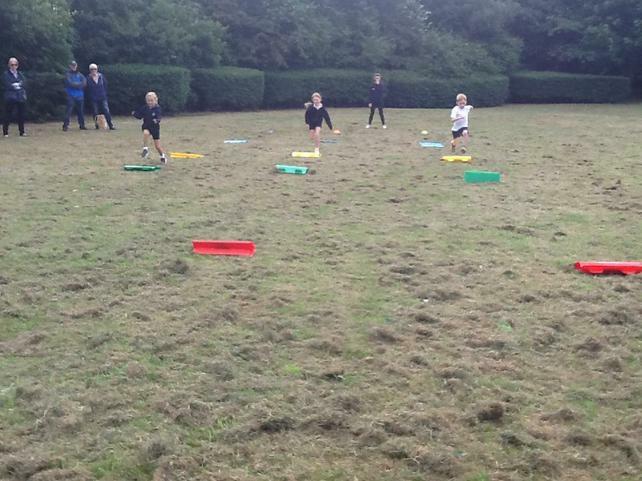 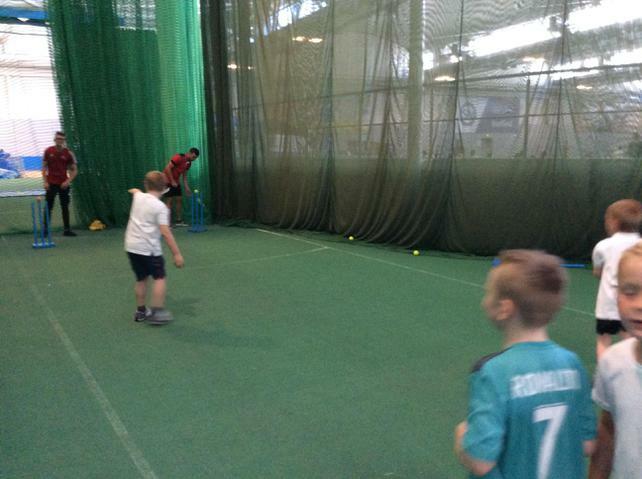 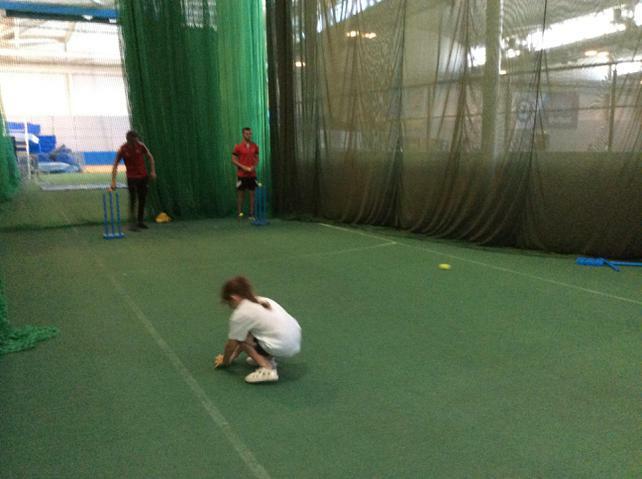 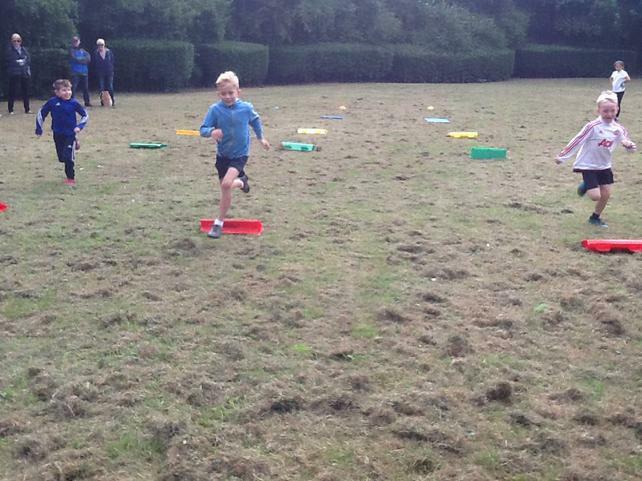 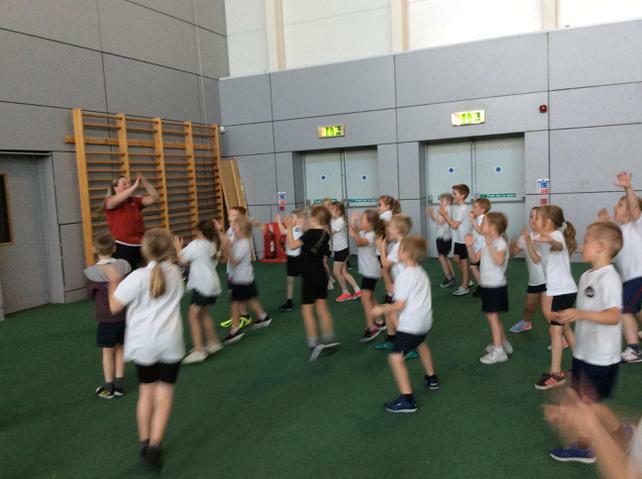 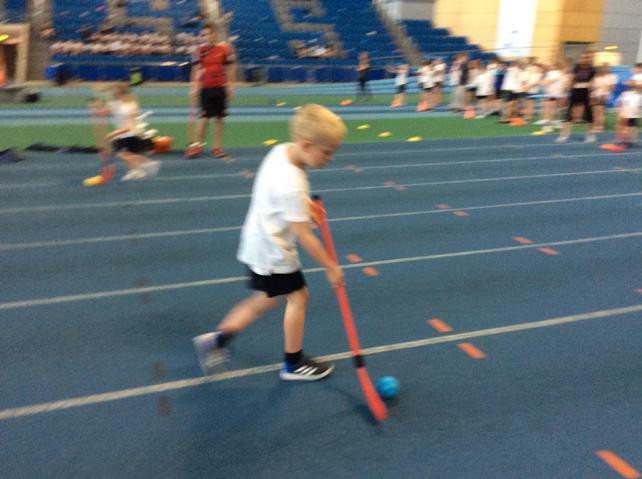 Class 2 really enjoyed taking part in all of the activities and showed how truly talented they are at a variety of different sports. 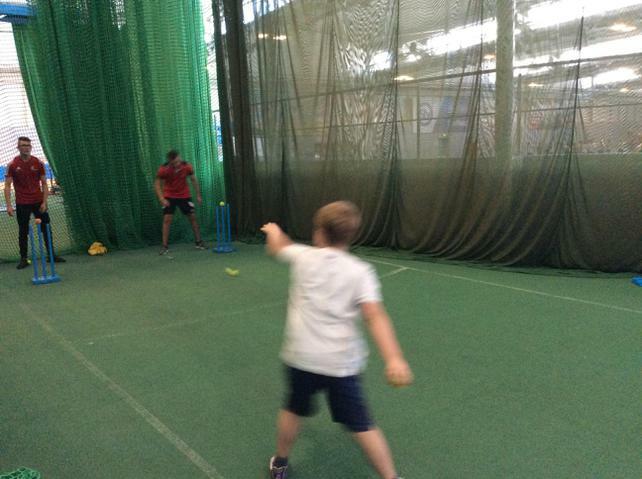 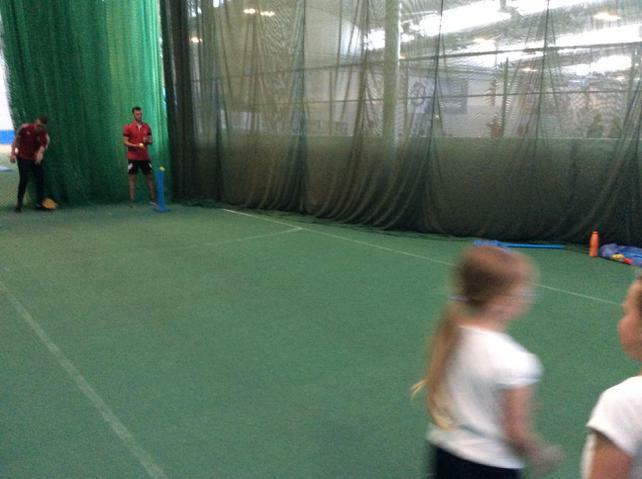 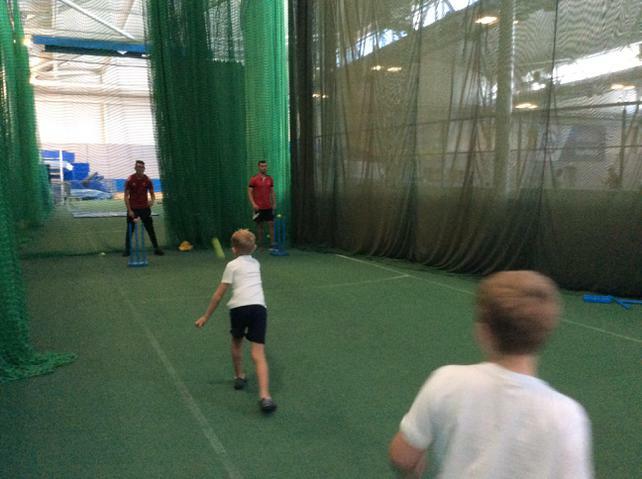 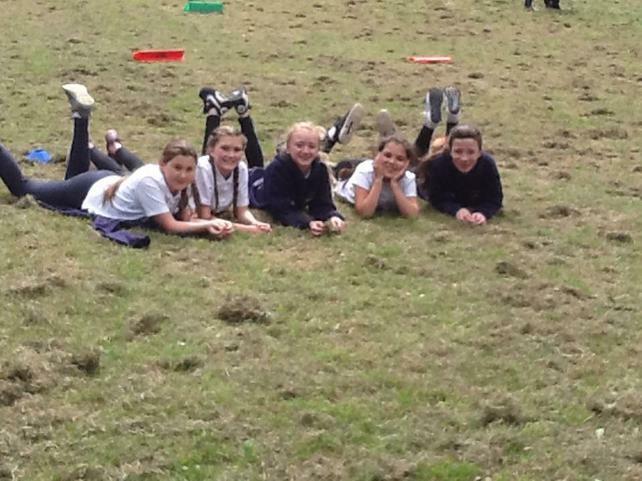 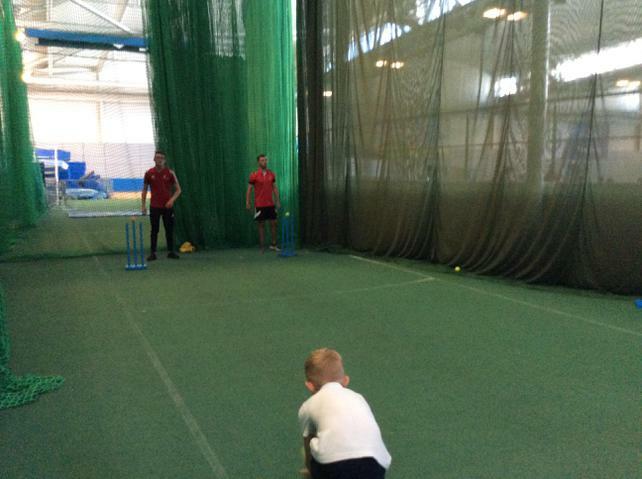 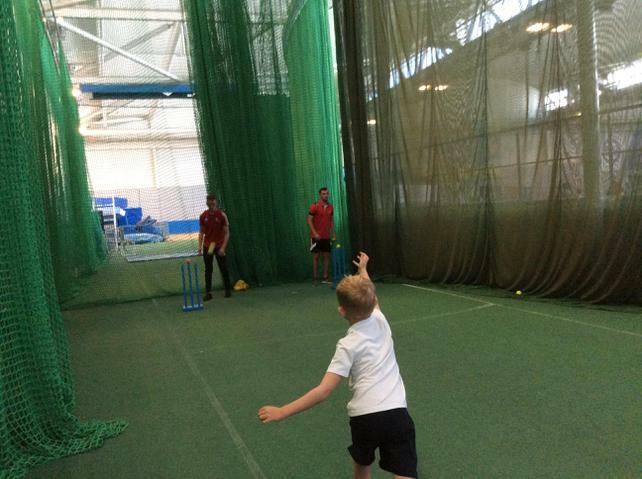 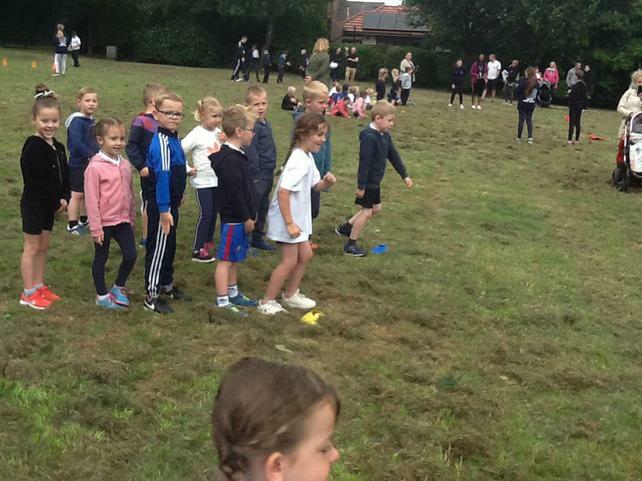 Well done to everyone who took part, what a brilliant day it was! 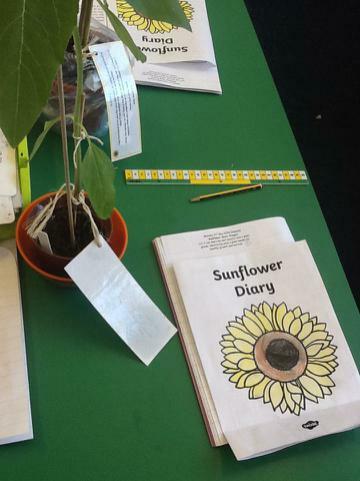 Class 2 brought their sunflowers back into school this week, ready to show them to others and to measure and compare them. 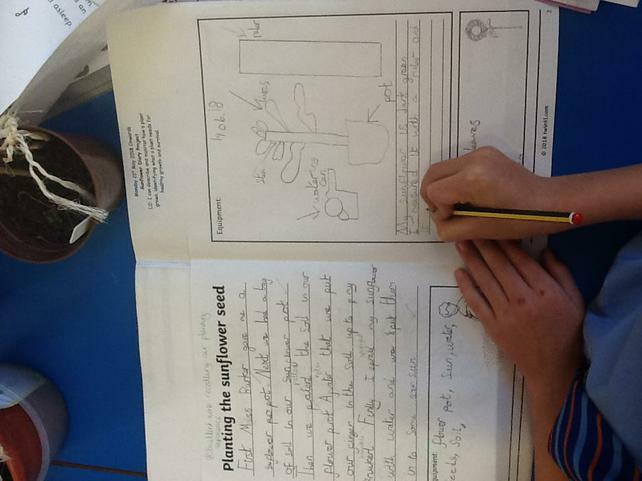 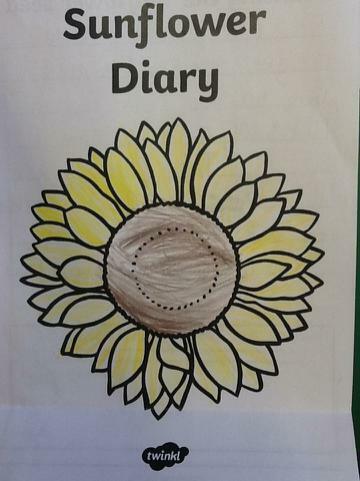 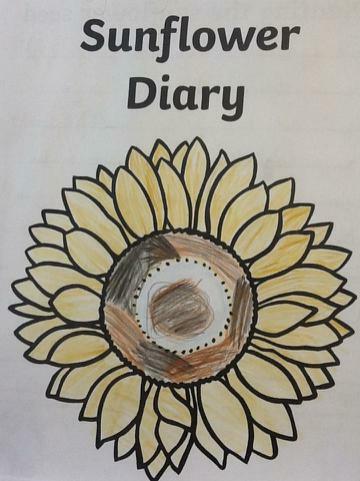 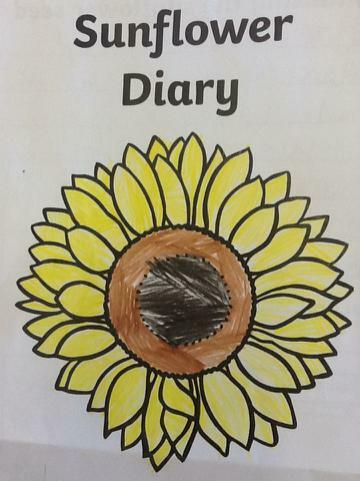 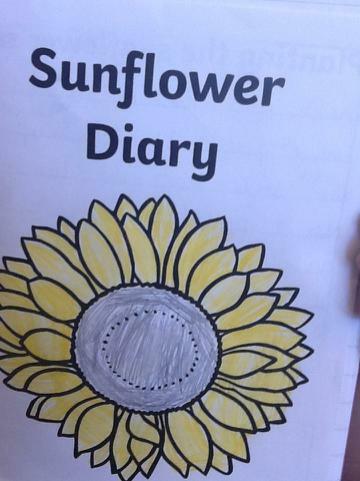 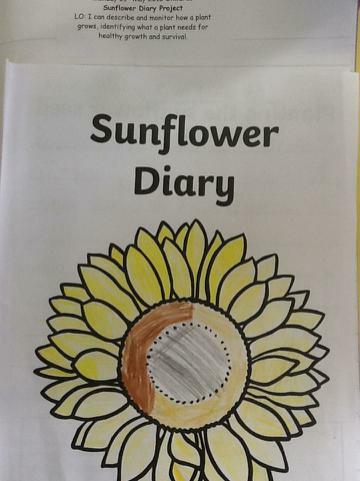 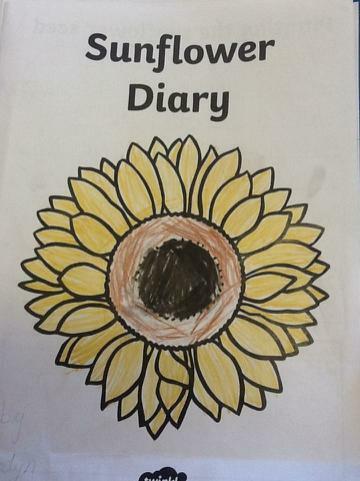 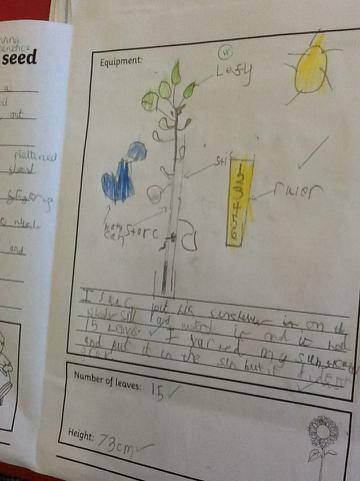 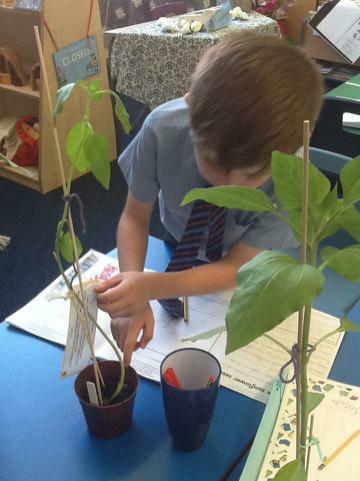 In a topic session, we added an entry to our Sunflower Diaries, recording lots of information about how we have cared for our sunflowers, measured them and what they look like now. 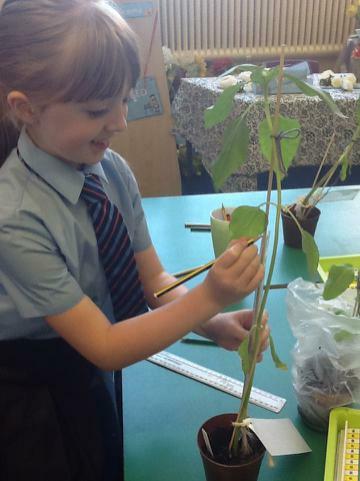 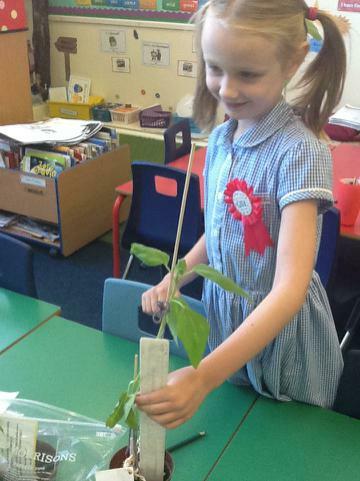 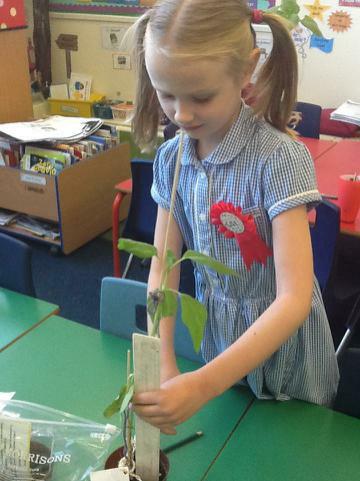 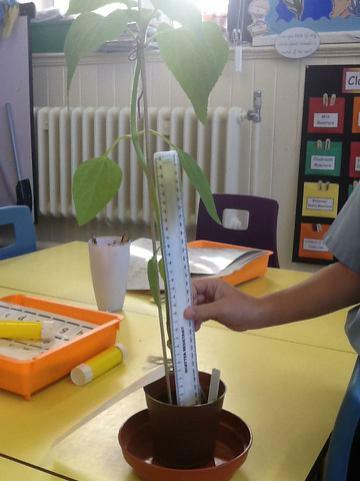 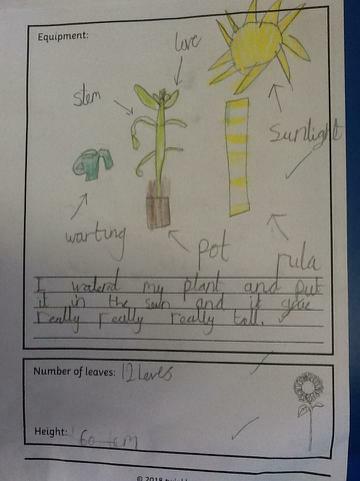 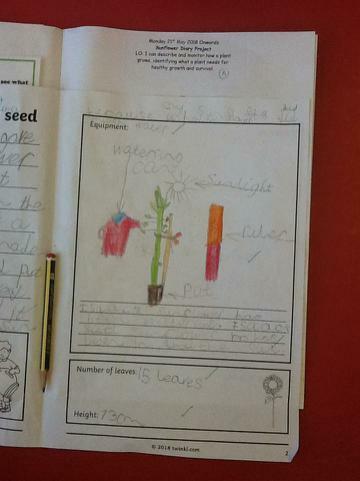 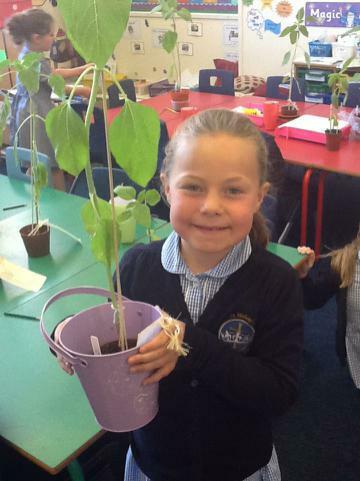 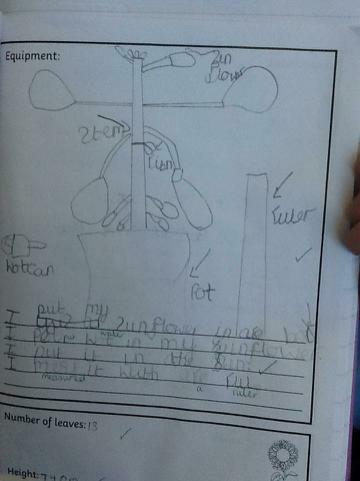 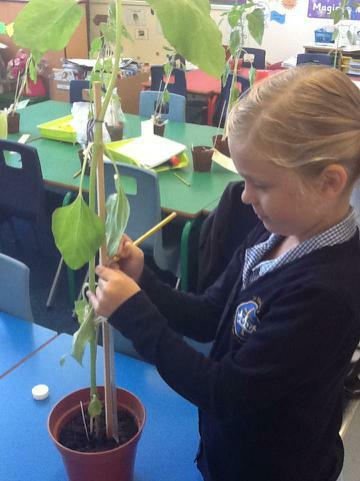 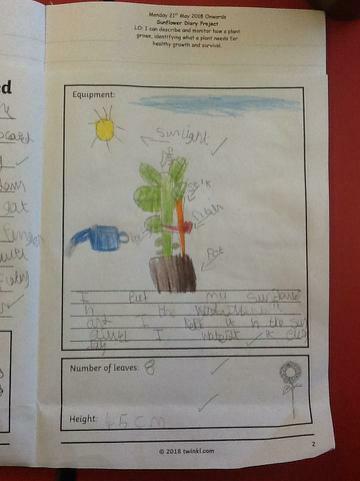 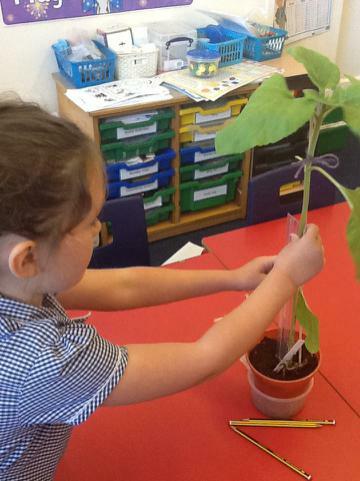 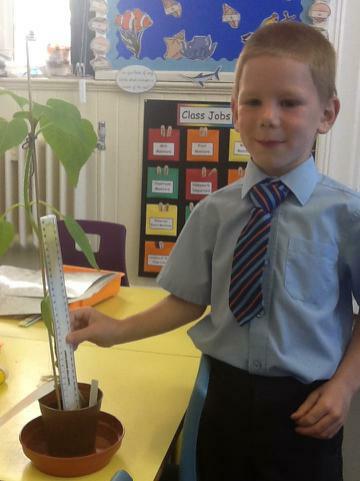 In Maths, we have also moved onto the topic of Length and we have estimated and measured the lengths of our sunflowers. 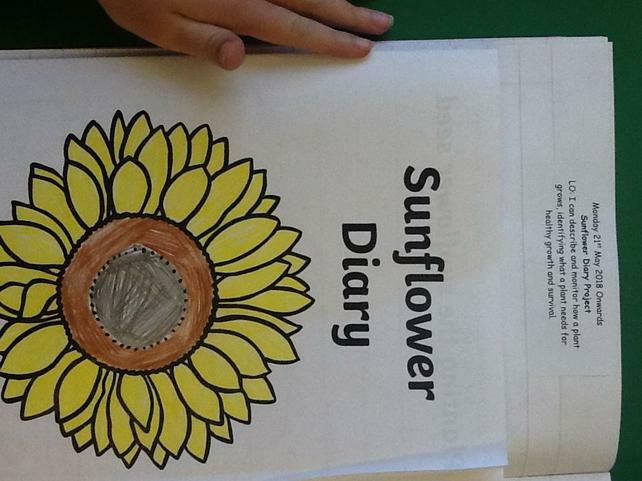 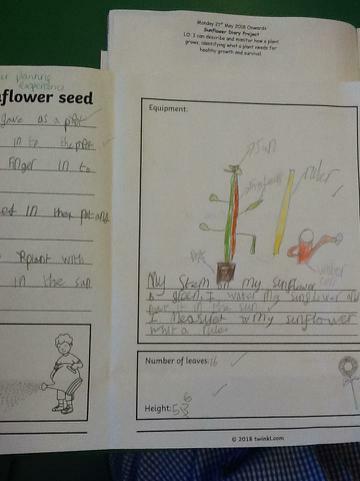 The children have worked very hard this week and have really enjoyed sharing their sunflowers with others. 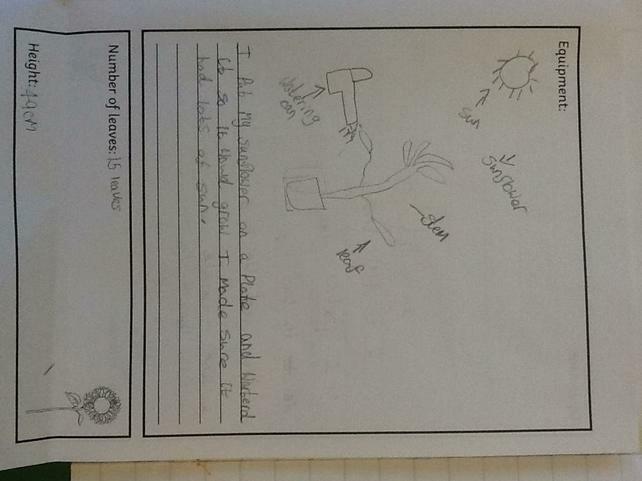 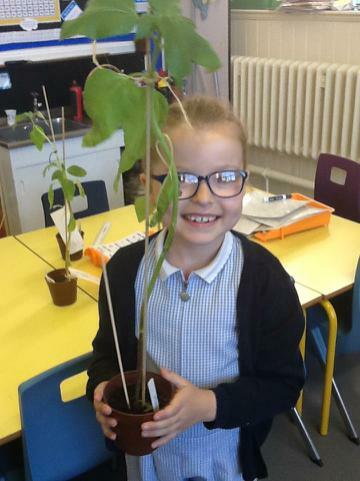 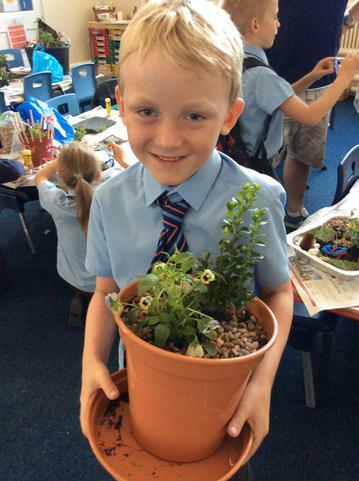 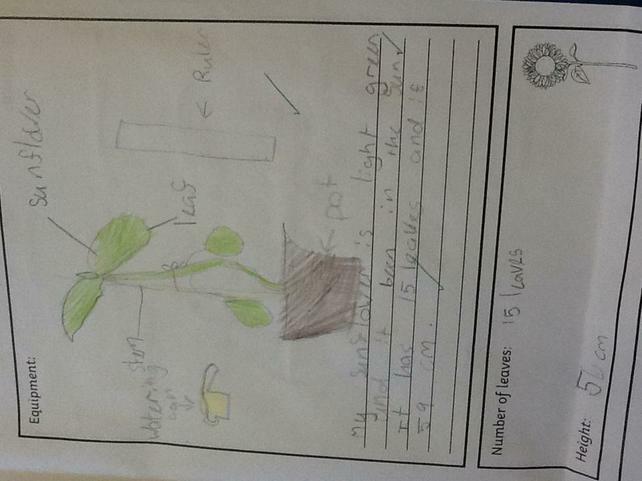 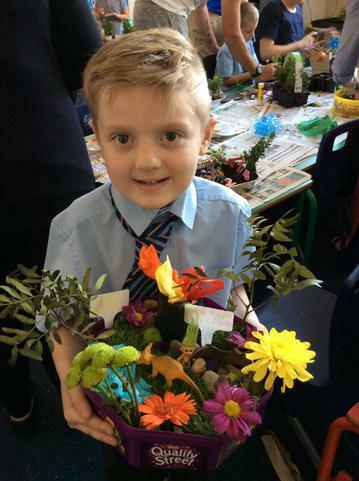 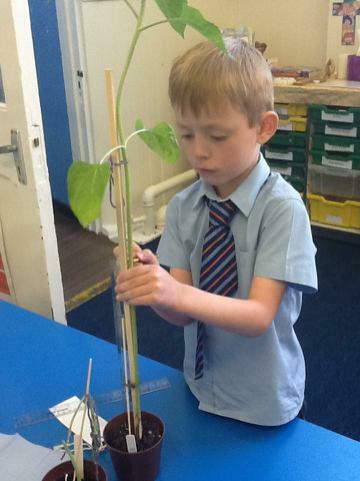 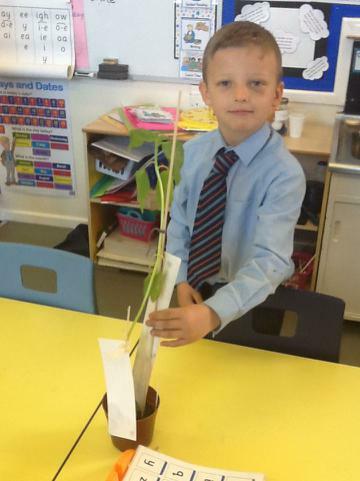 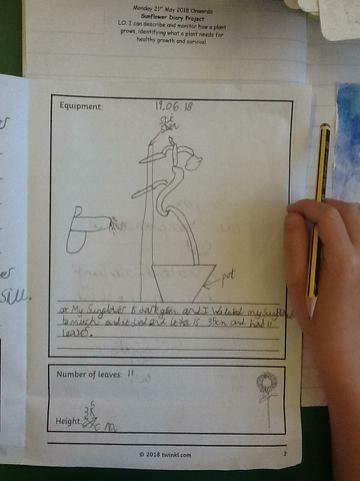 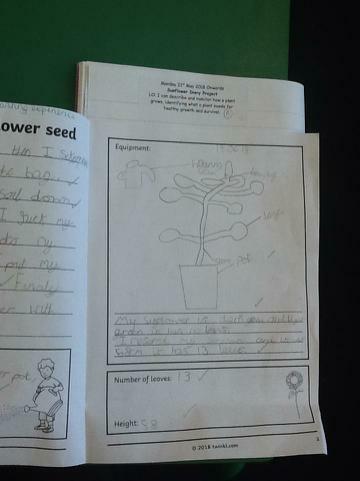 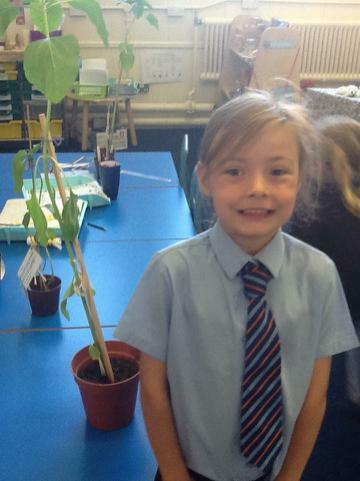 Please keep caring for them at home and I hope they grow as big as Jack's Beanstalk in our story of the week! 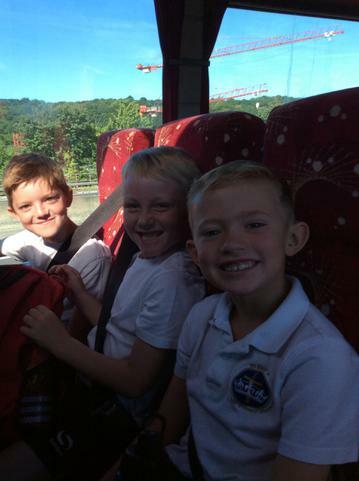 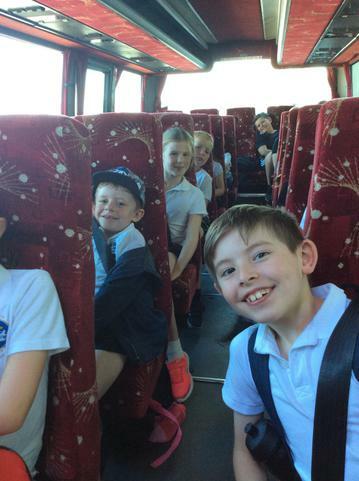 This week, Class 2 have returned to school happy to have had a wonderful break and ready to learn! 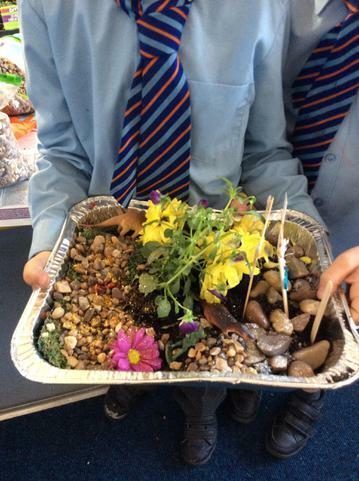 We have had a fantastic Art Week together focusing on the artist Claude Monet and writing stories inspired by one of his pictures as well as creating beautiful artwork in the style of his work. 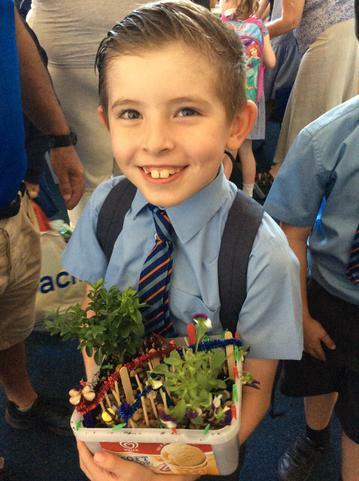 The children, also, have taken part in a wonderful Federation Mass which they presented beautifully to our whole school and parents that attended. 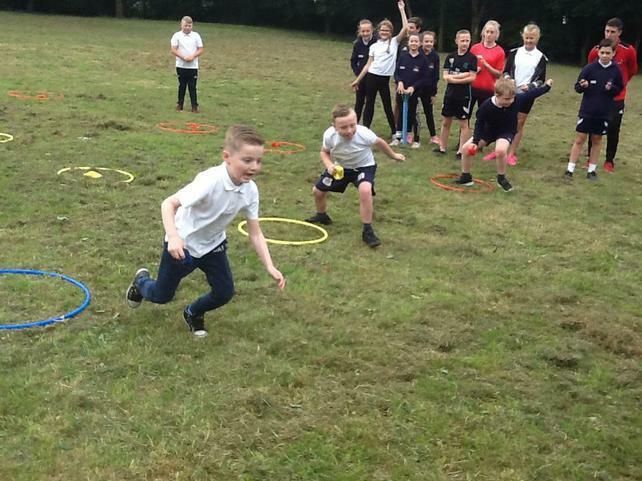 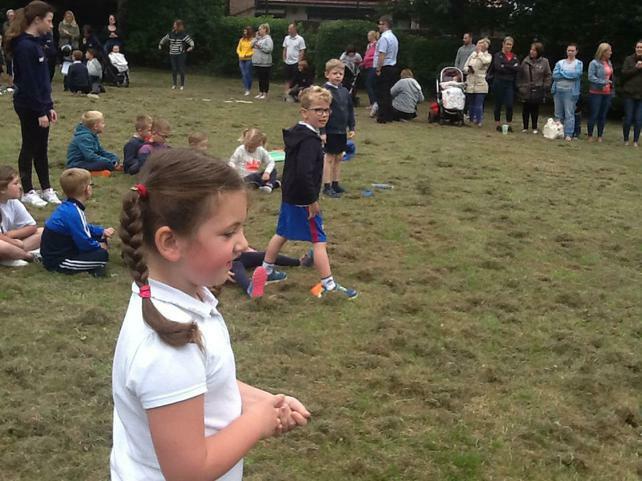 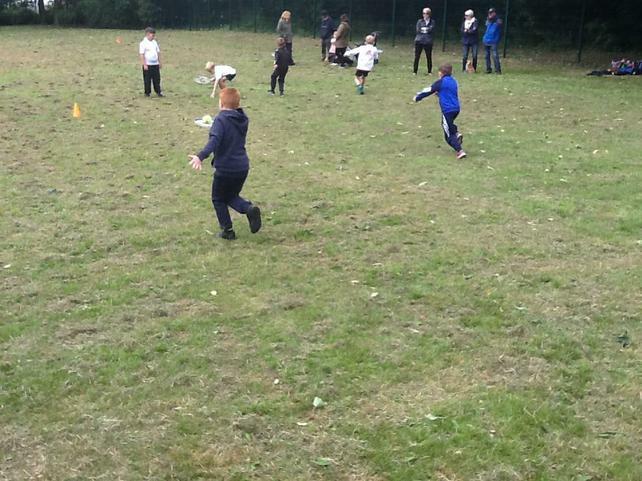 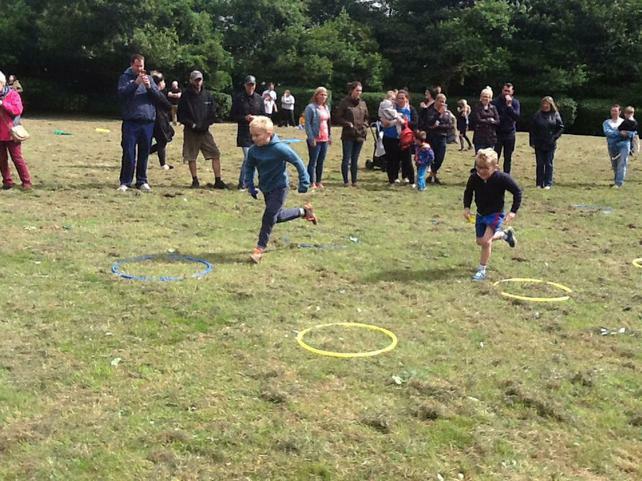 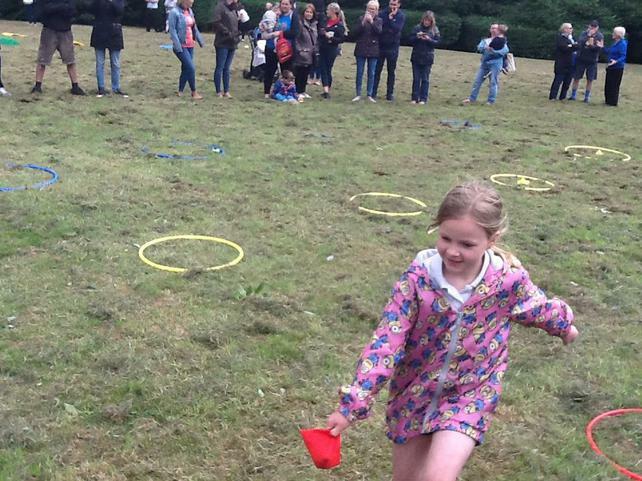 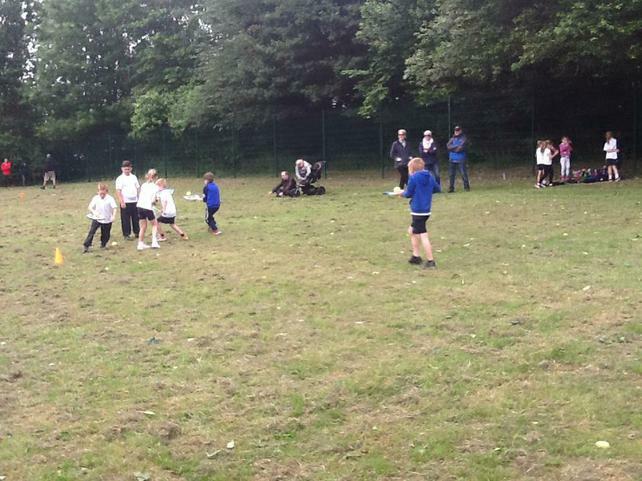 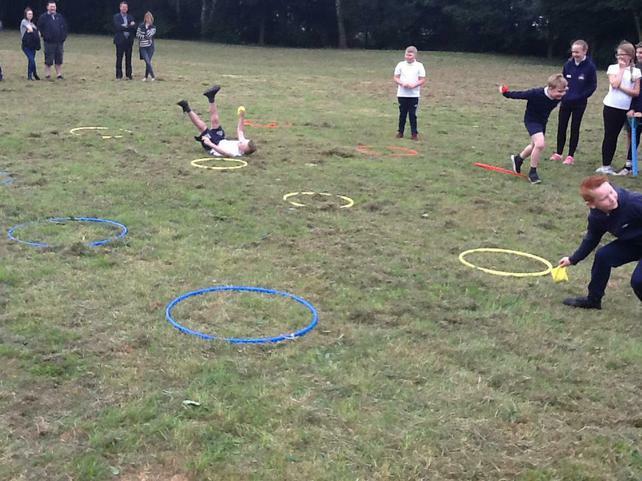 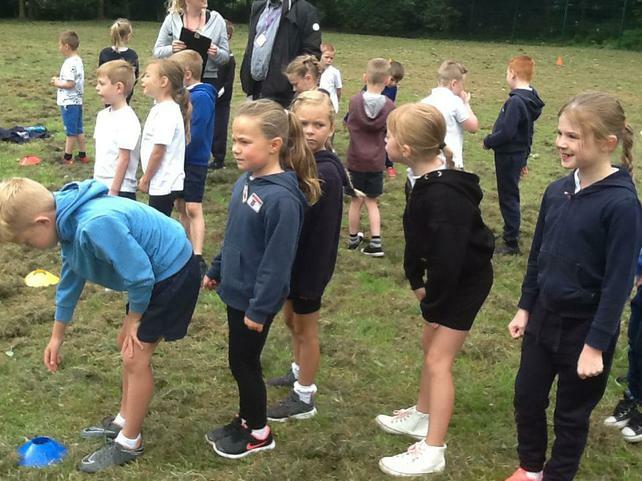 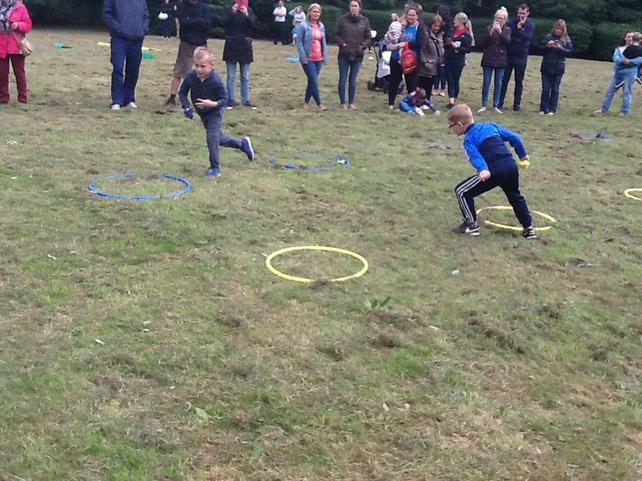 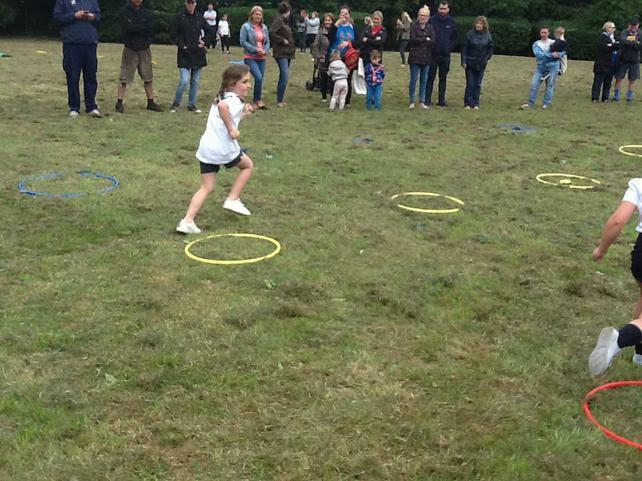 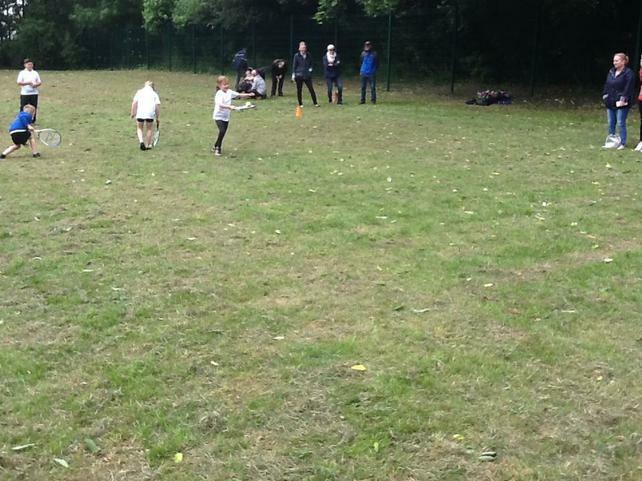 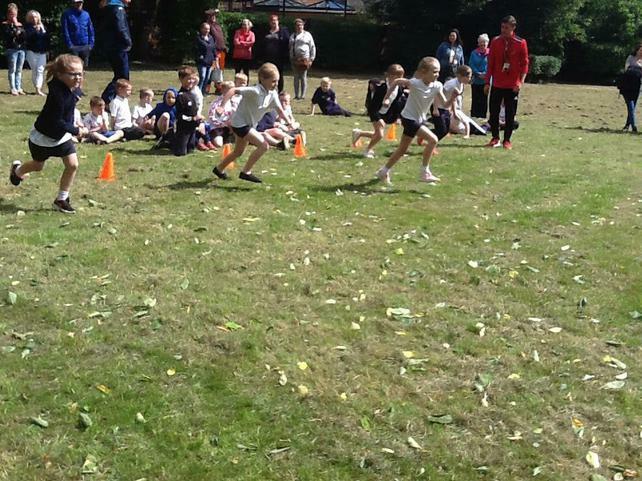 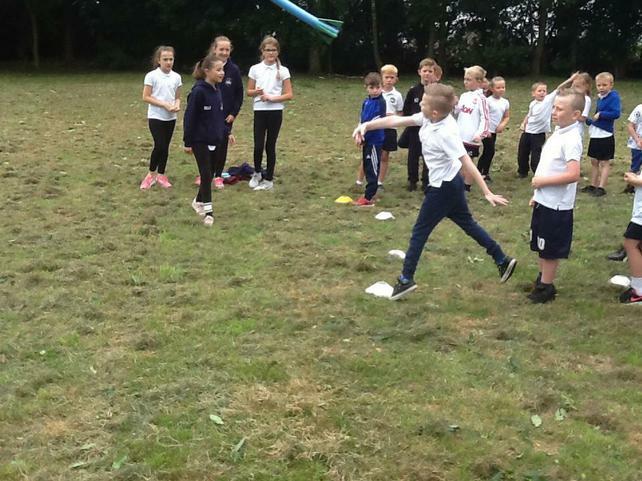 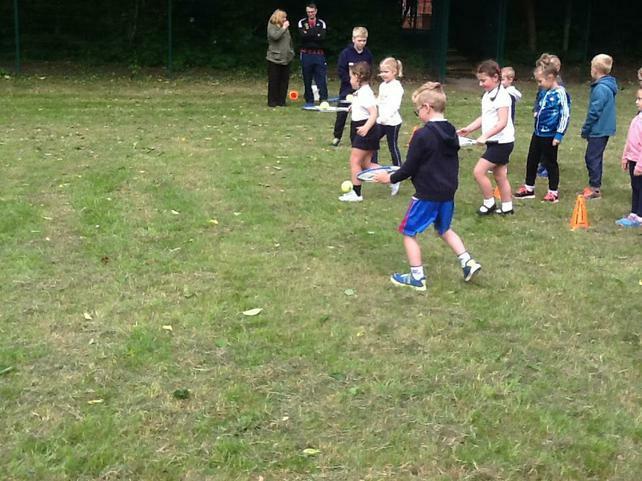 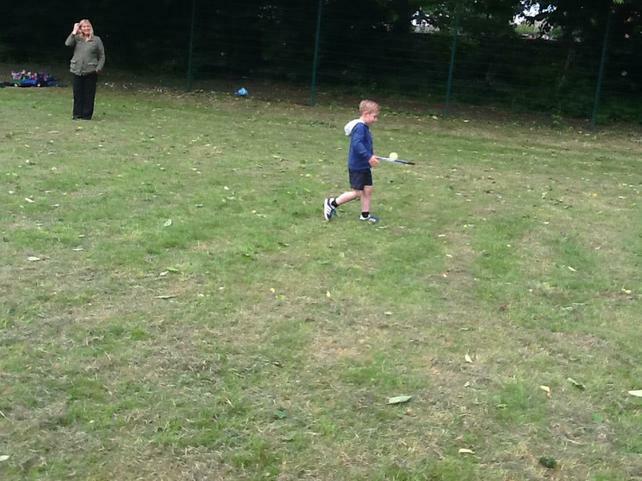 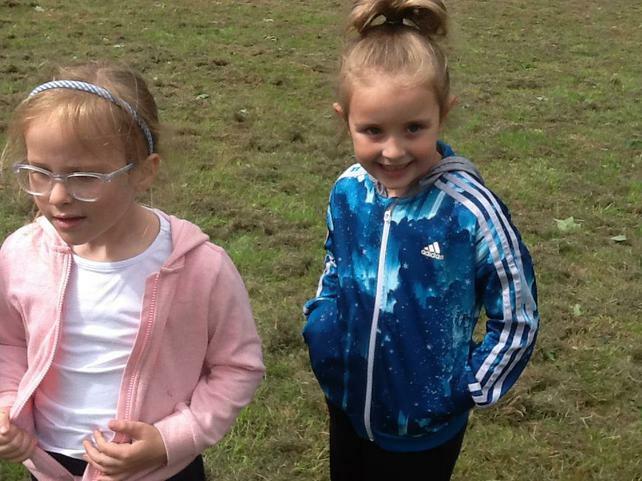 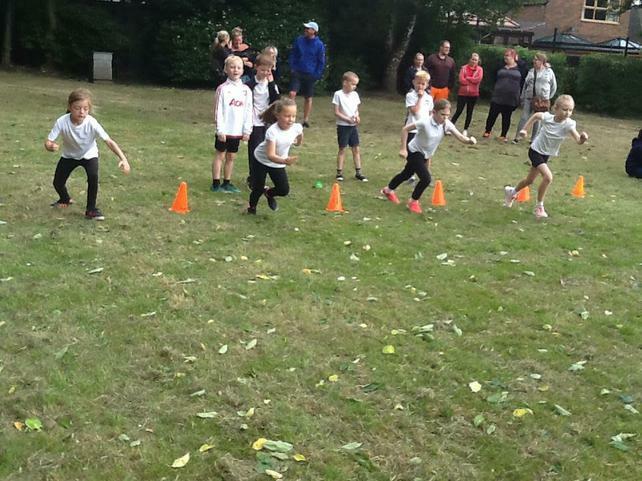 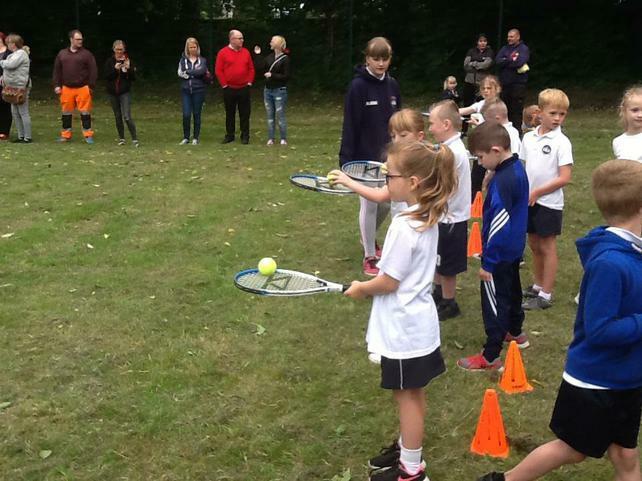 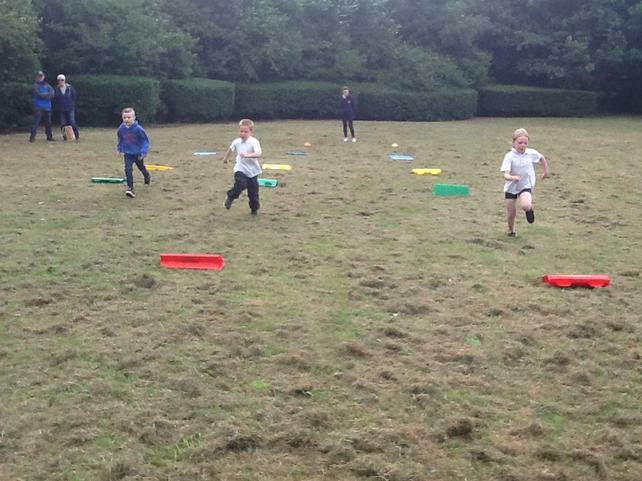 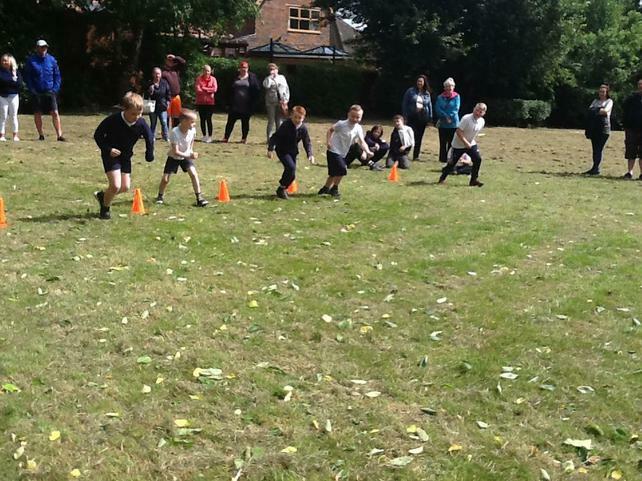 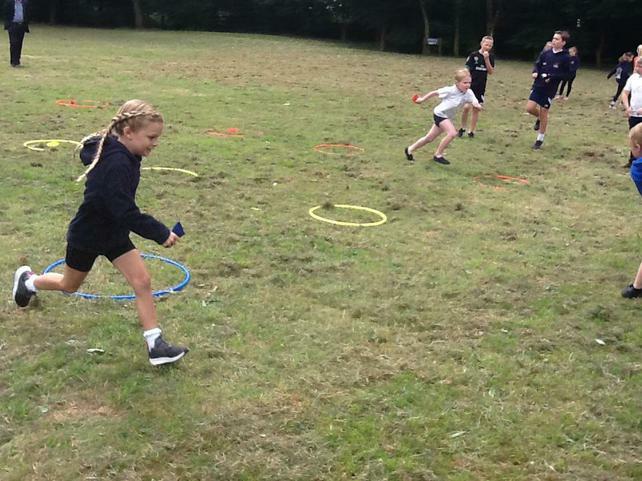 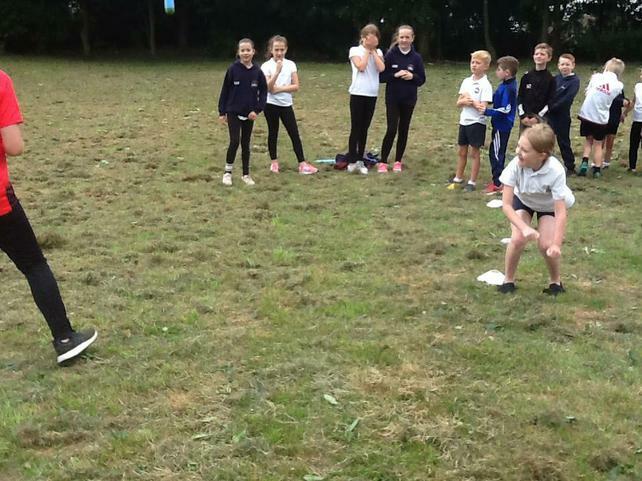 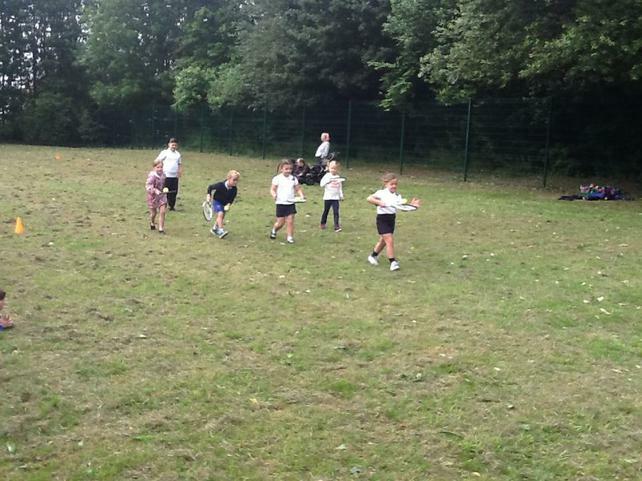 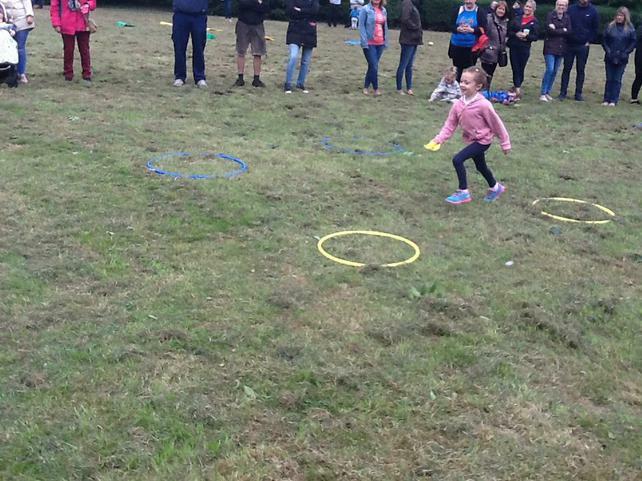 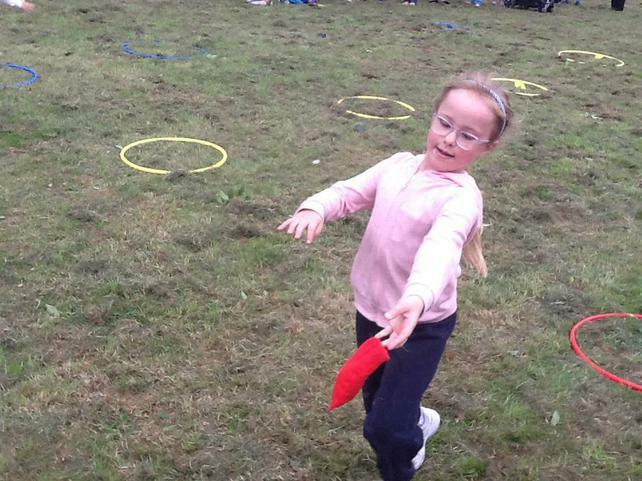 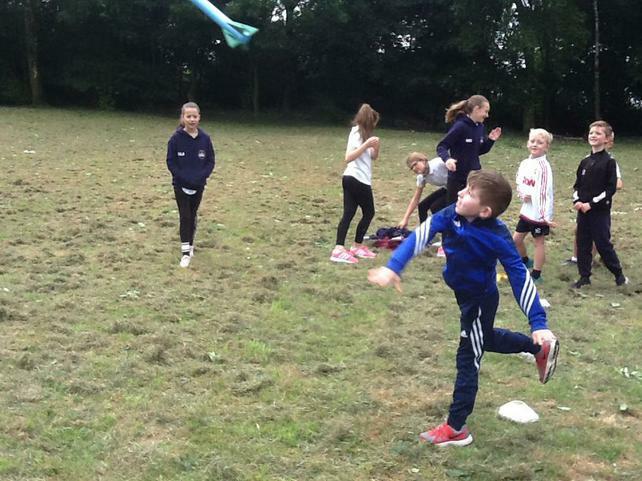 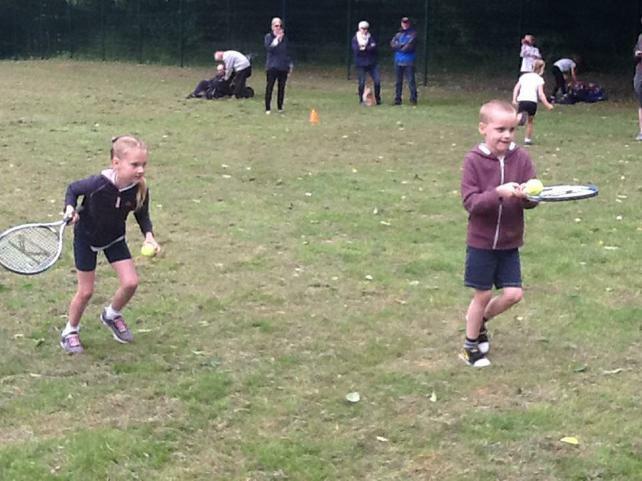 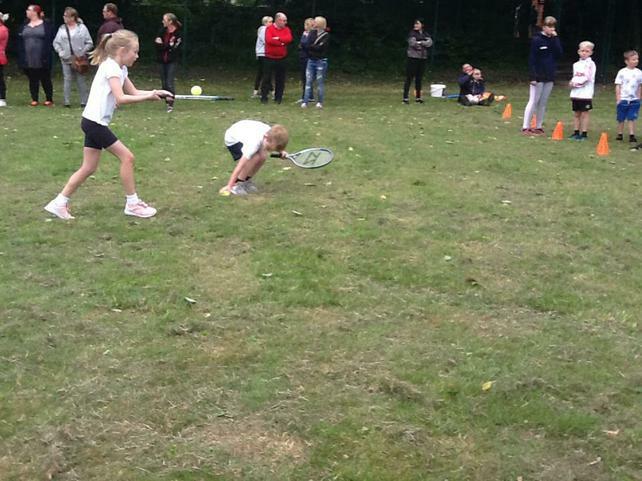 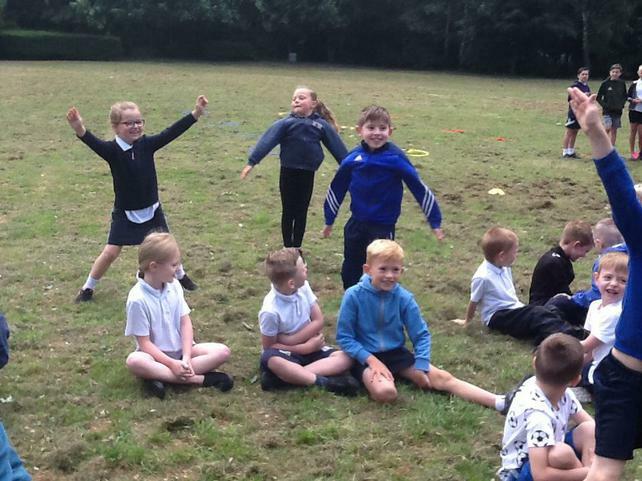 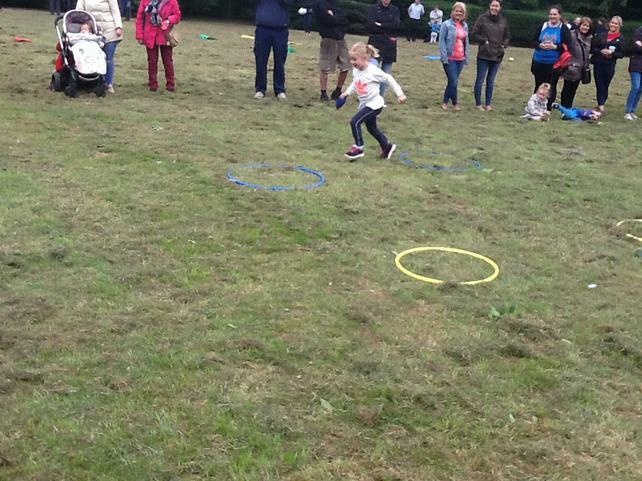 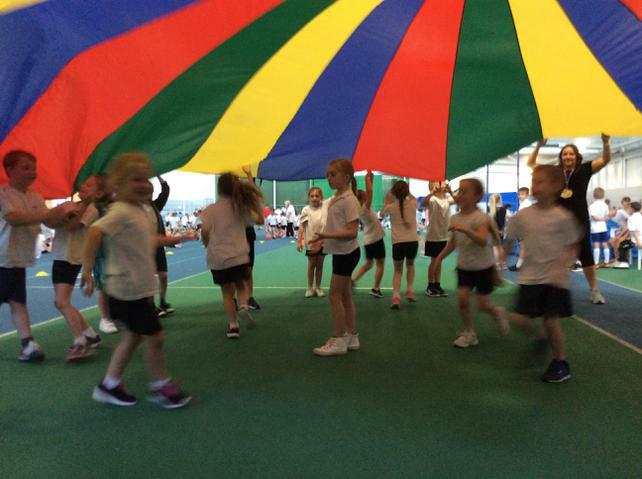 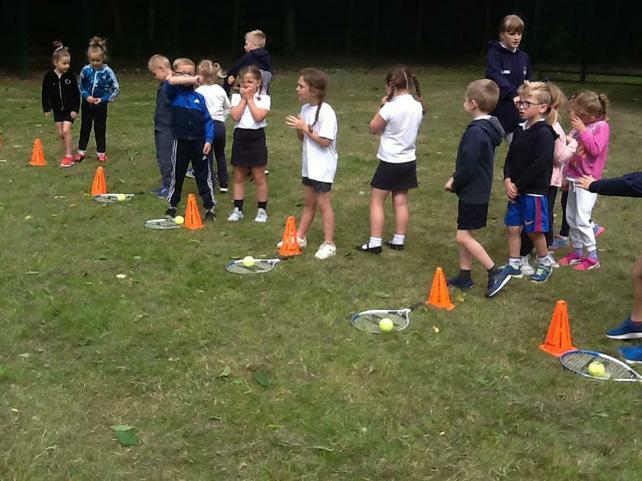 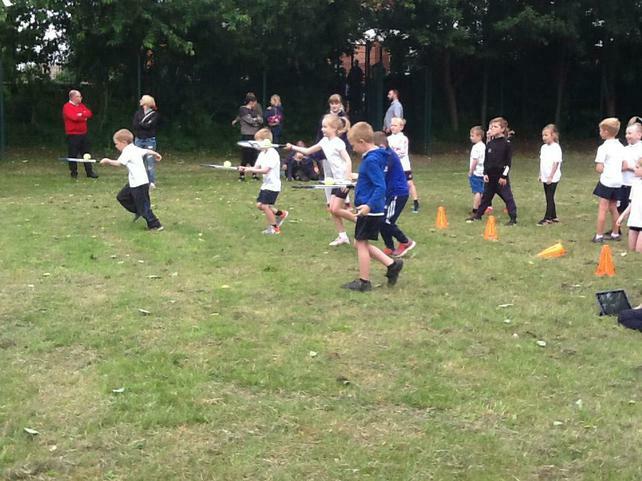 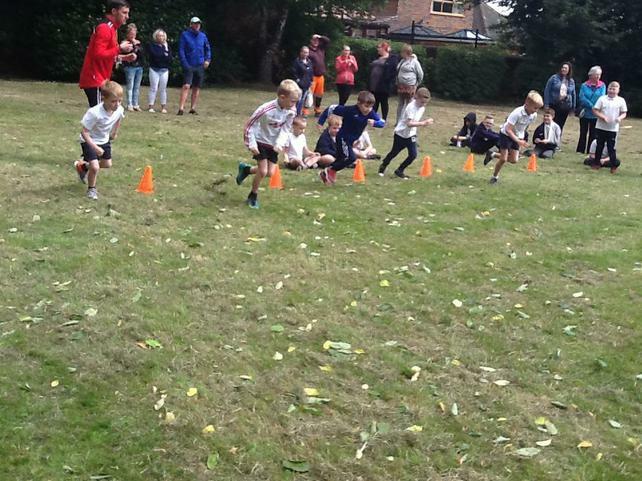 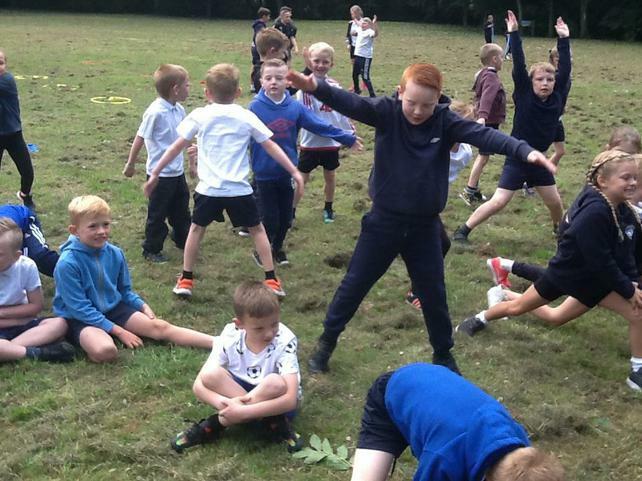 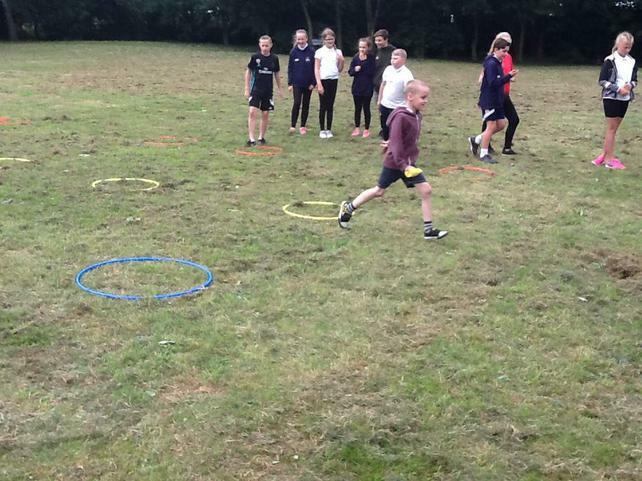 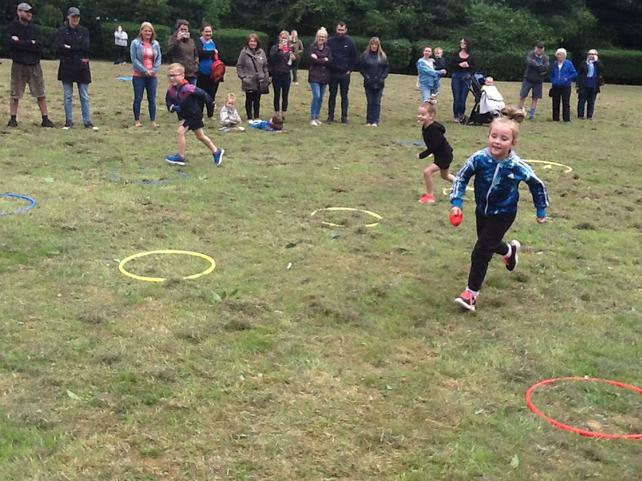 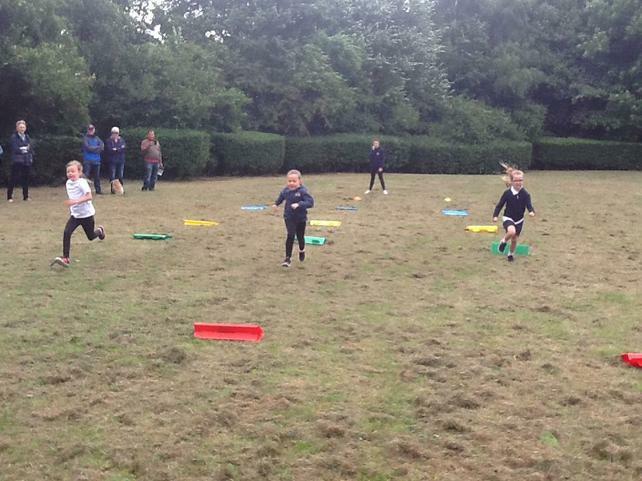 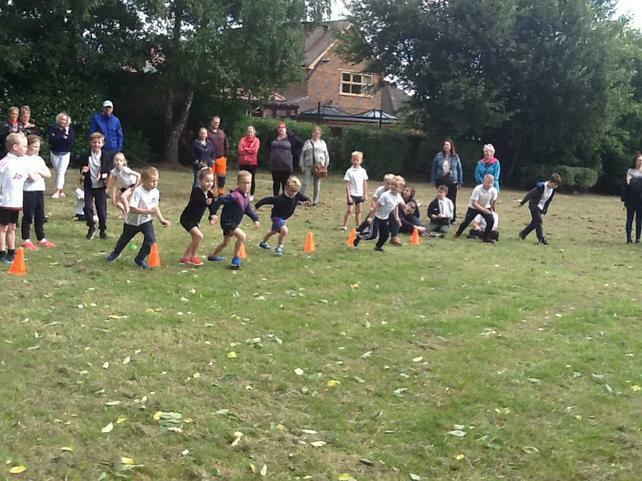 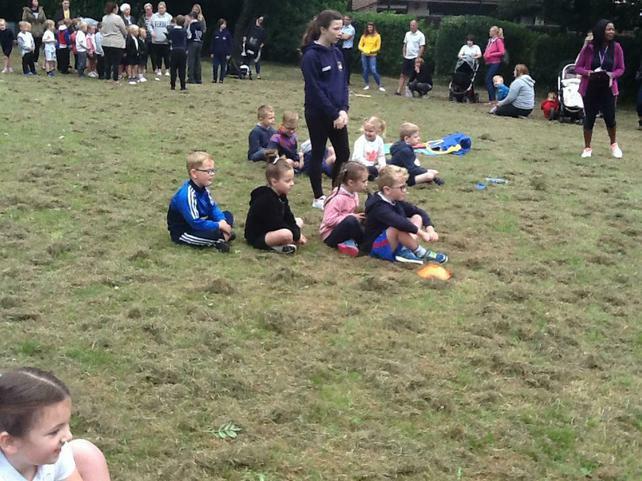 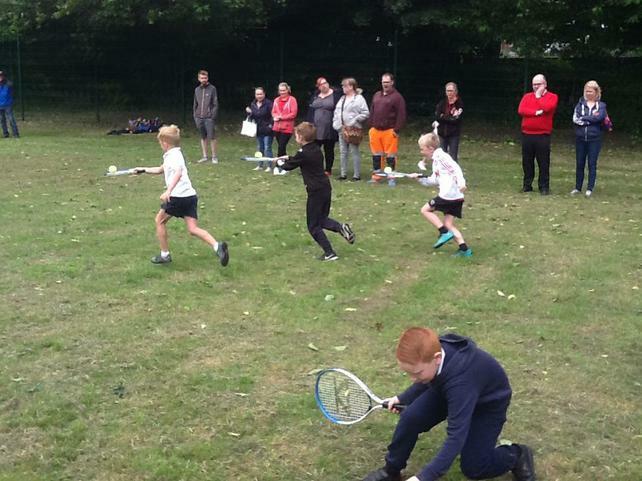 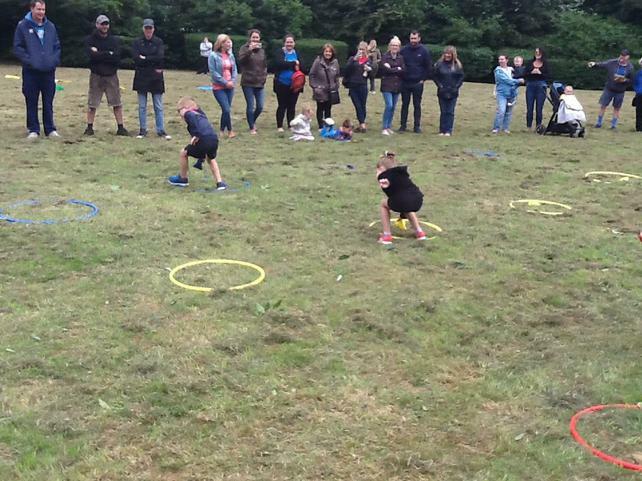 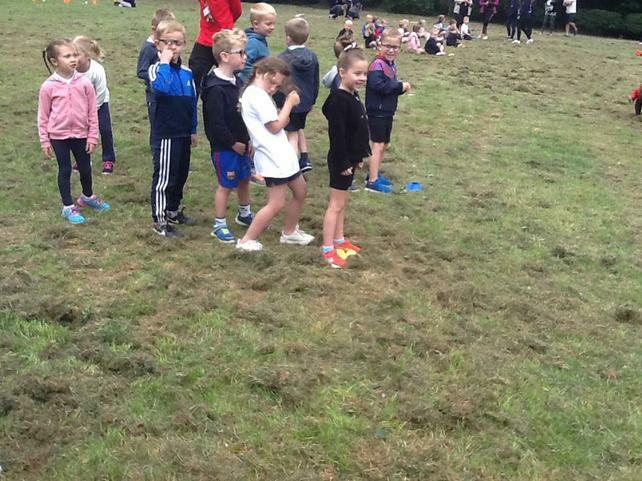 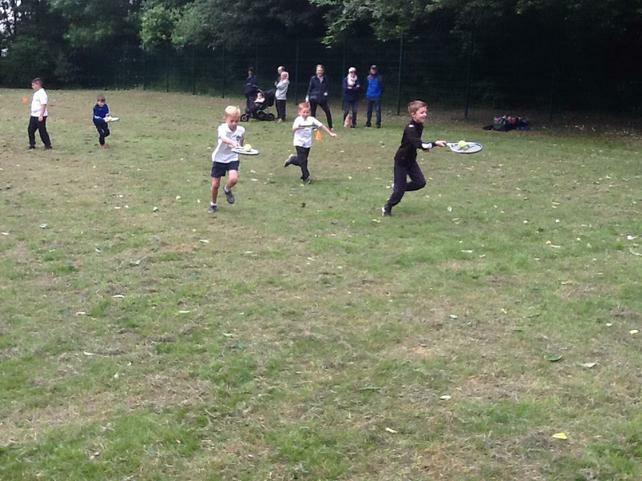 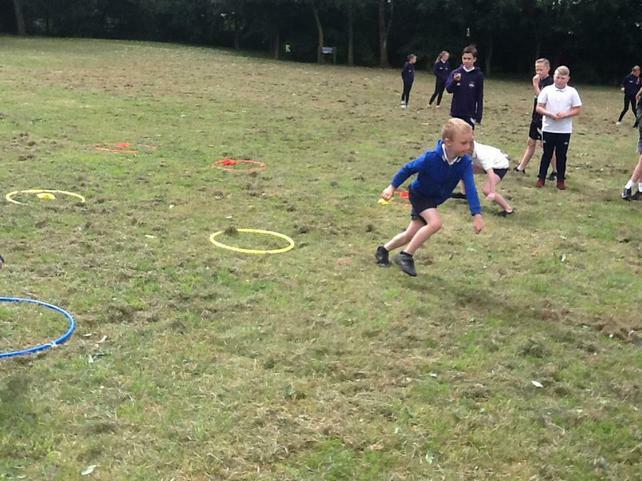 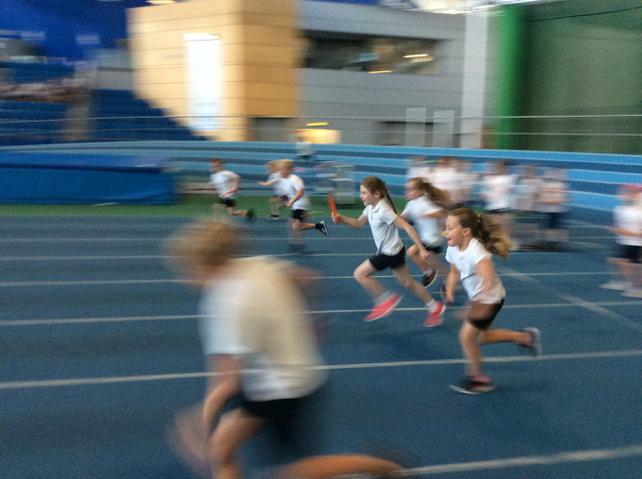 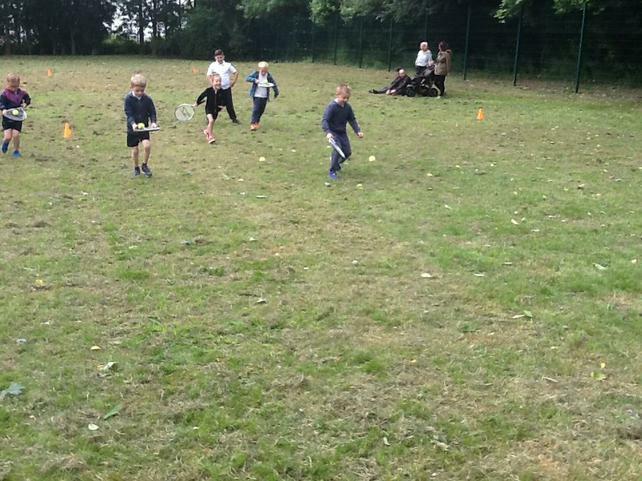 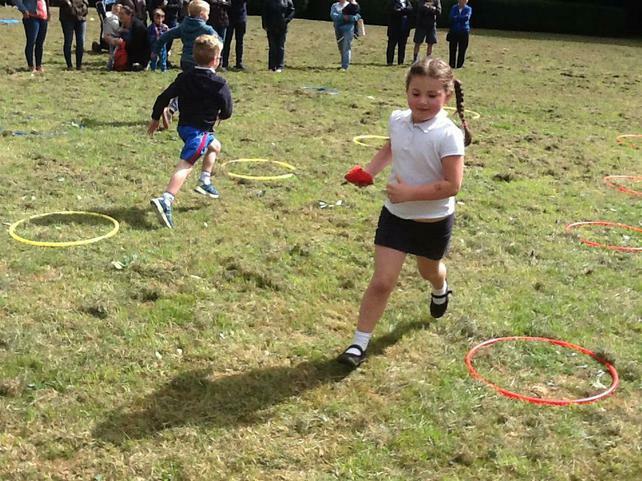 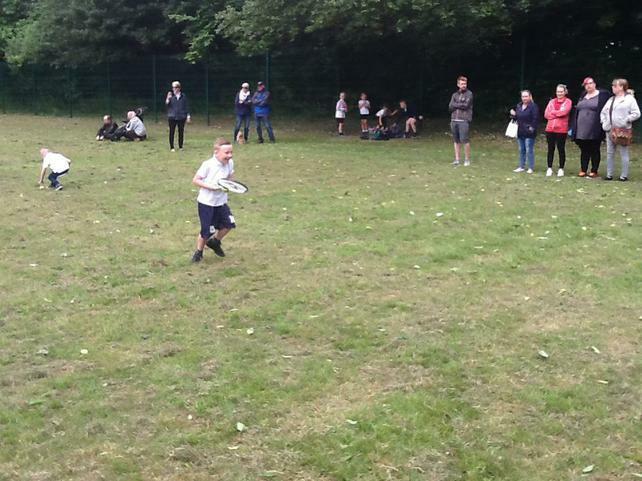 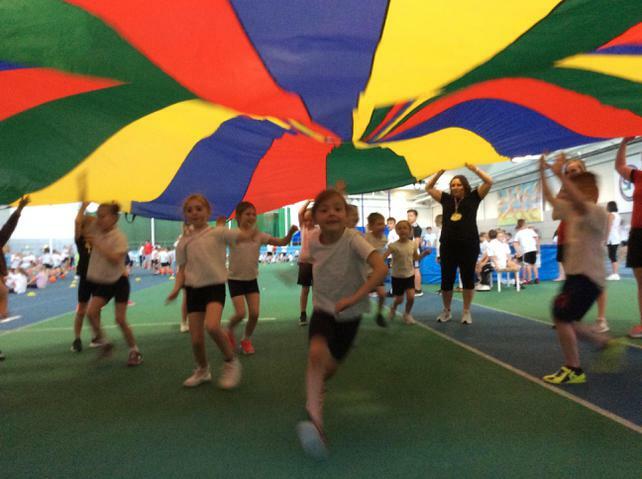 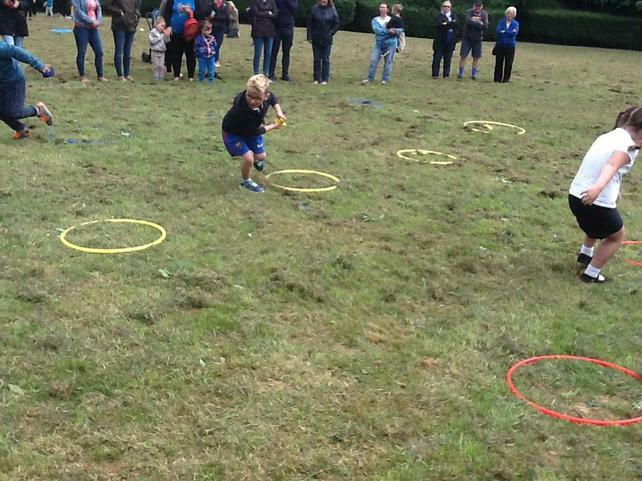 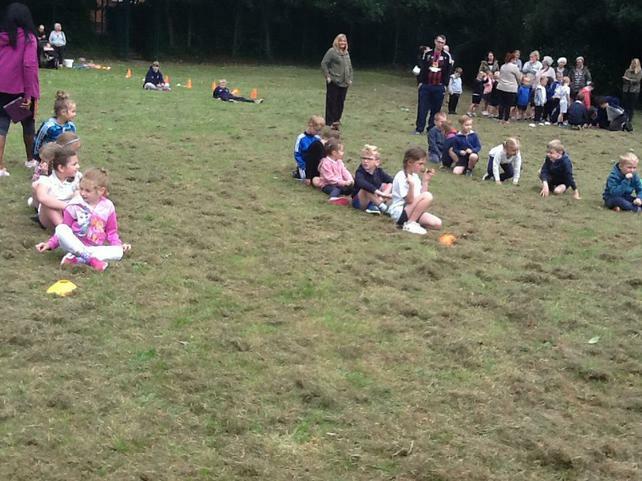 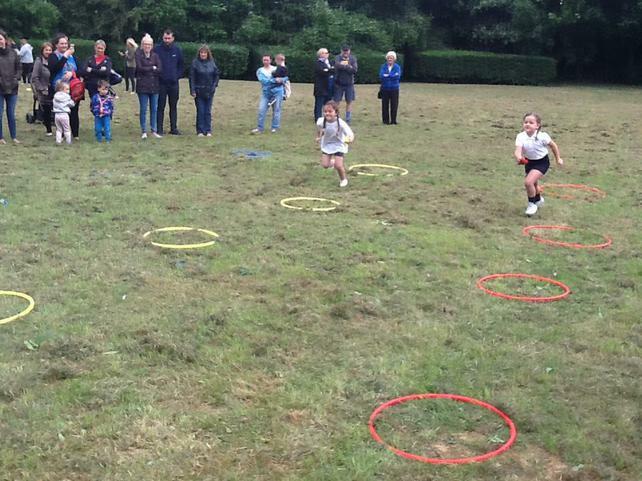 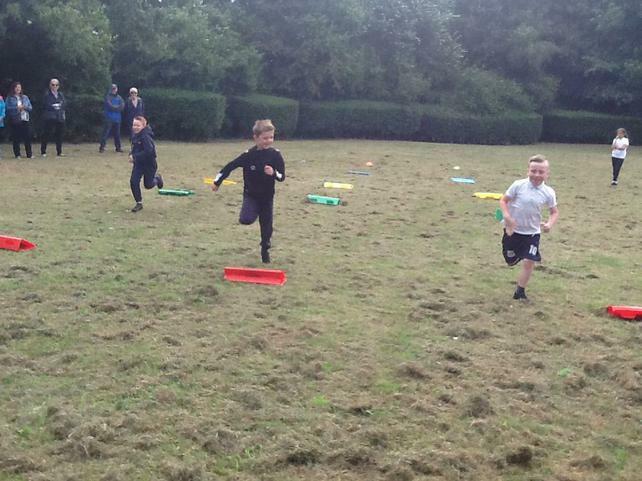 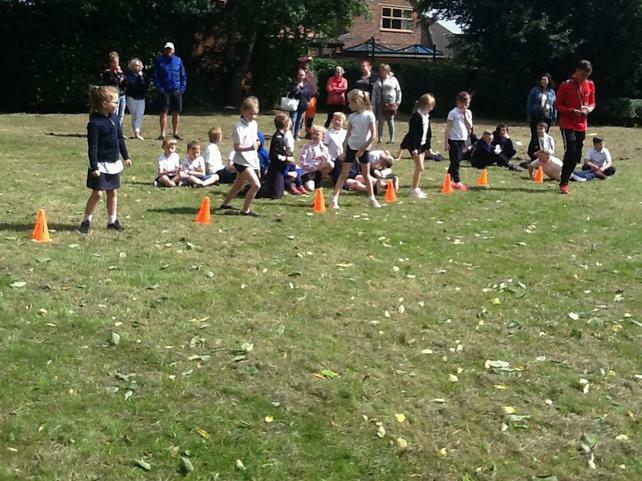 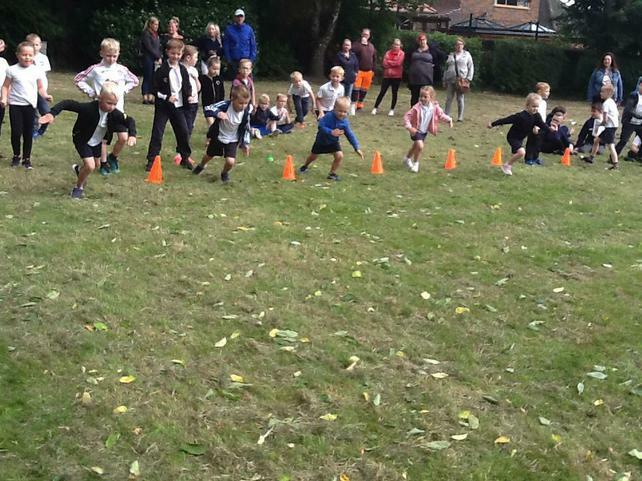 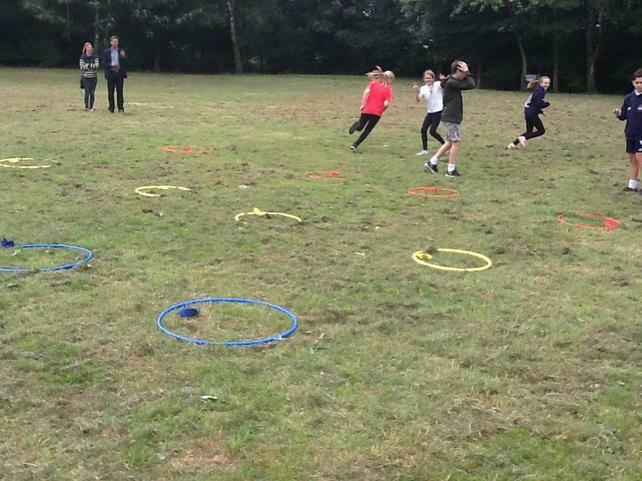 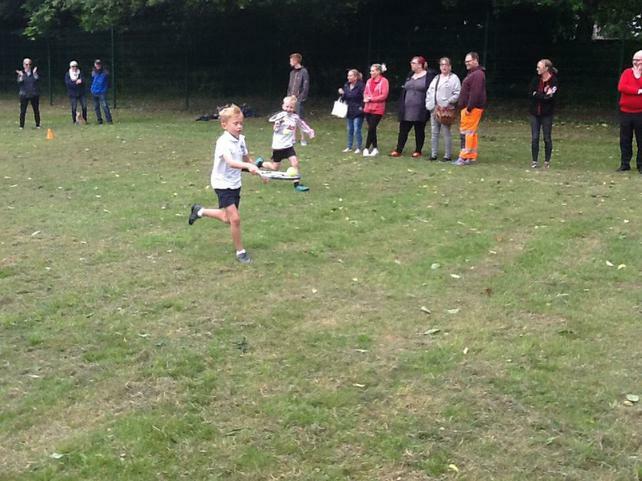 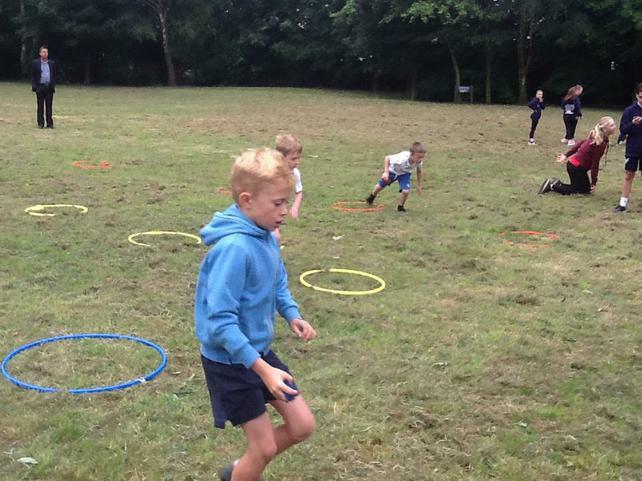 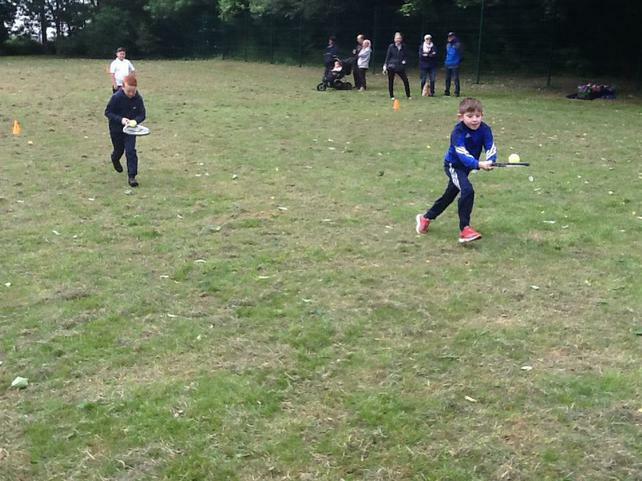 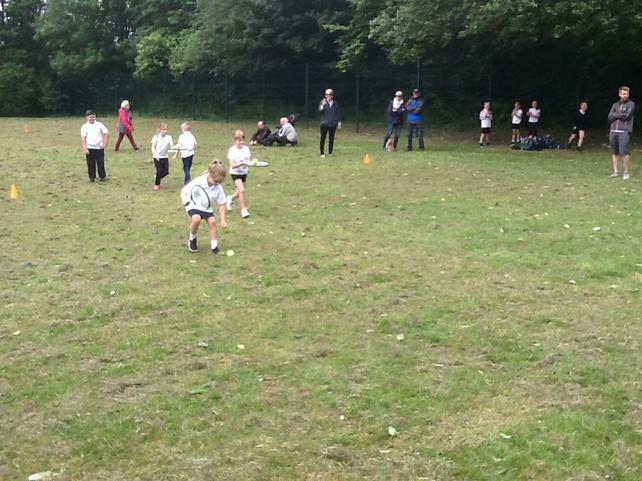 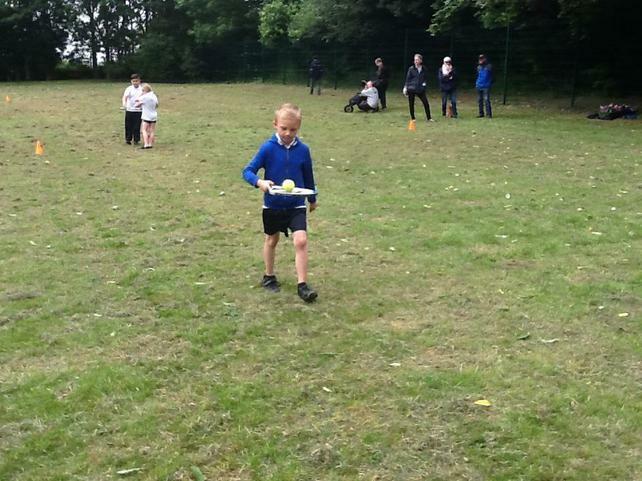 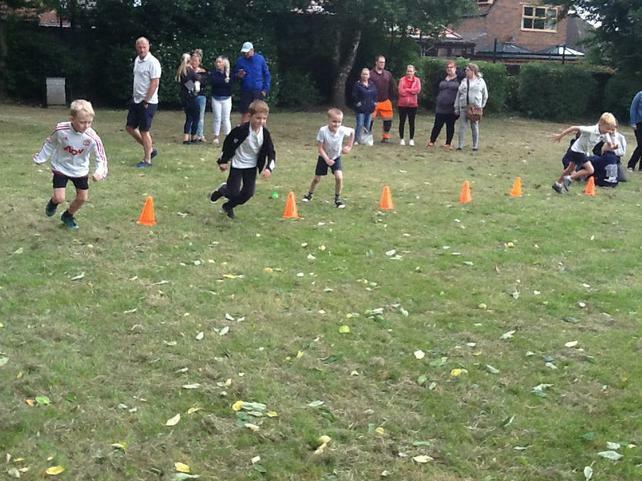 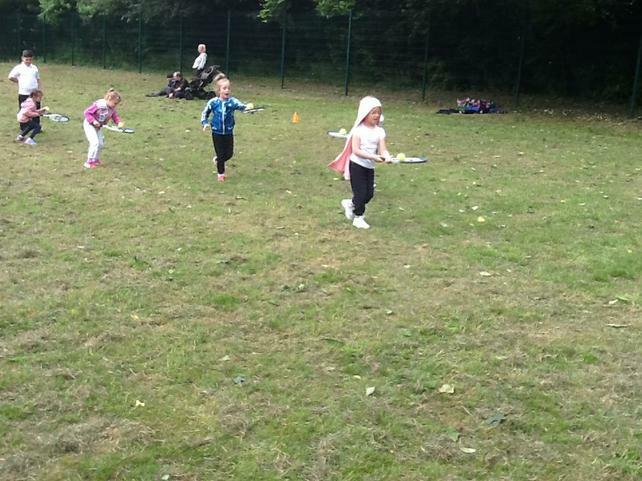 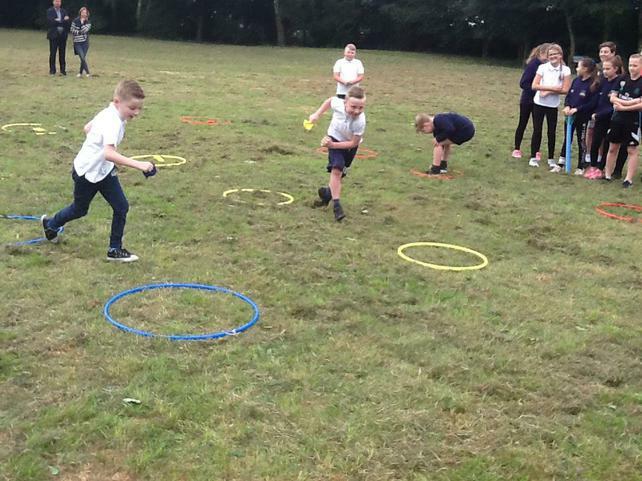 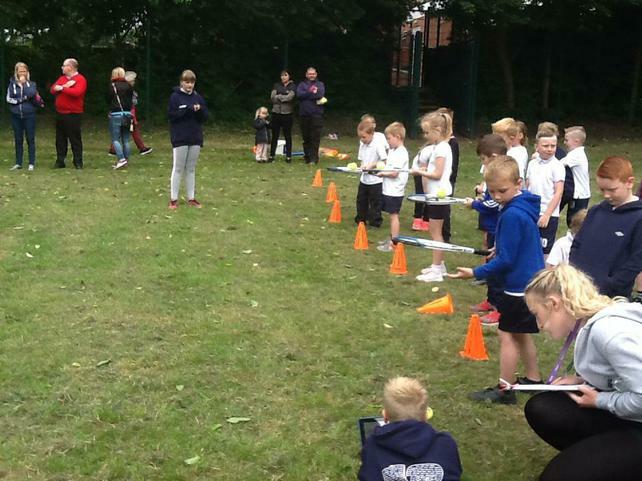 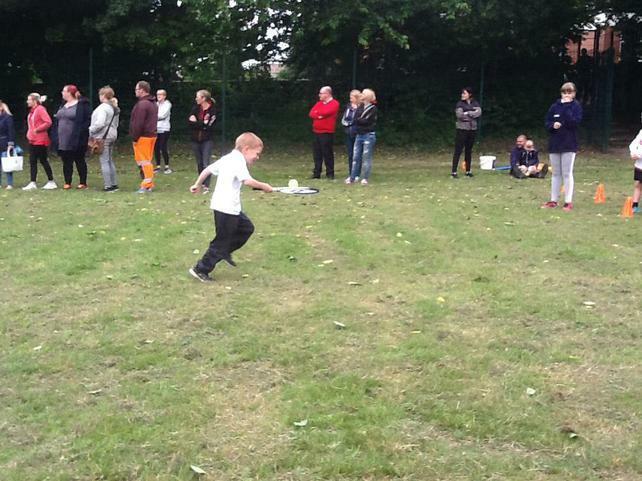 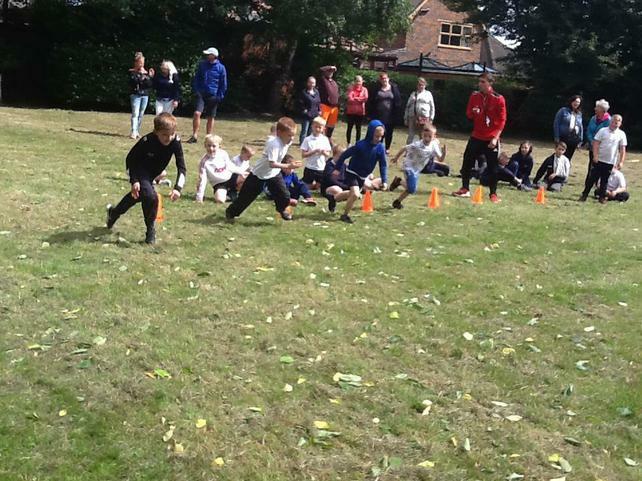 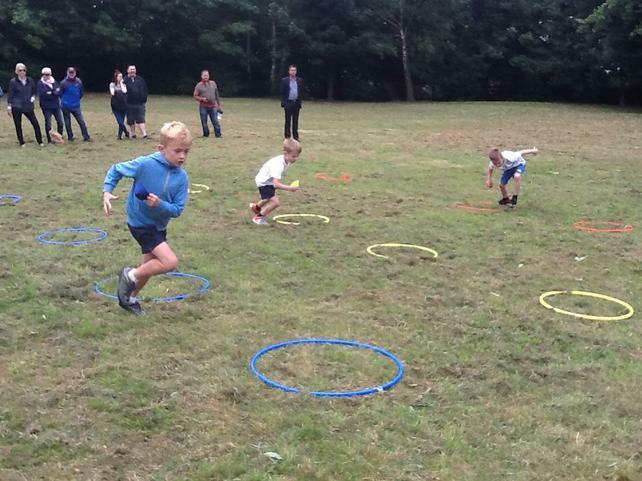 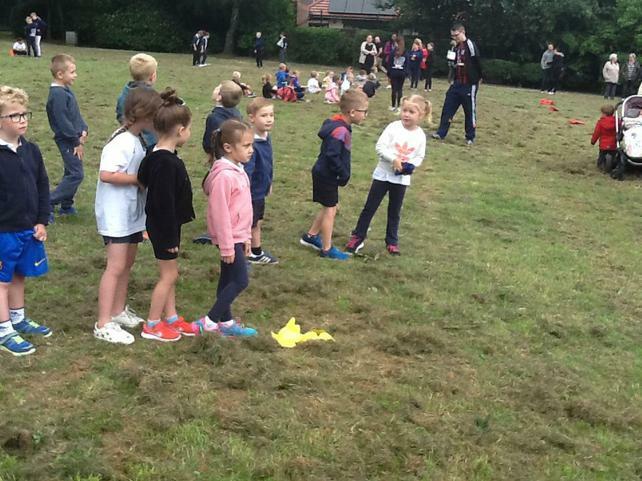 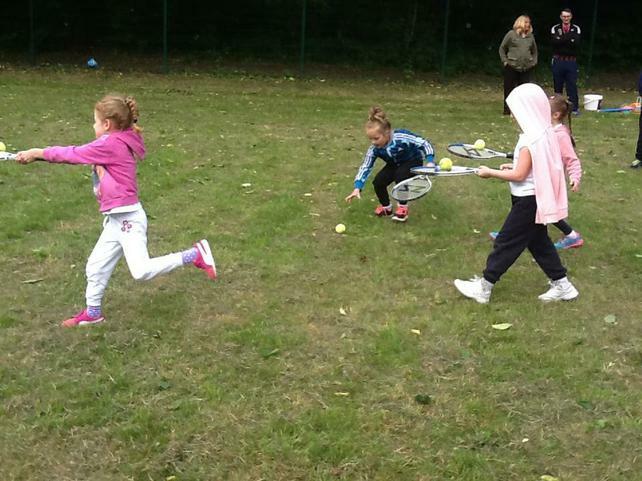 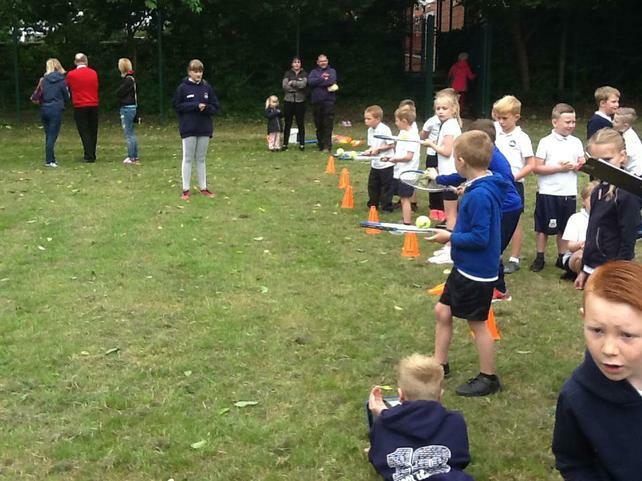 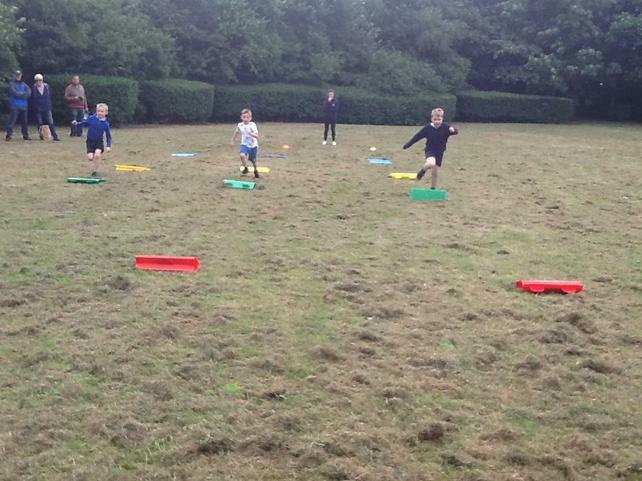 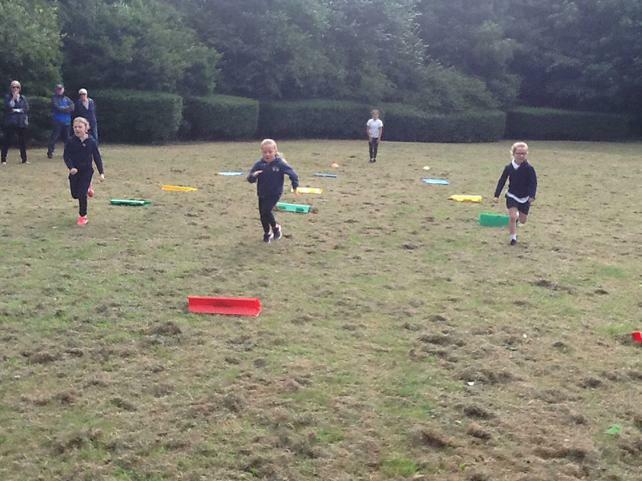 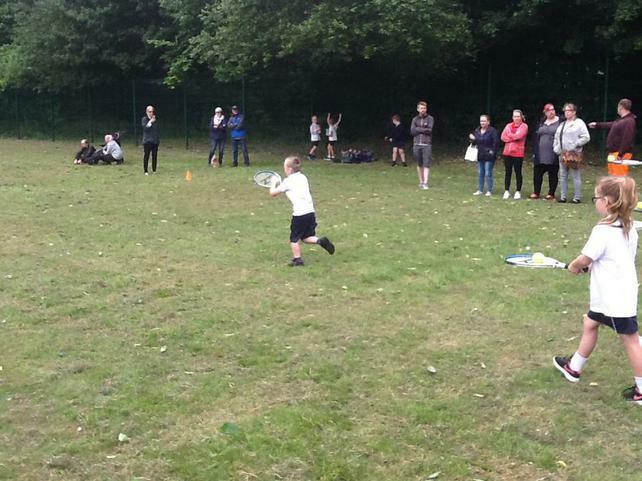 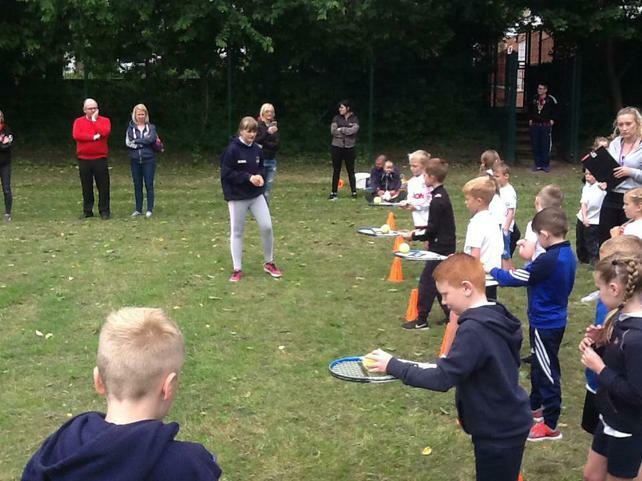 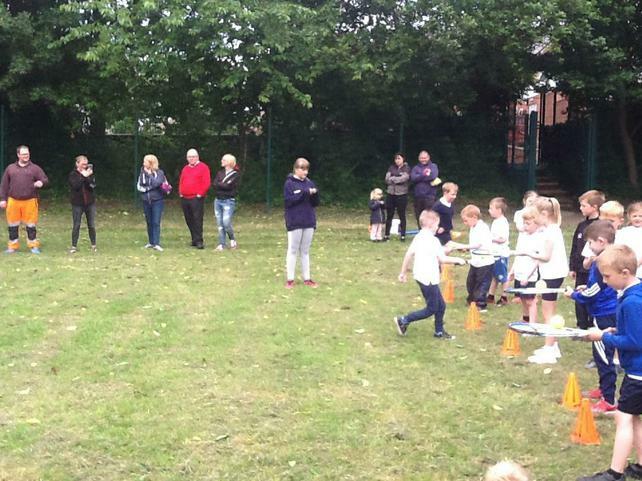 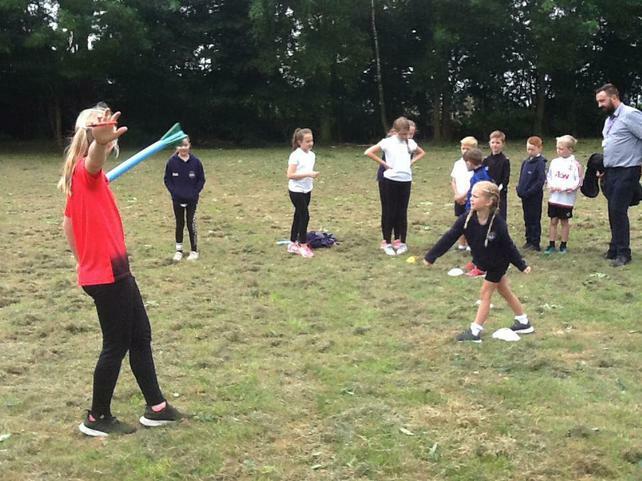 Finally, Class 2 took part in Sports Day along with Class 1 on Thursday morning and had such fun as well as showing everyone their fantastic athletic ability, take a look at some of our excellent photos below! 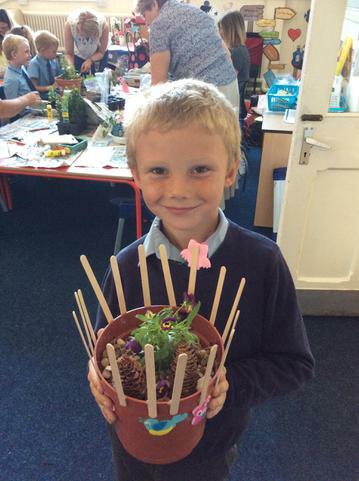 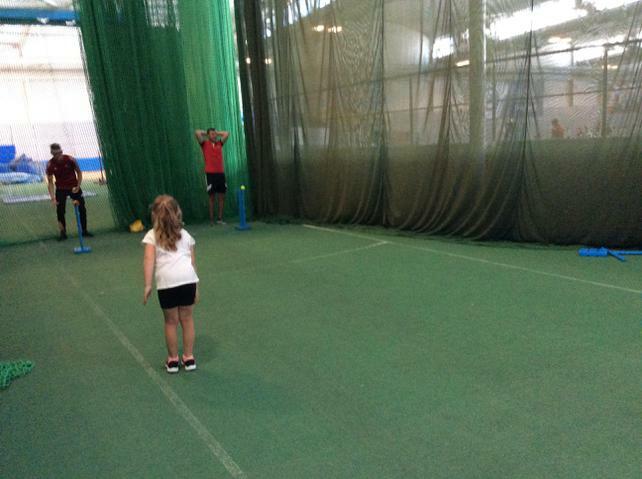 Wonderful work everyone, what a fantastic first week back!